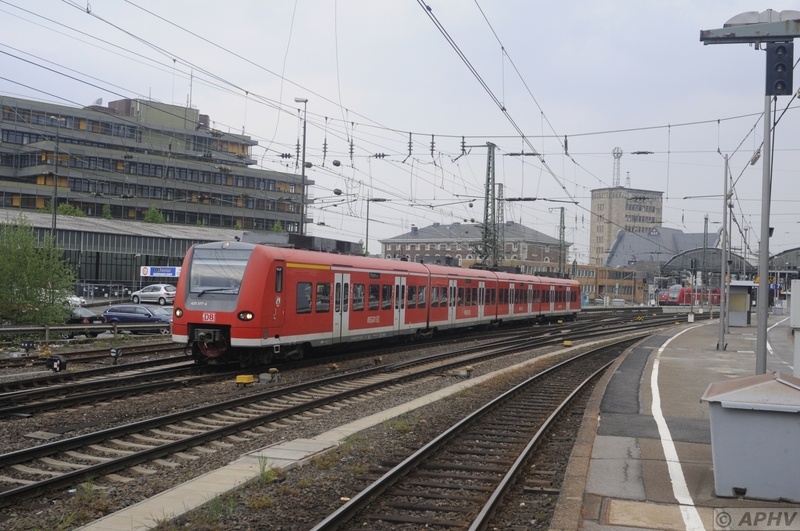 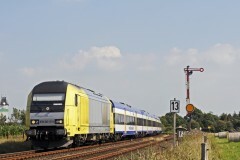 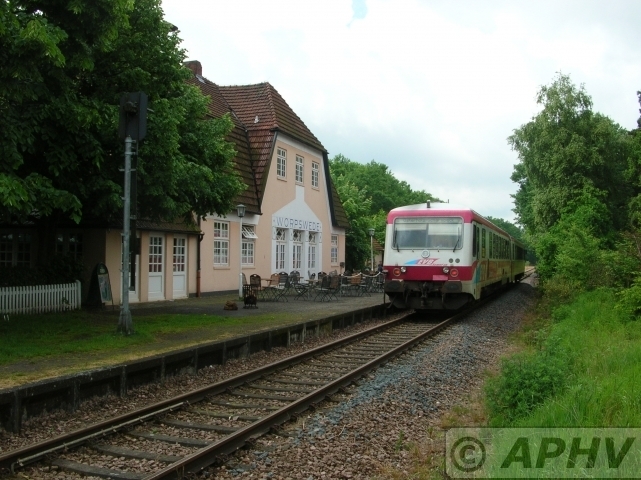 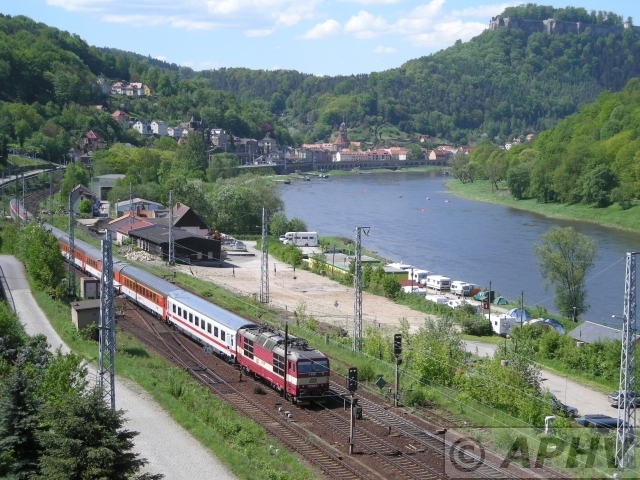 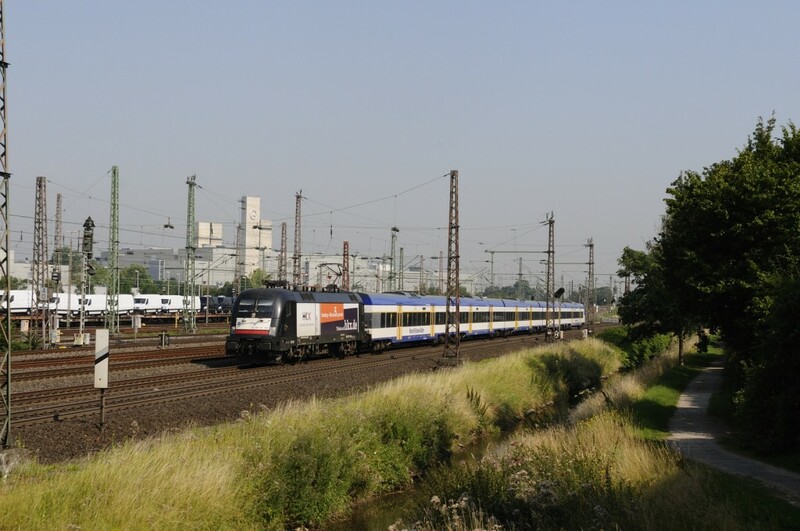 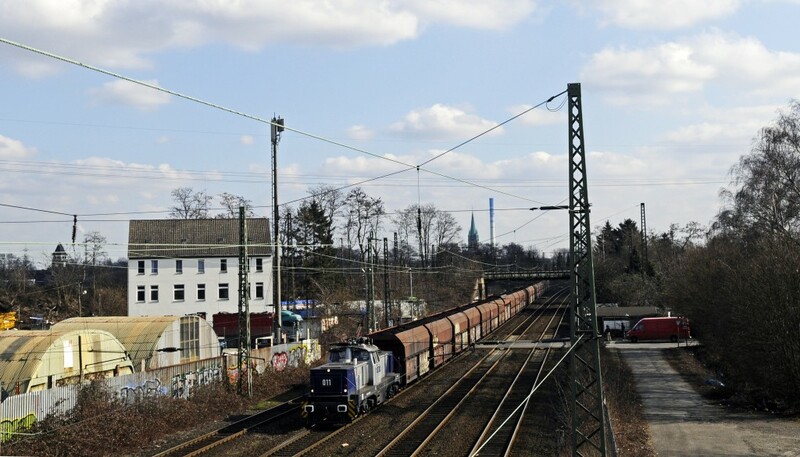 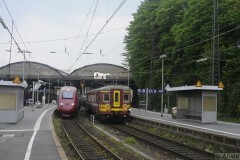 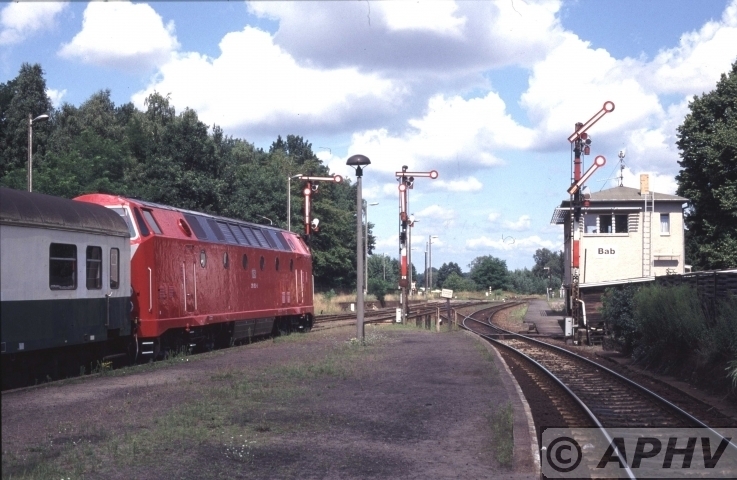 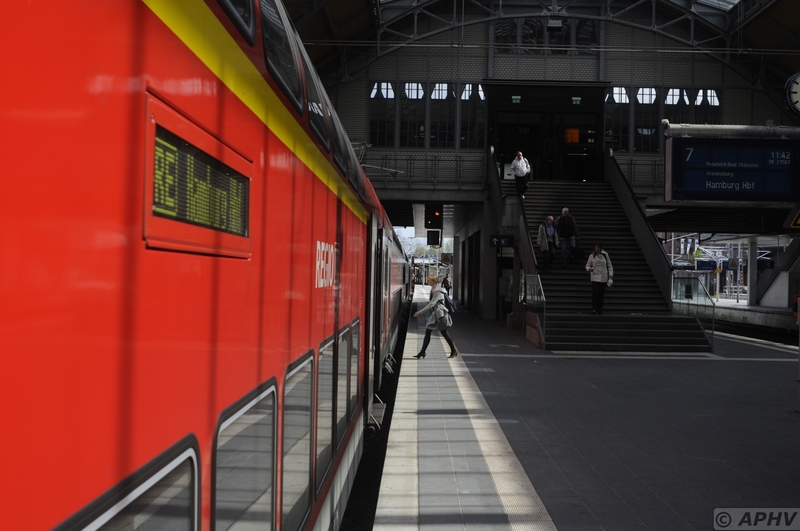 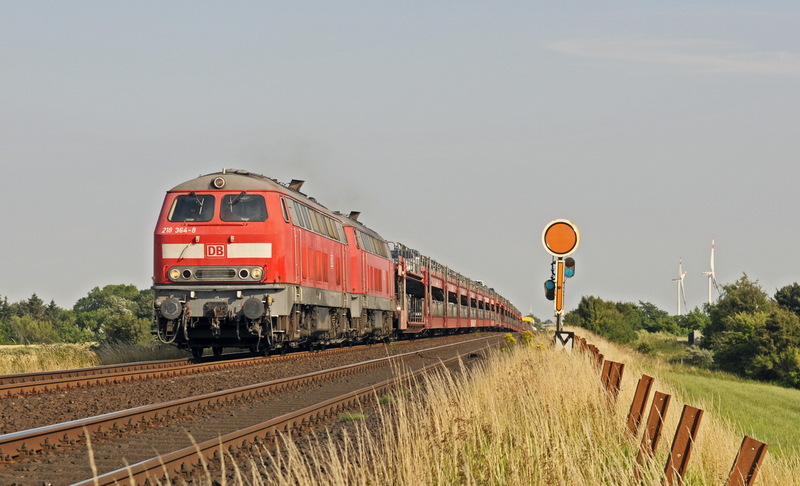 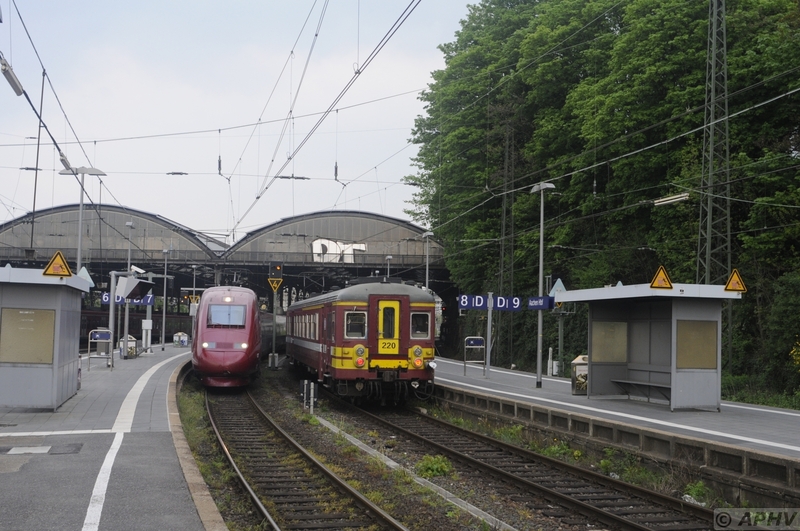 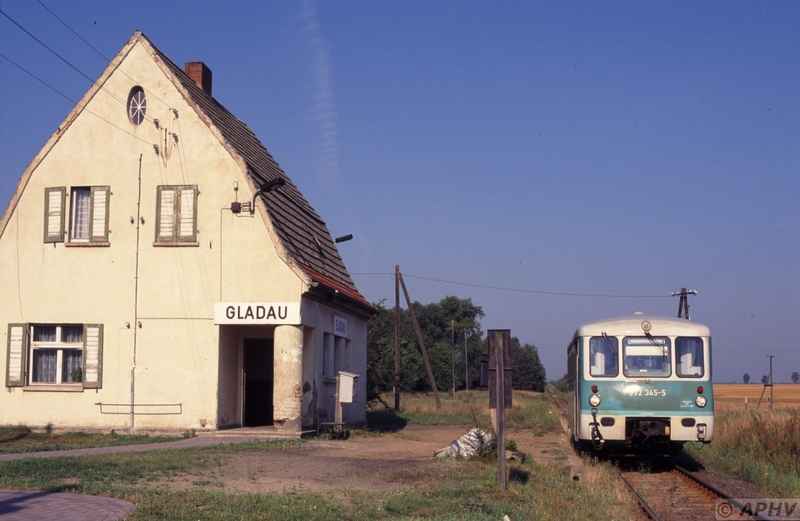 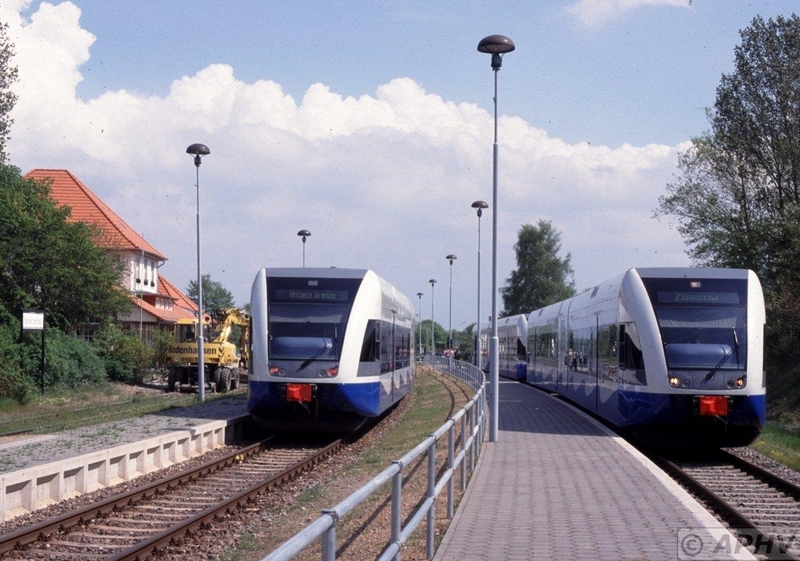 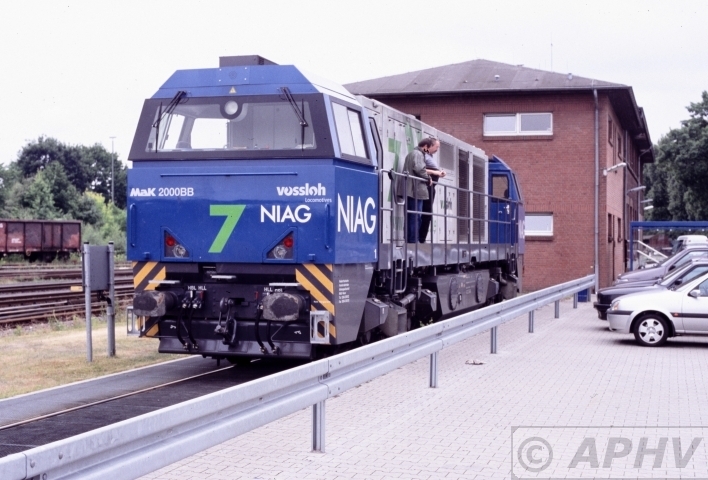 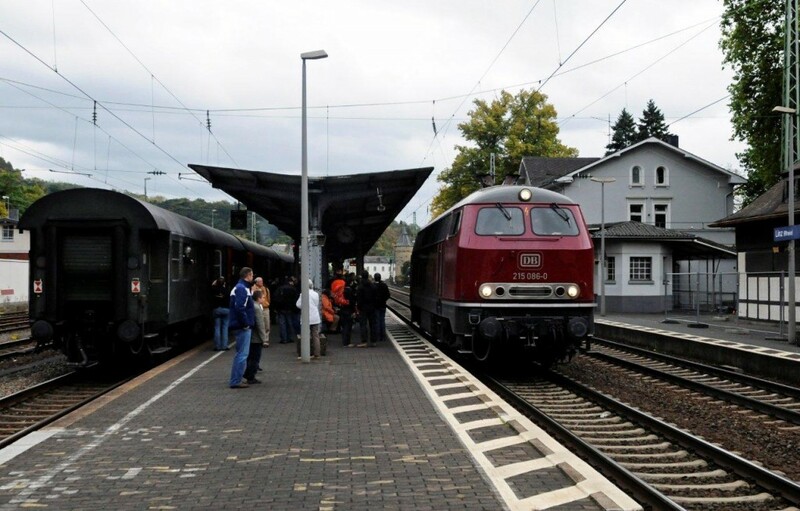 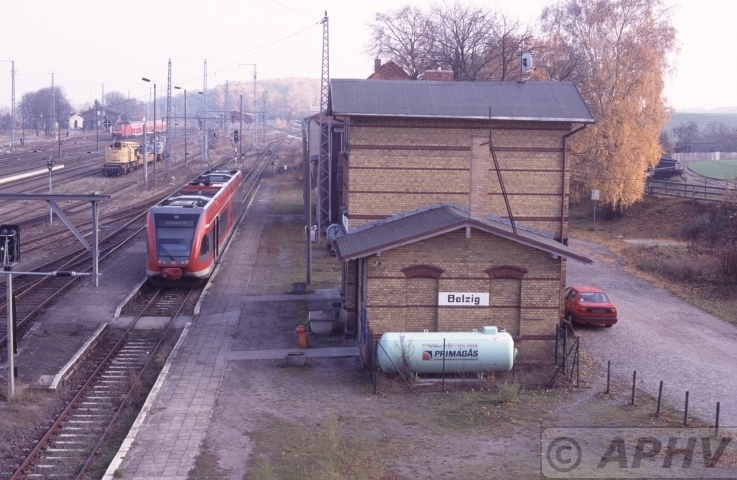 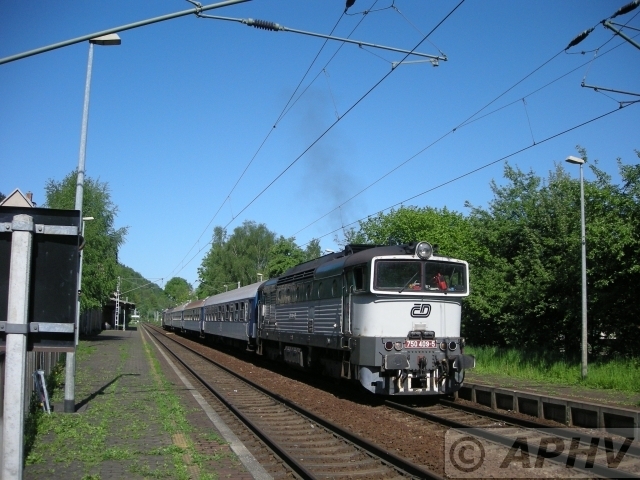 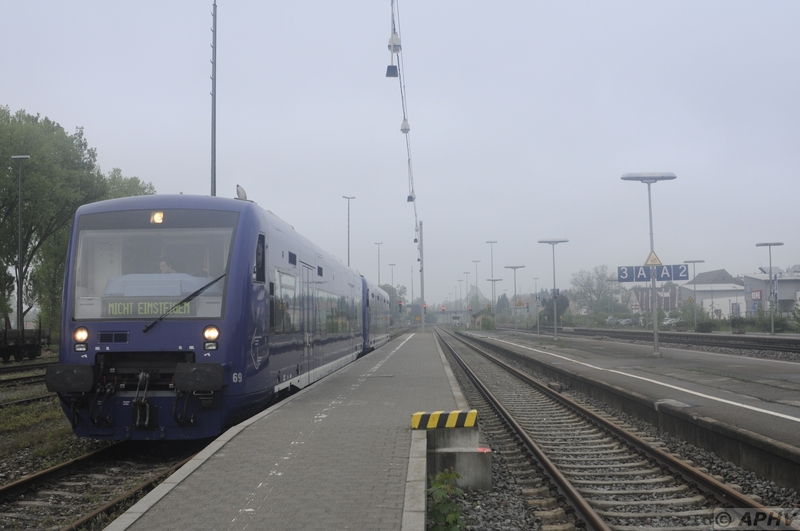 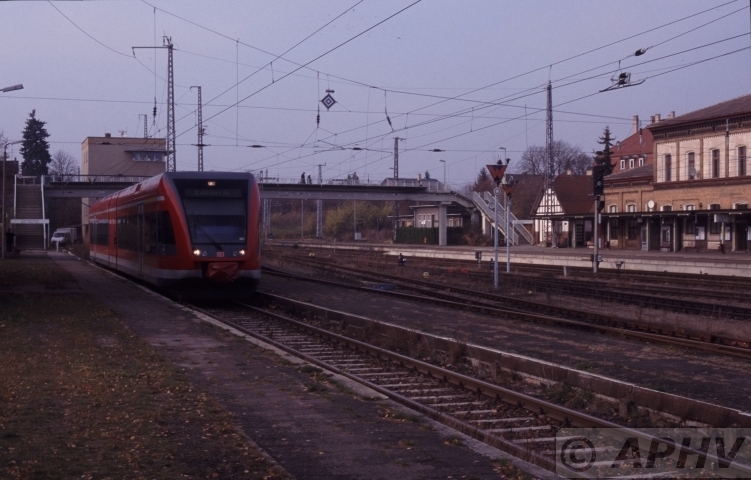 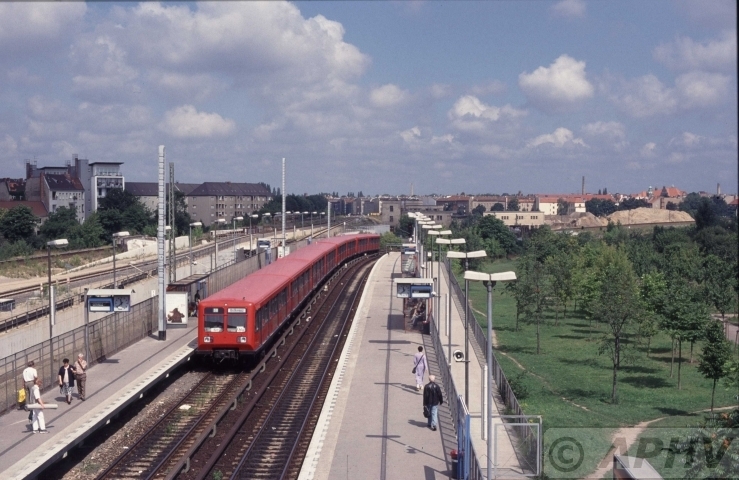 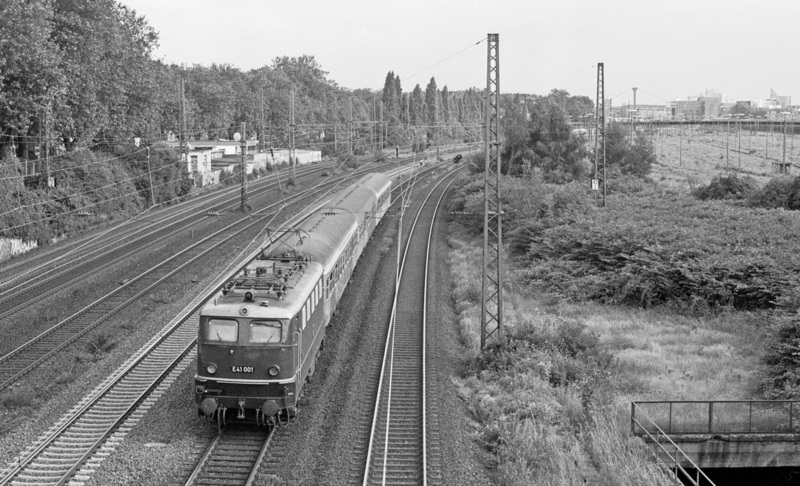 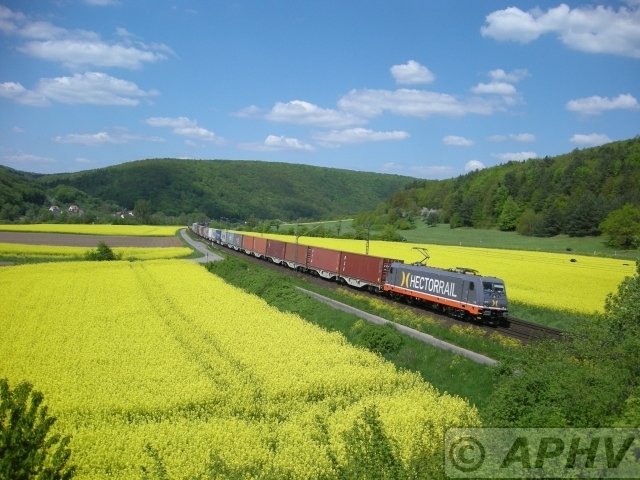 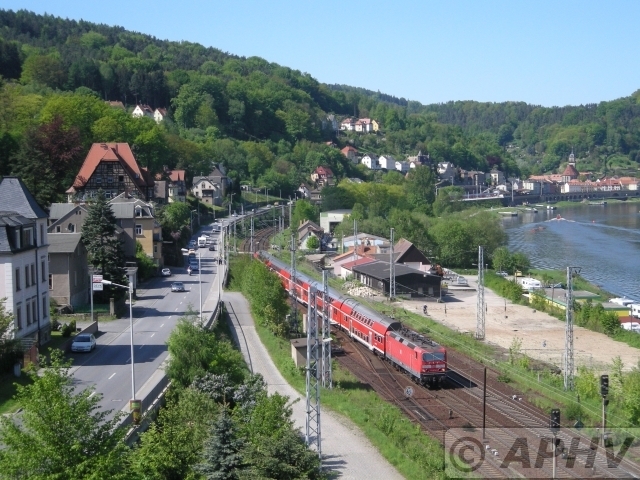 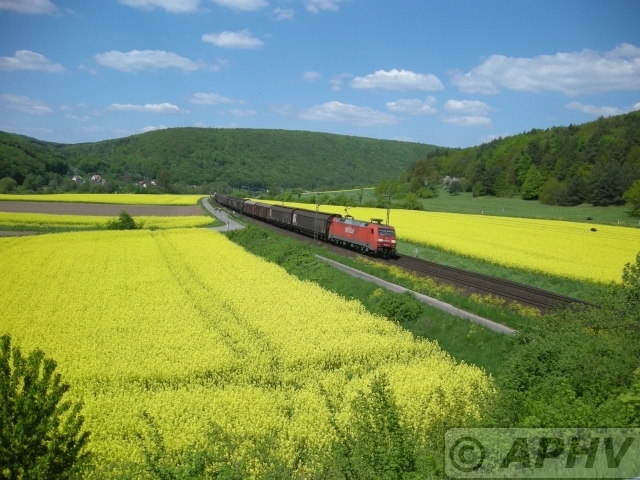 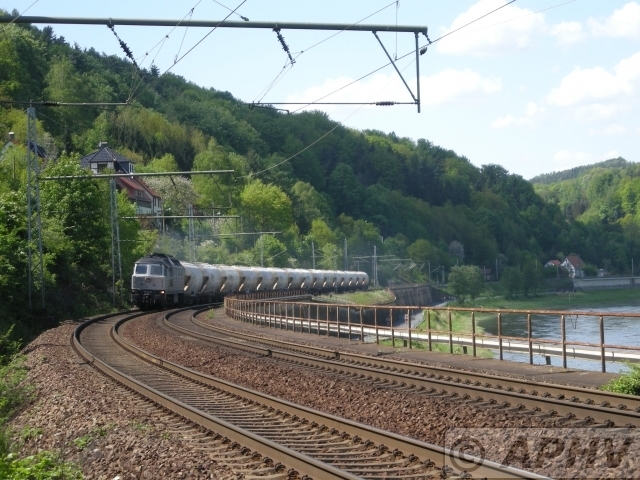 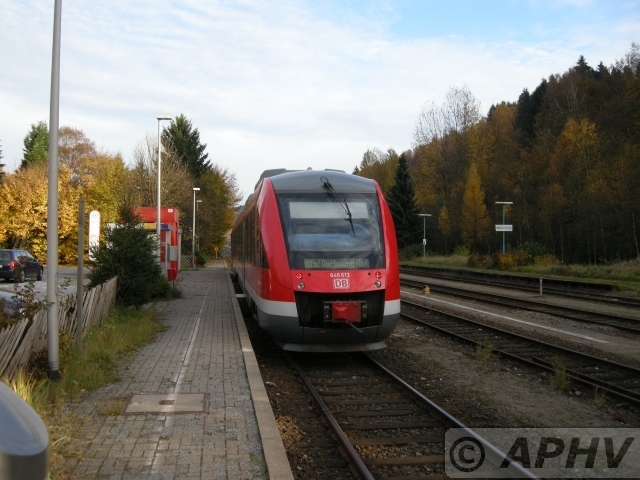 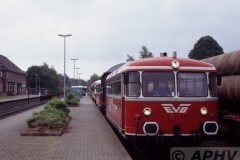 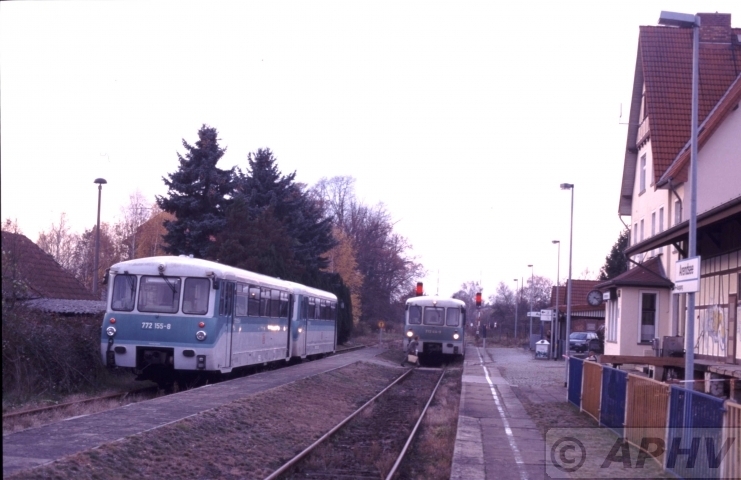 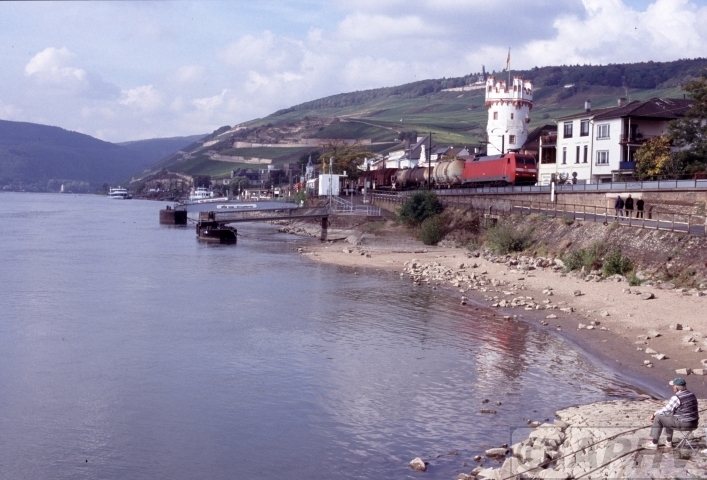 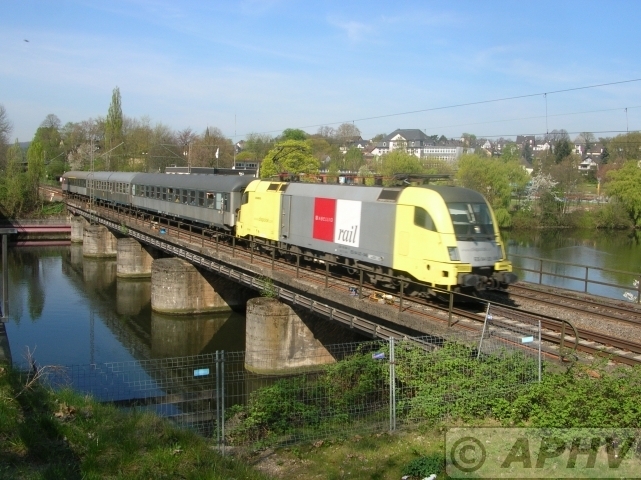 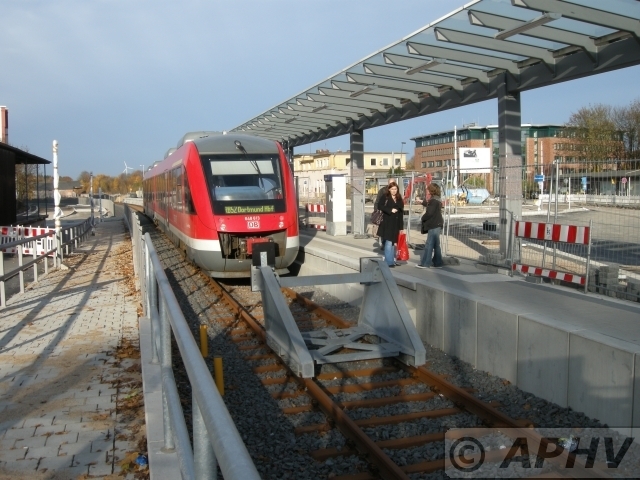 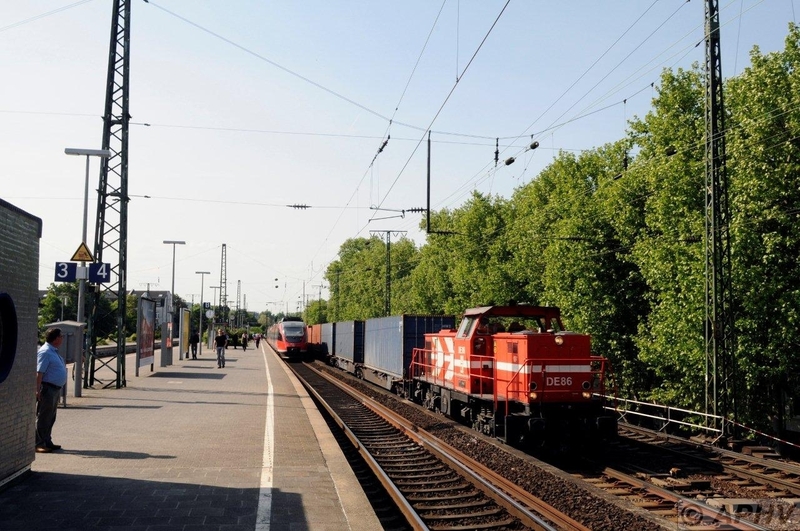 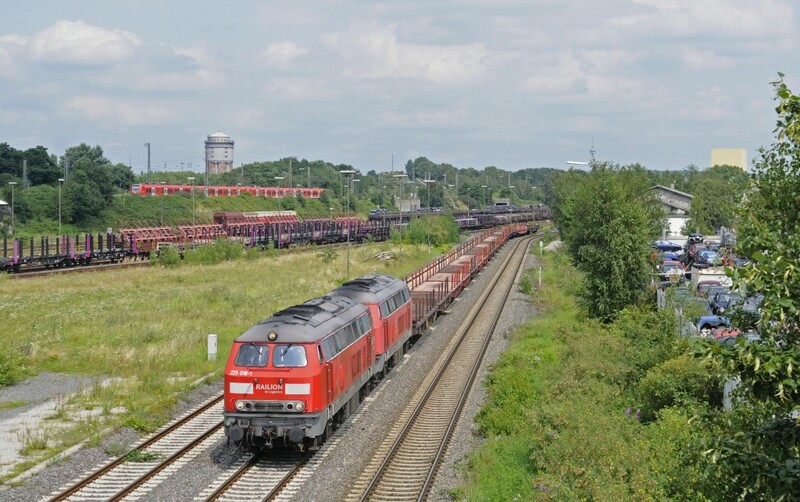 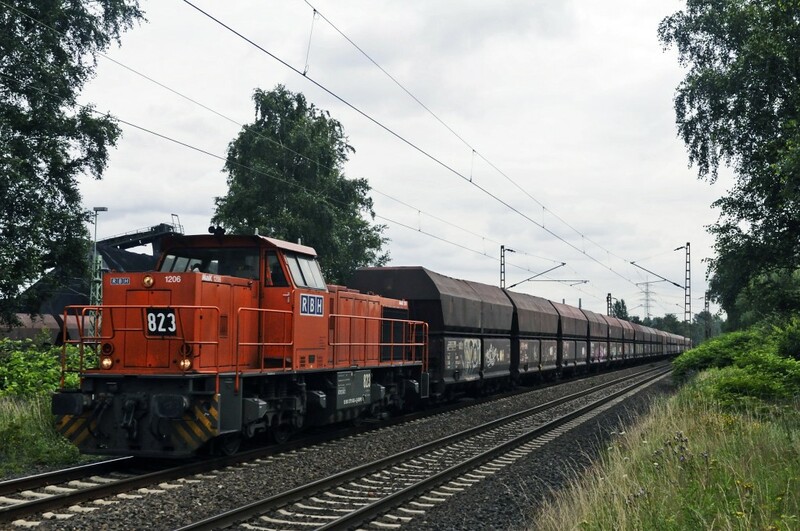 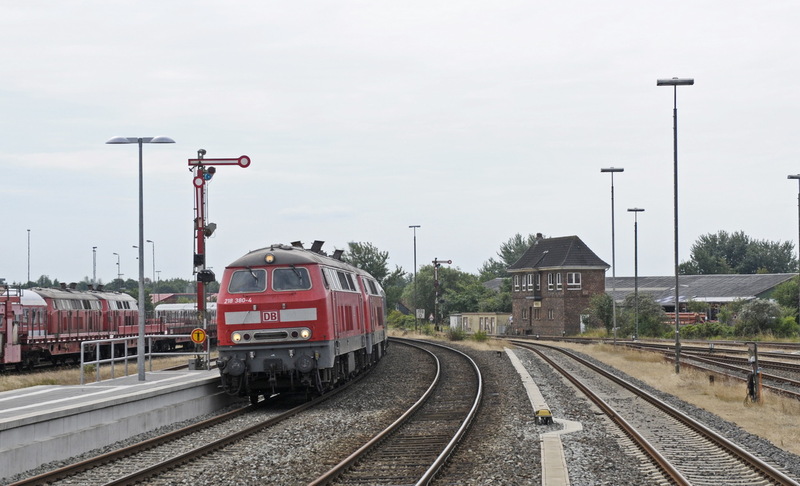 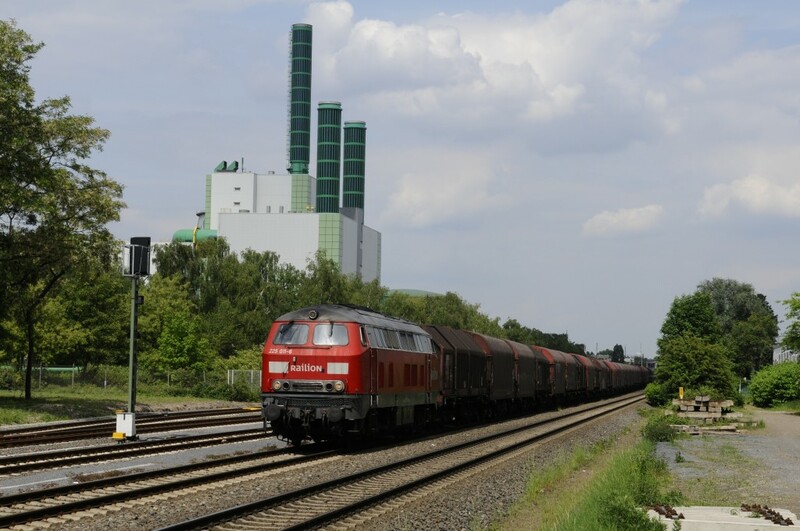 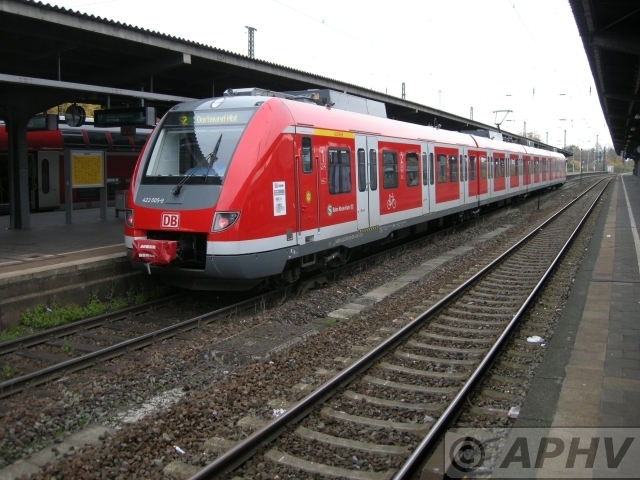 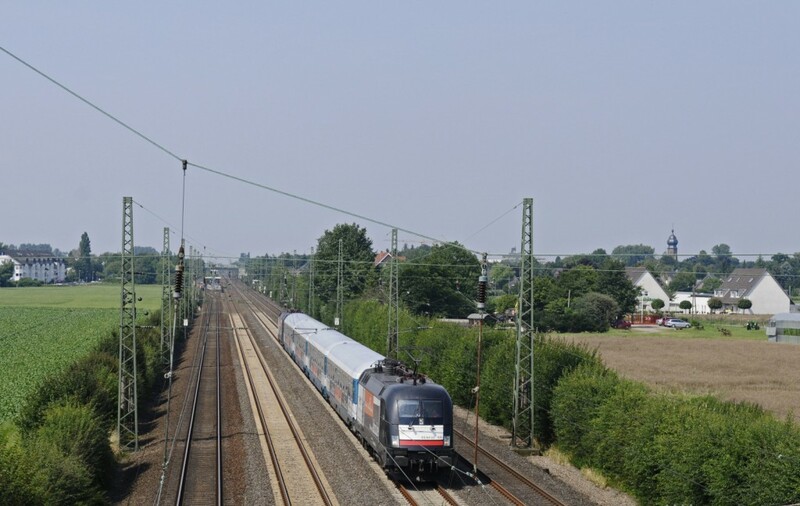 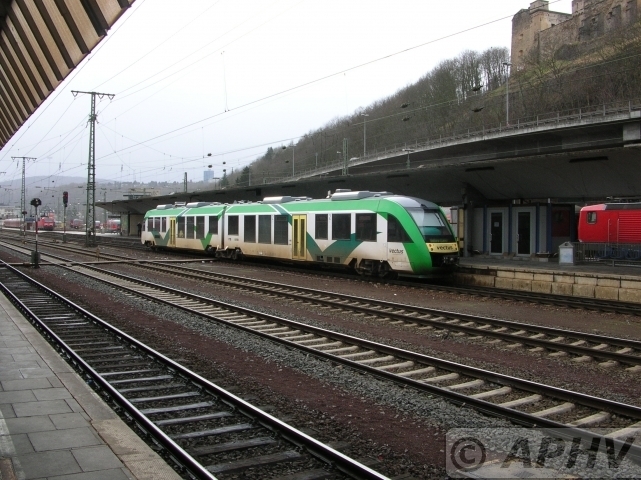 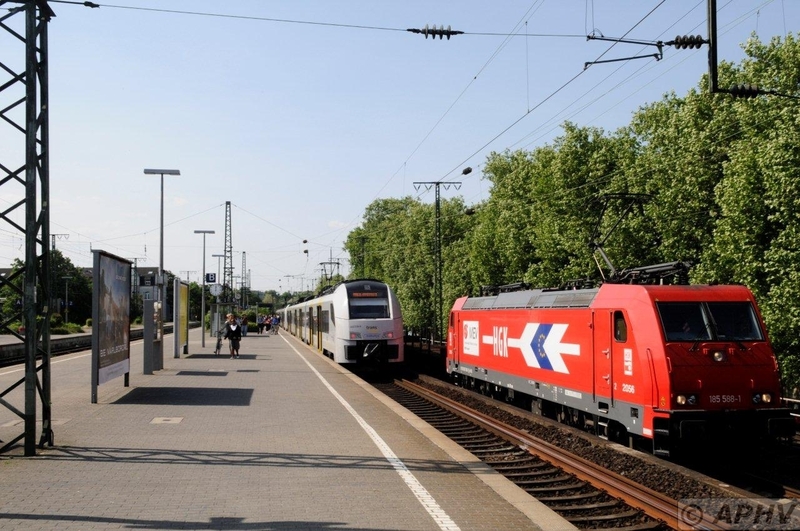 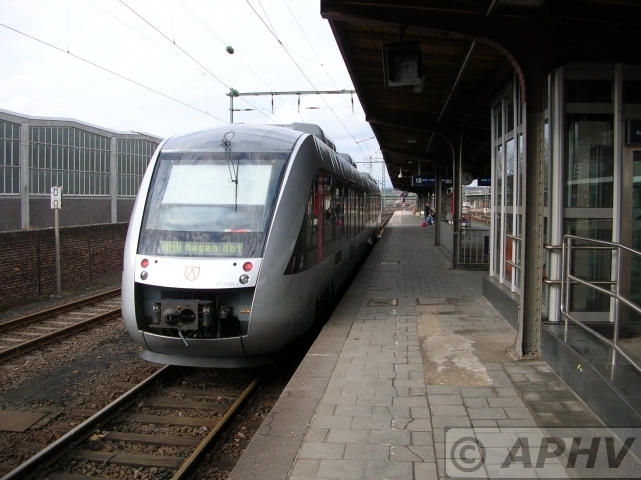 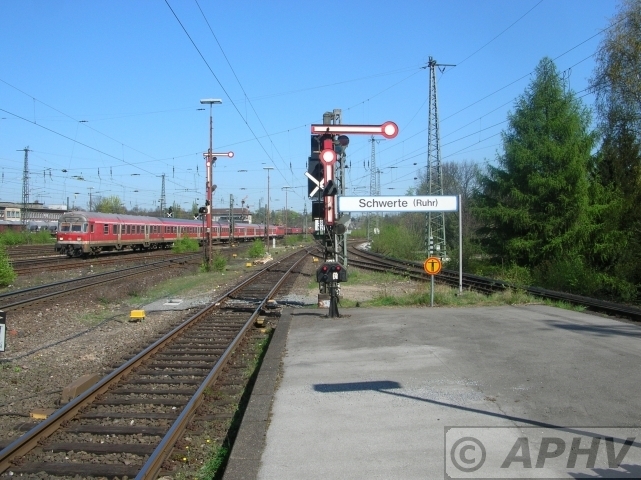 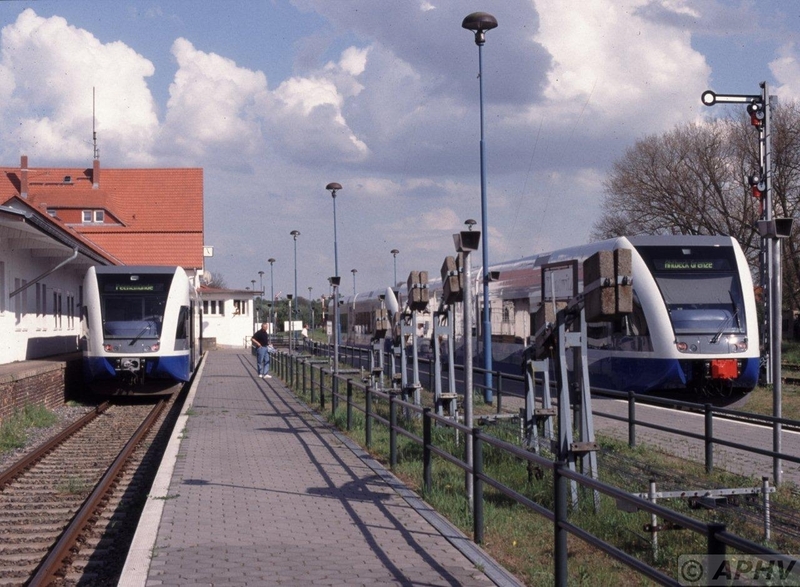 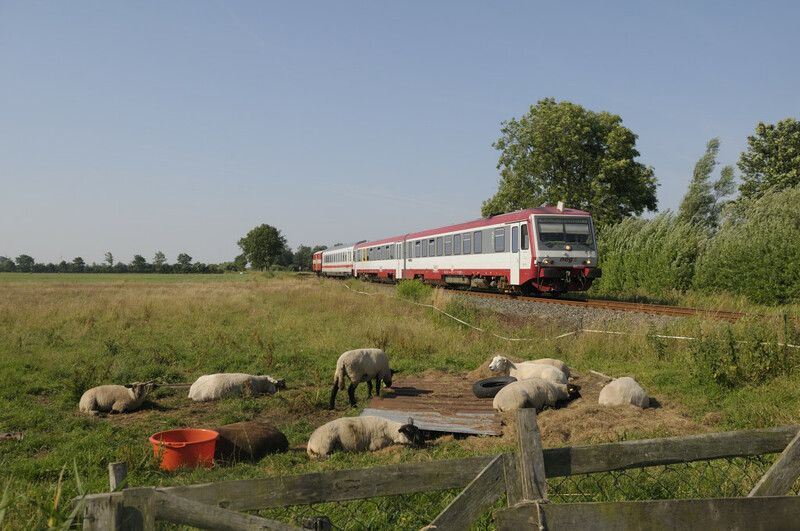 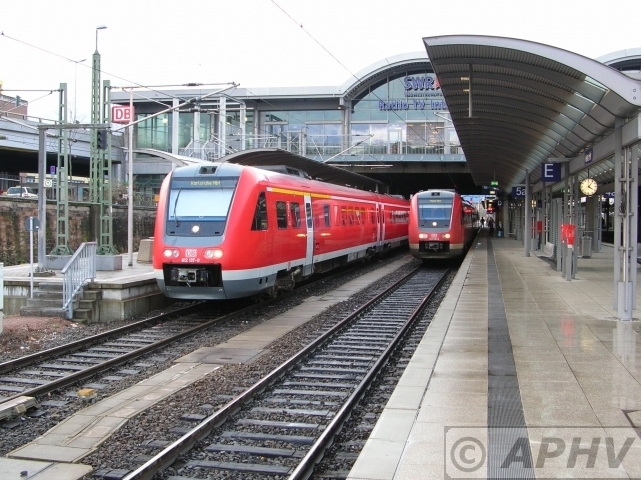 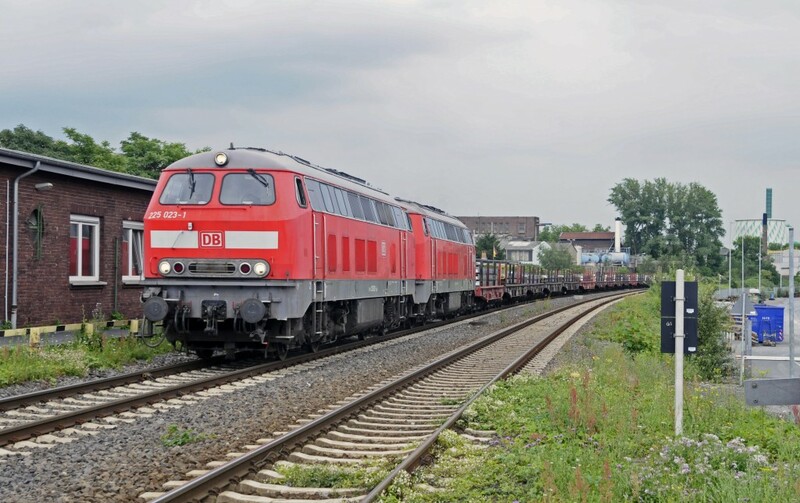 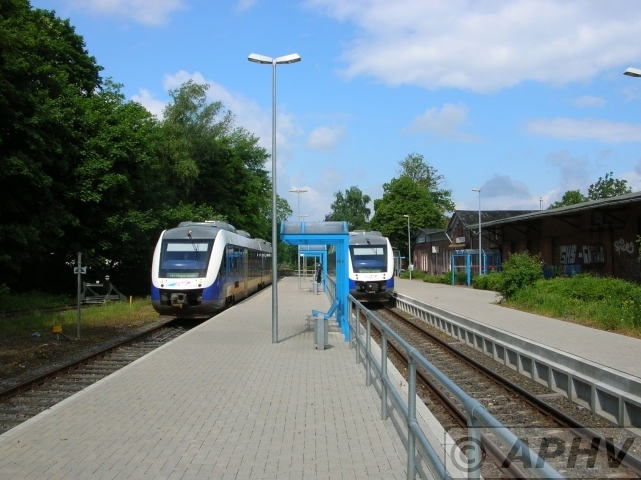 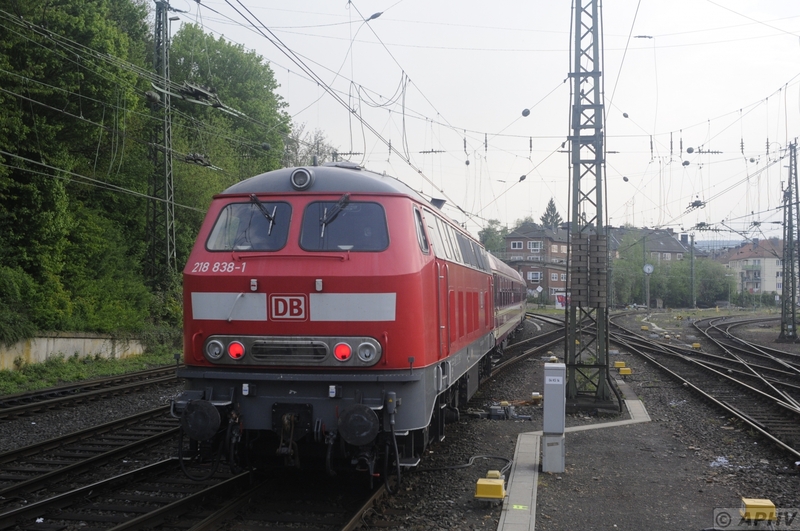 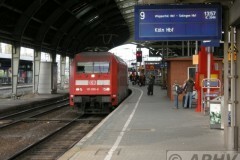 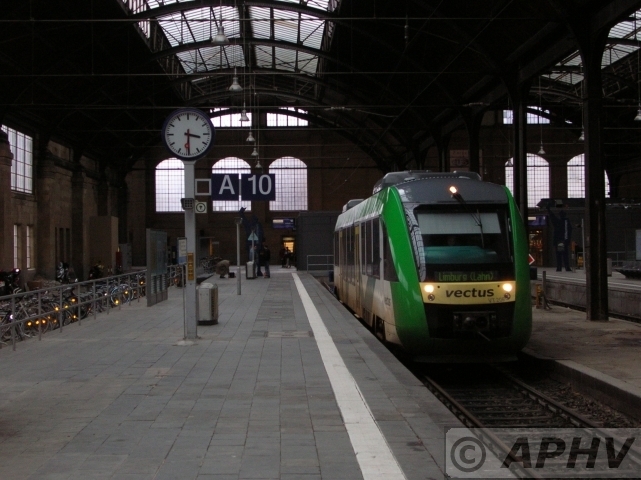 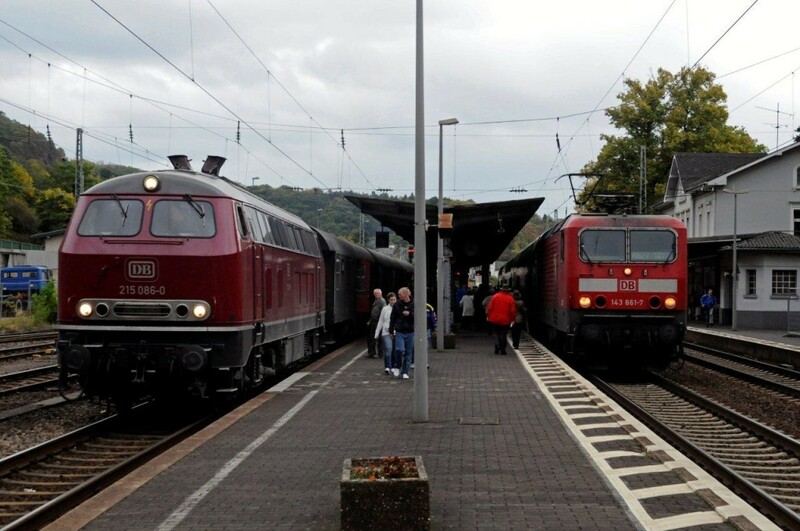 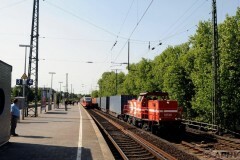 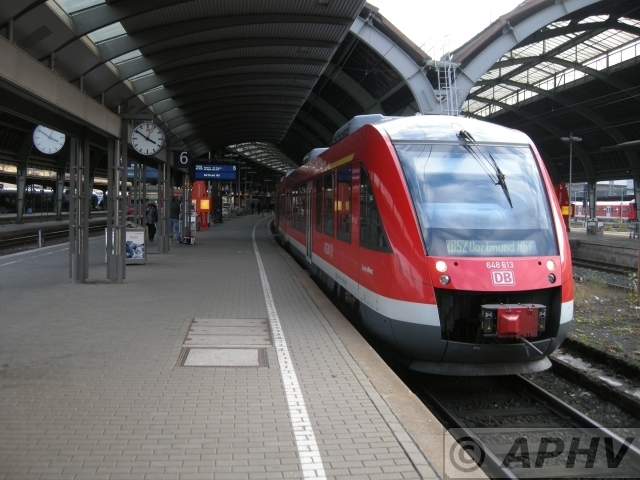 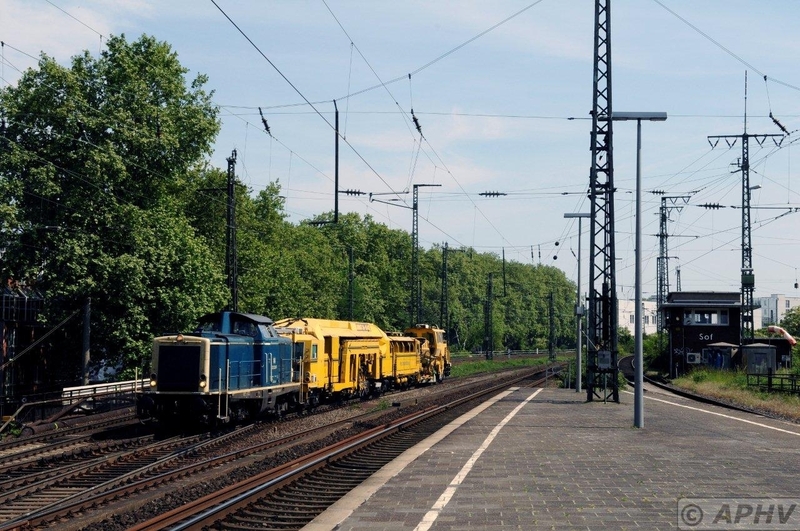 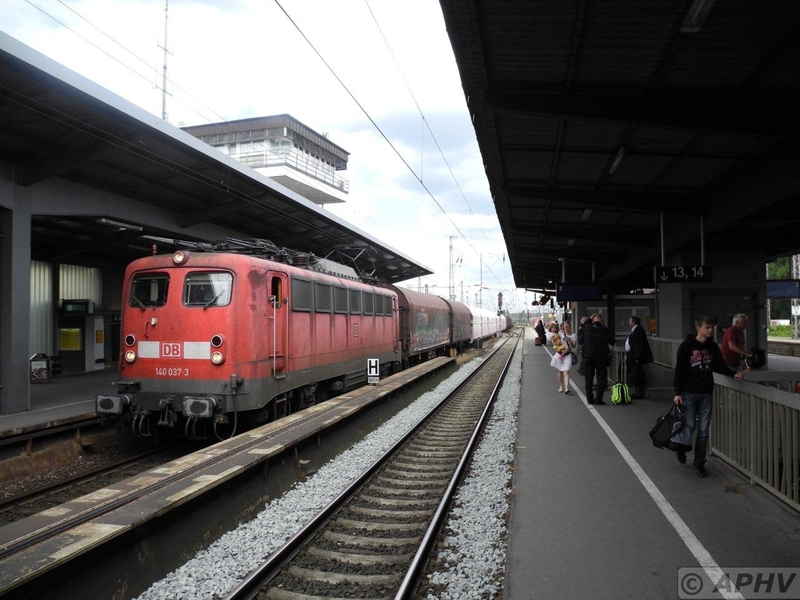 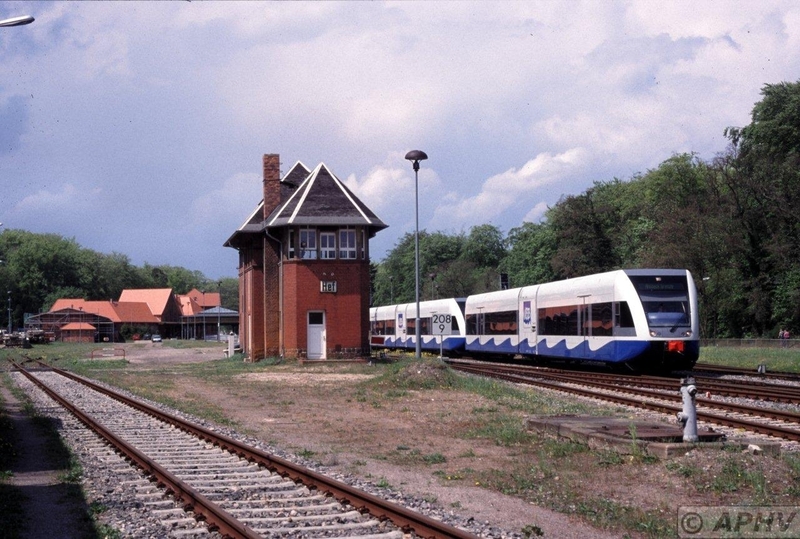 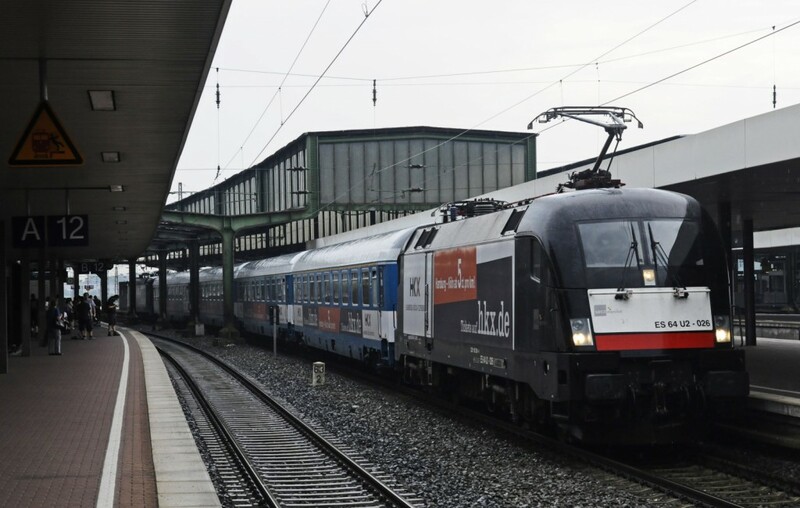 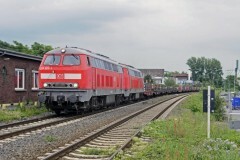 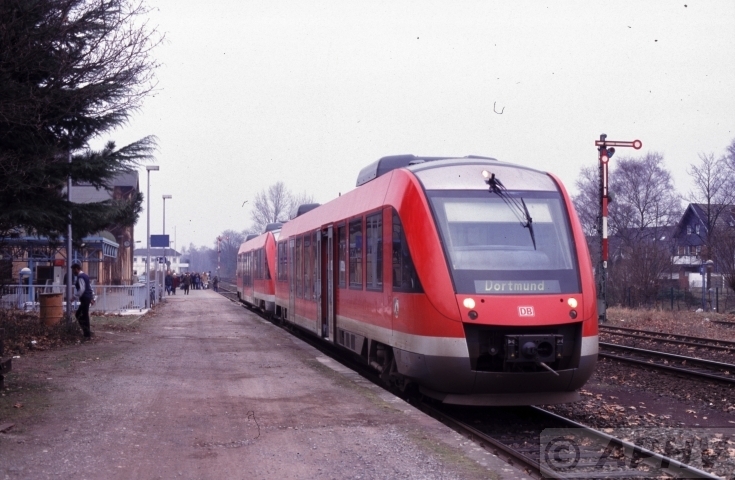 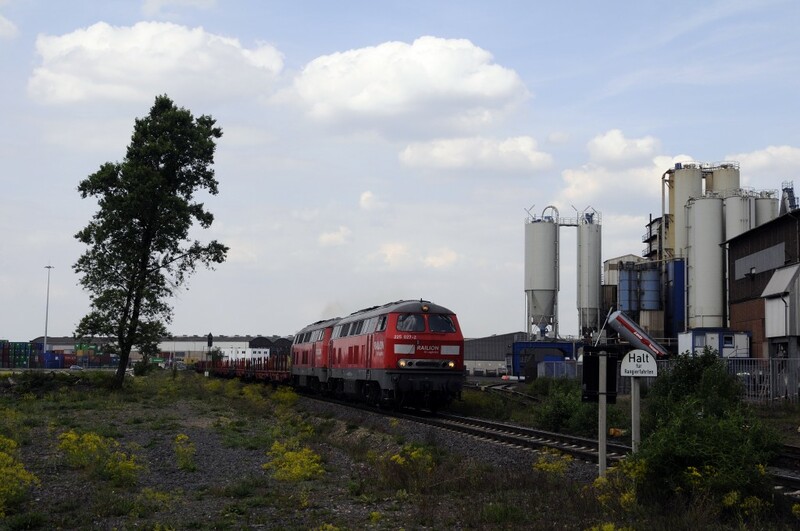 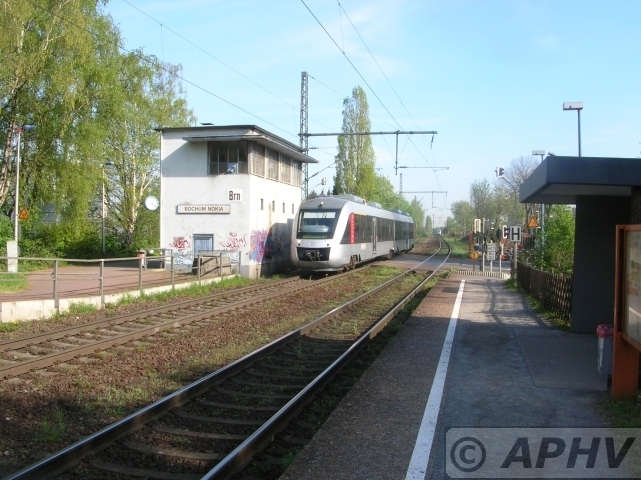 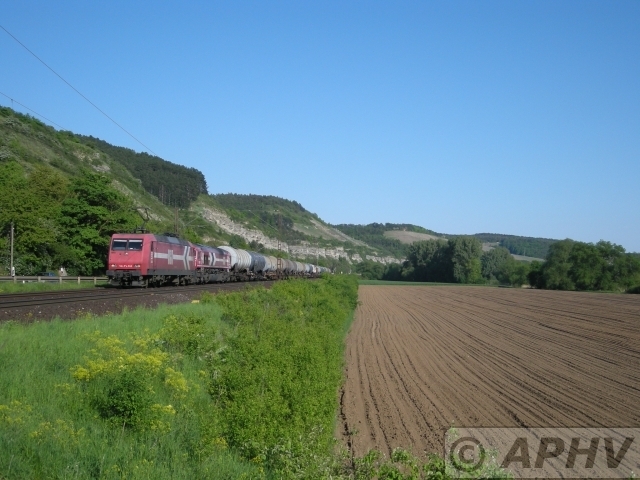 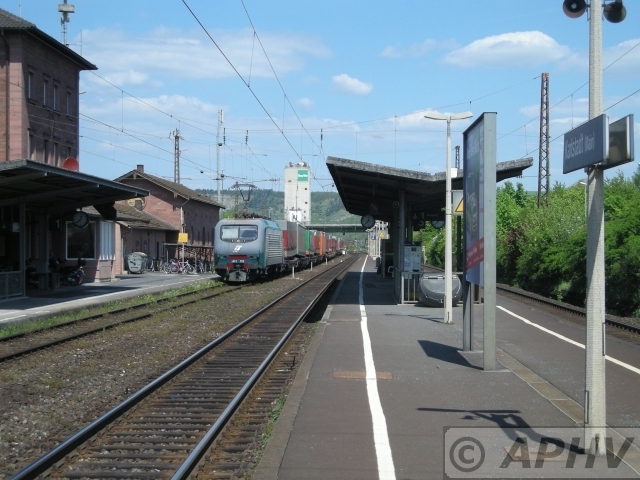 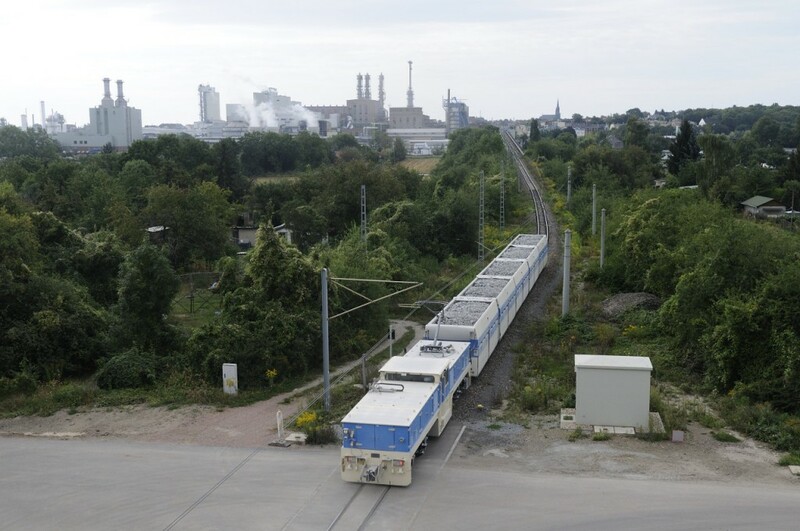 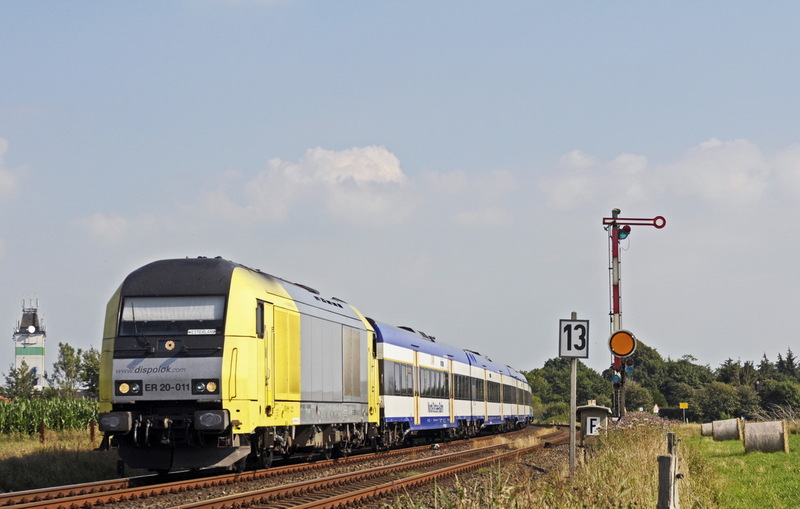 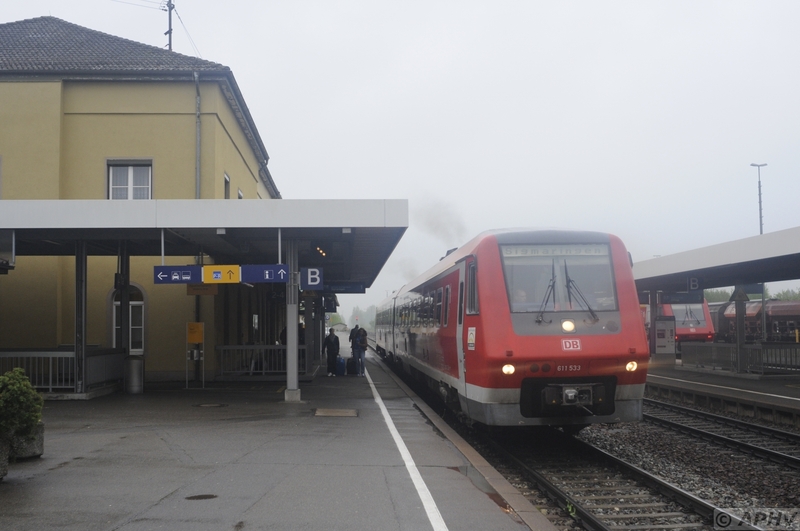 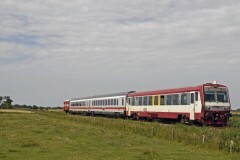 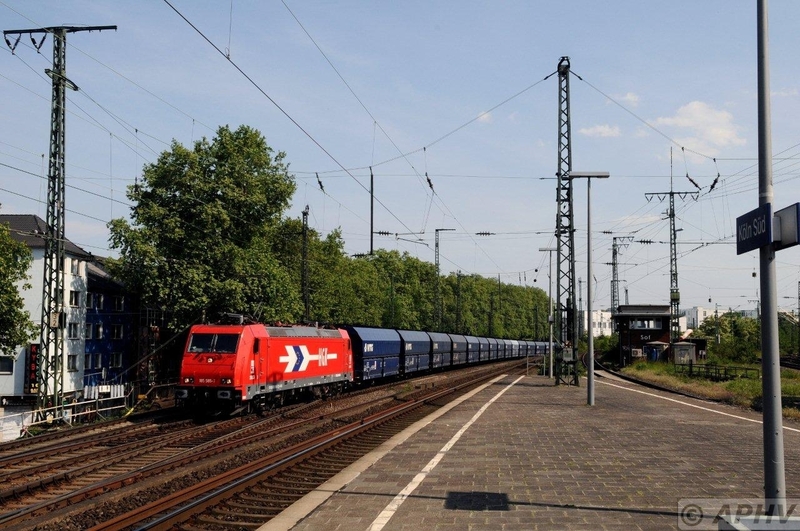 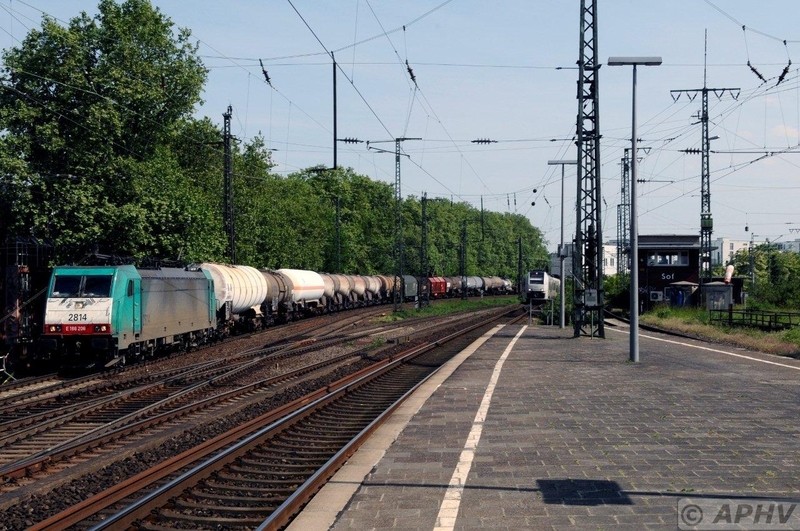 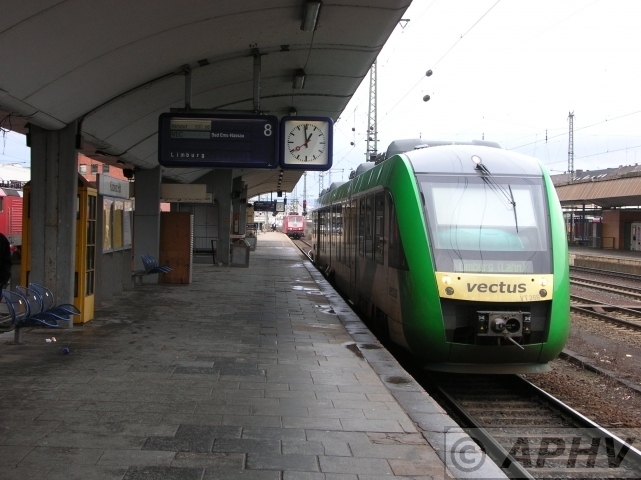 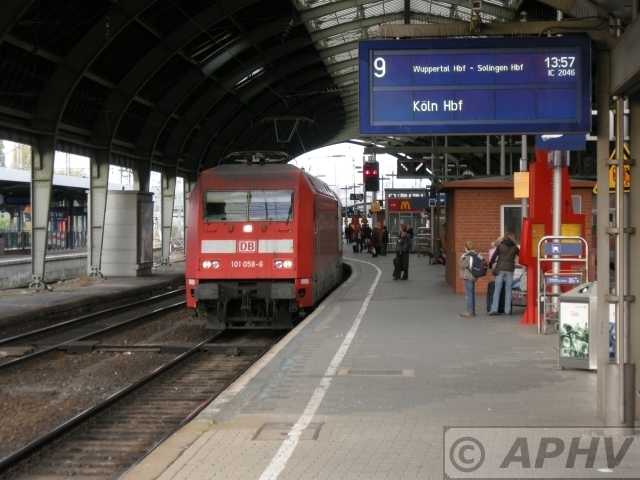 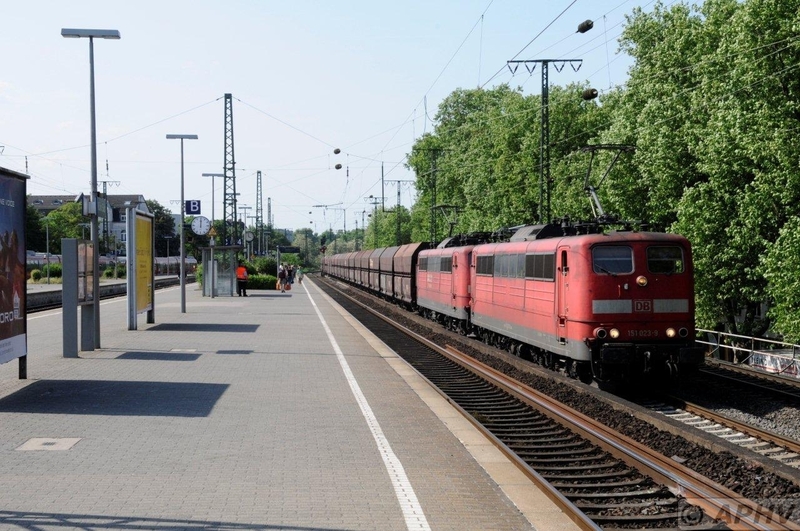 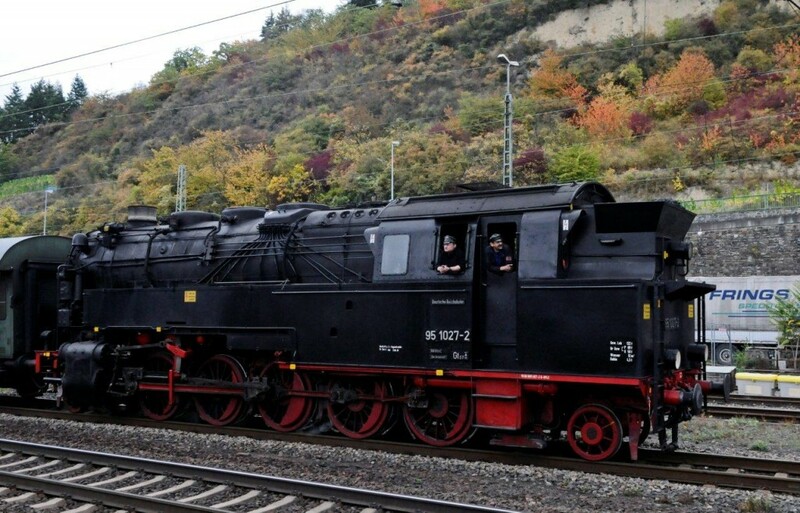 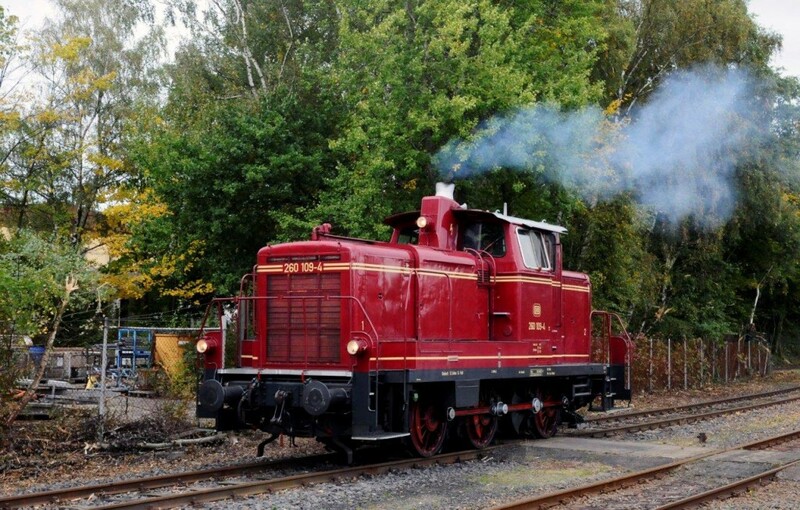 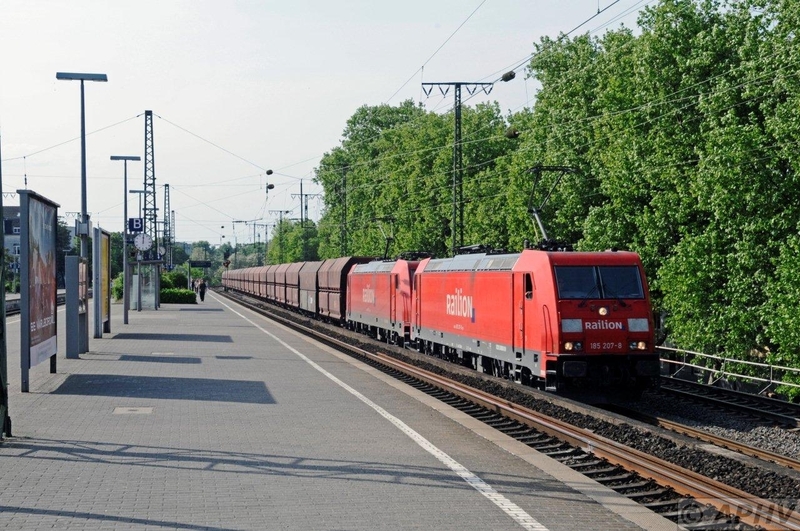 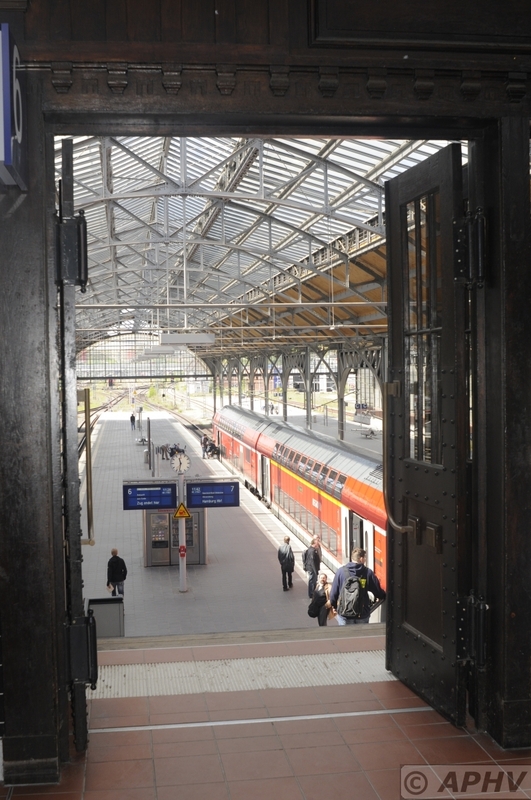 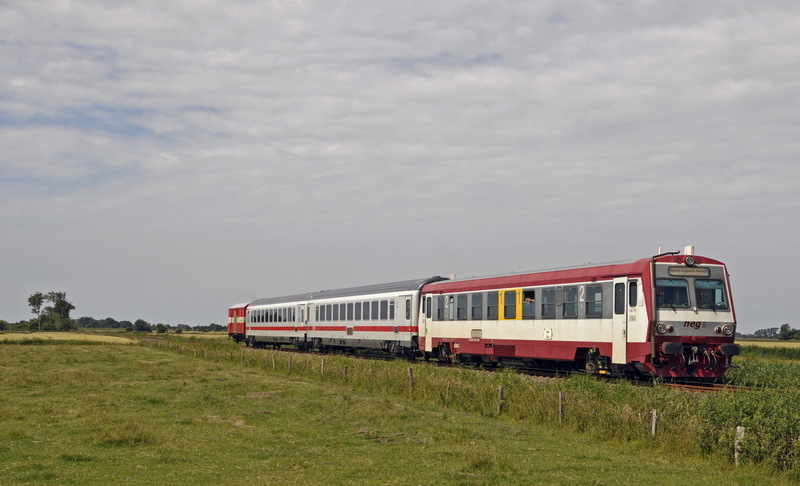 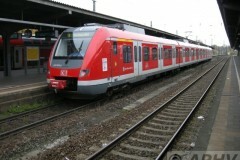 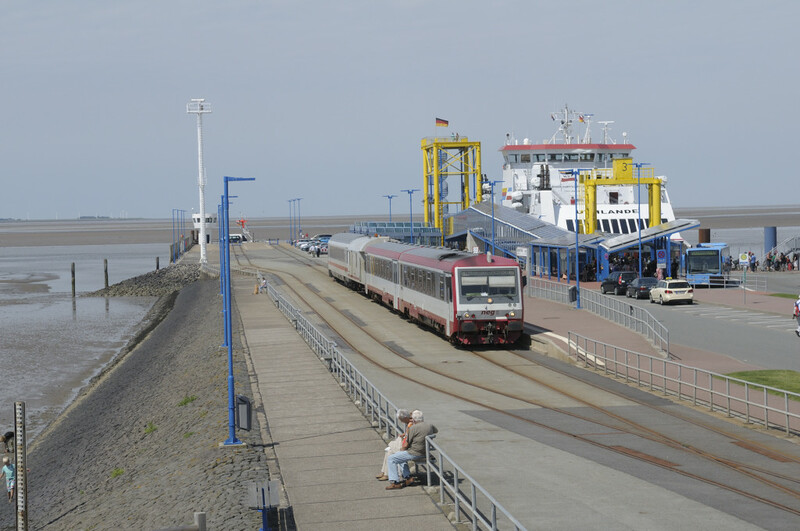 The Geilenkirchen Kreisbahn (district railway) was an almost 38 km, metre gauge railway in the West of the present-day Federal State North Rhine-Westphalia. 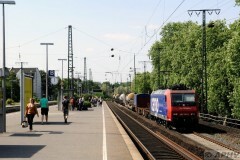 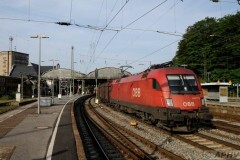 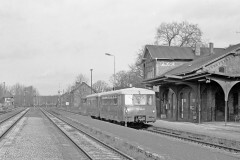 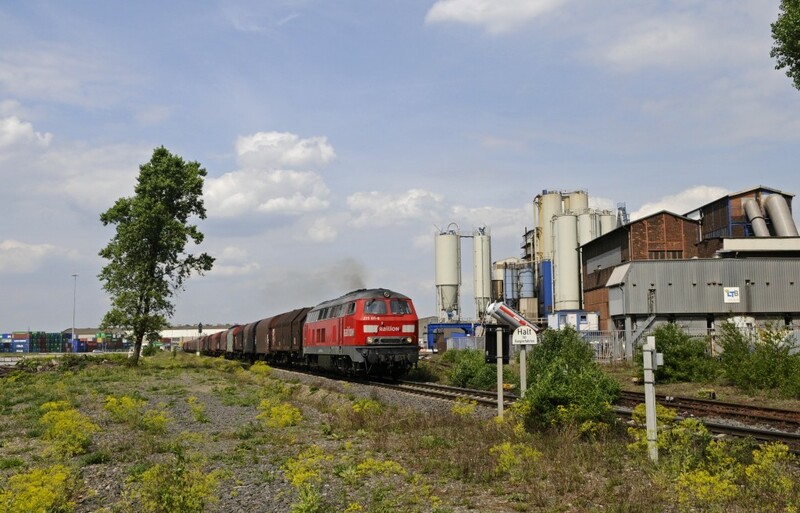 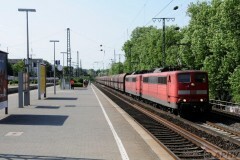 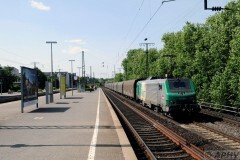 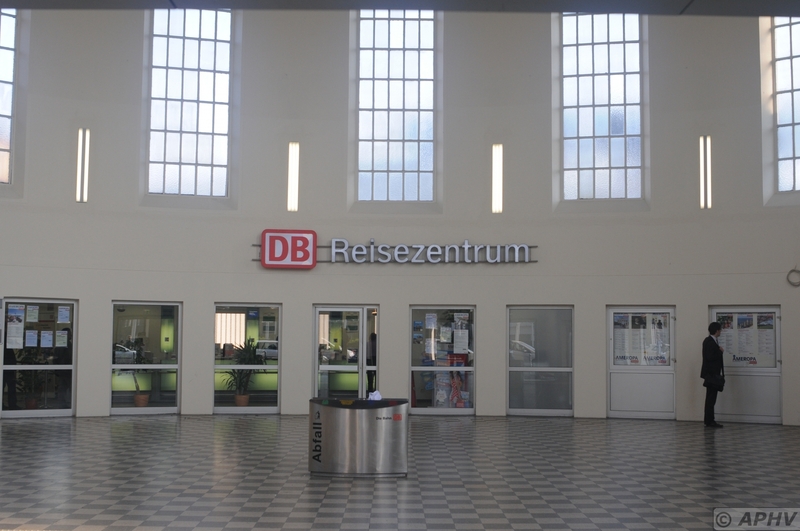 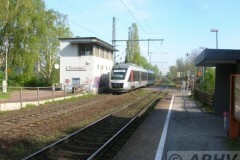 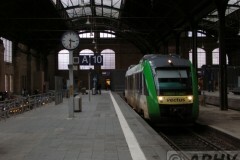 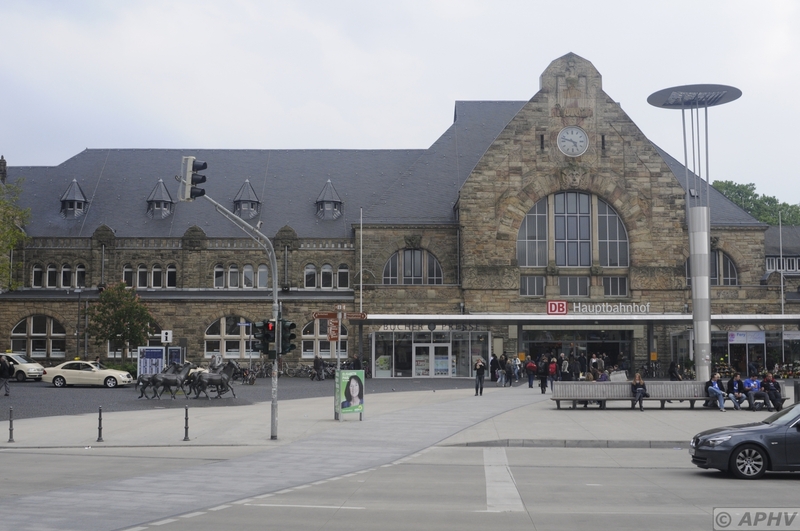 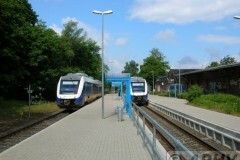 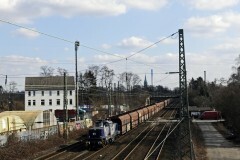 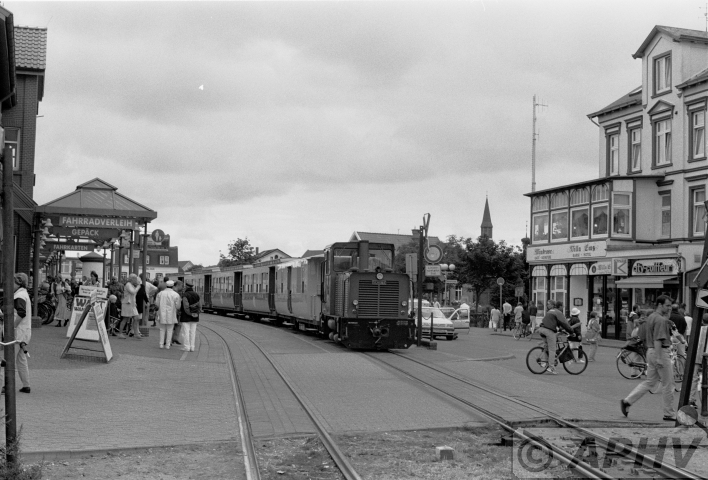 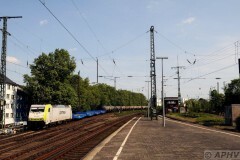 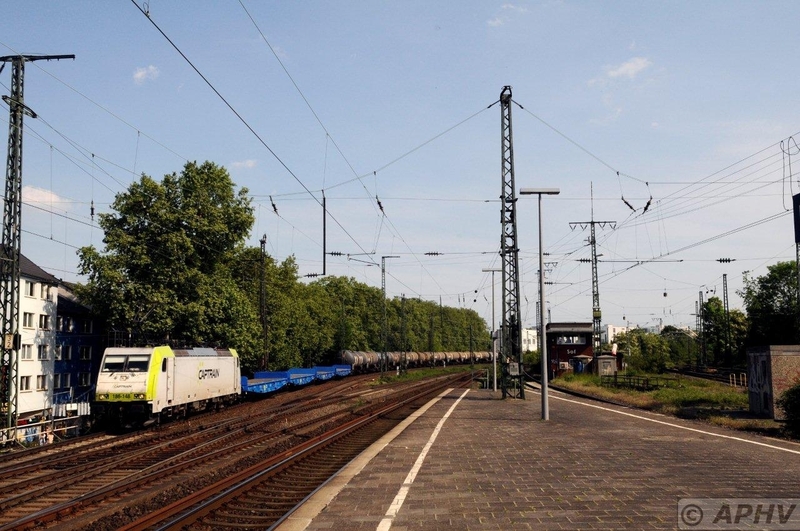 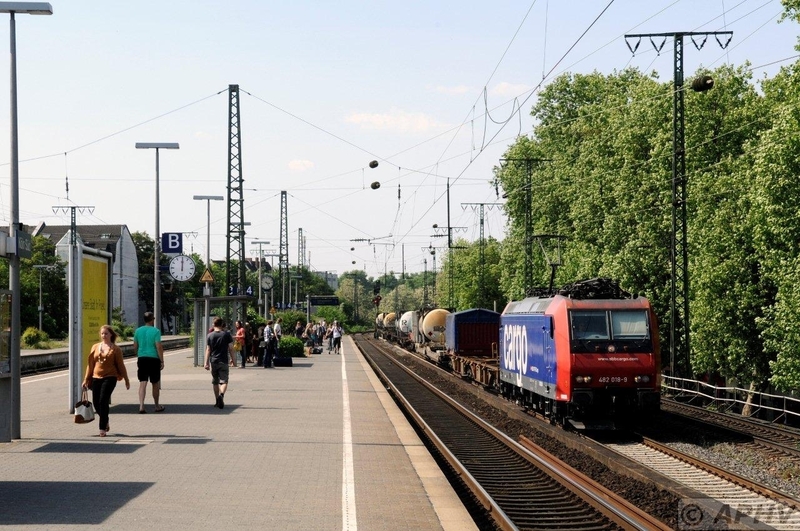 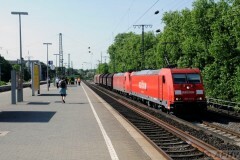 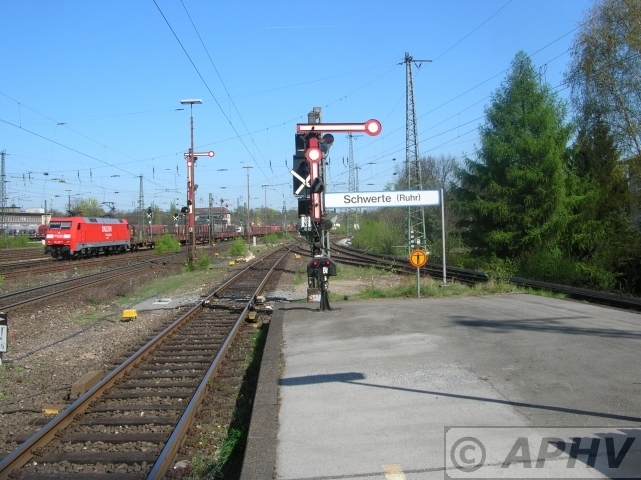 Geilenkirchen district railway station formed the operational hub, from two branches of routes opened up the rural and structurally weak Selfkant and a part of the Jülich country, with the northern part of the worm’s run. 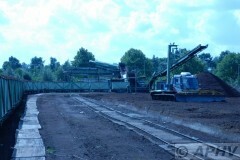 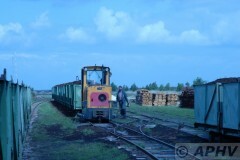 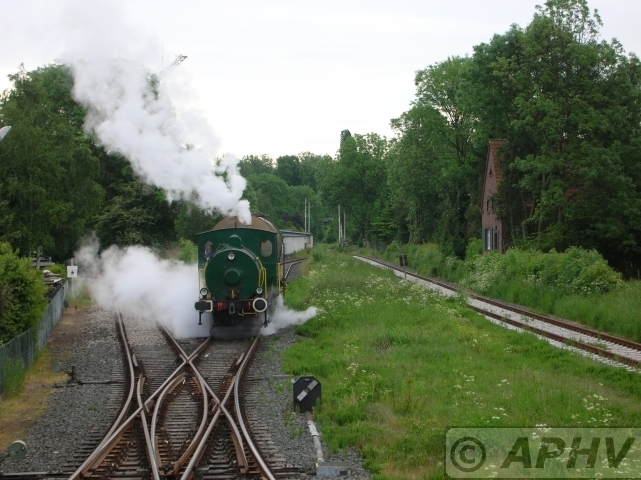 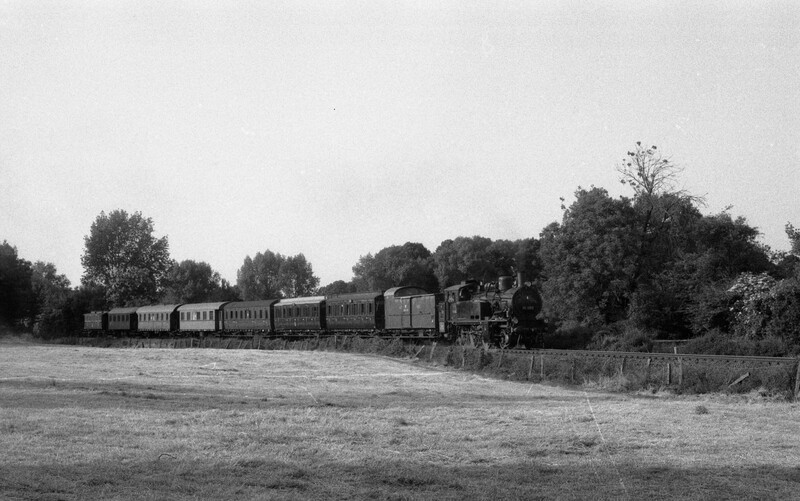 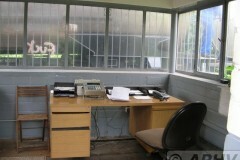 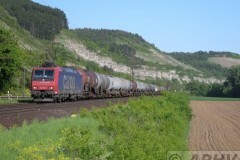 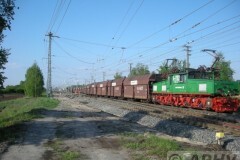 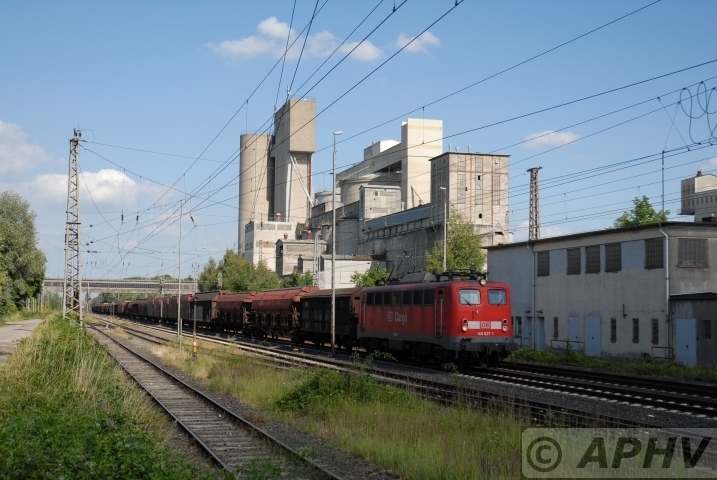 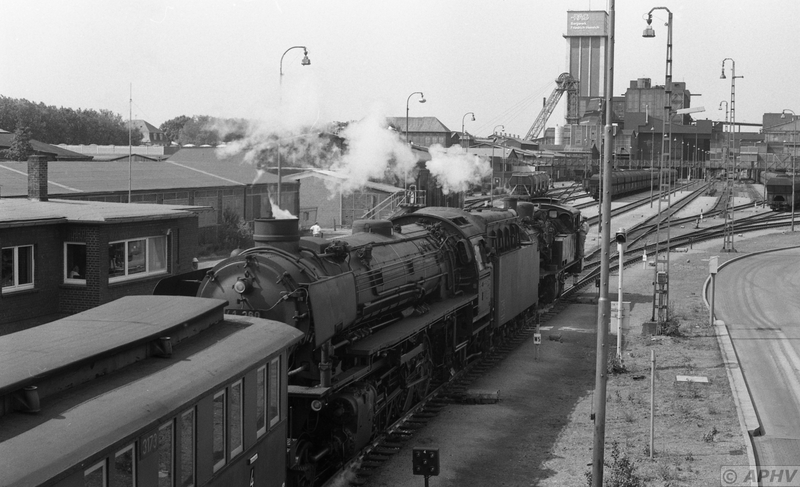 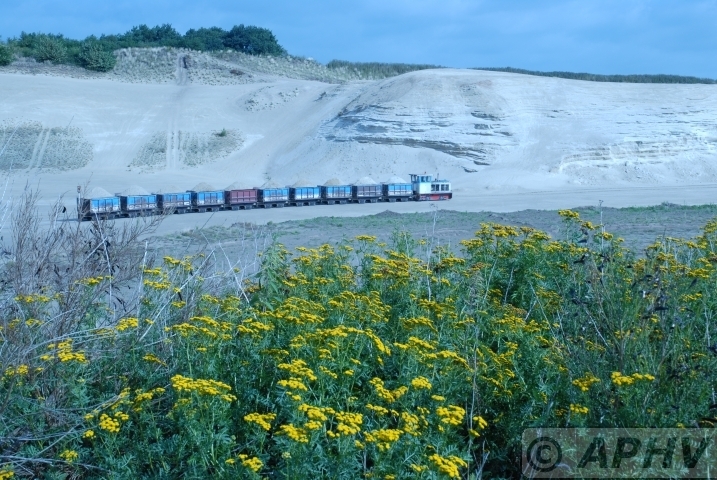 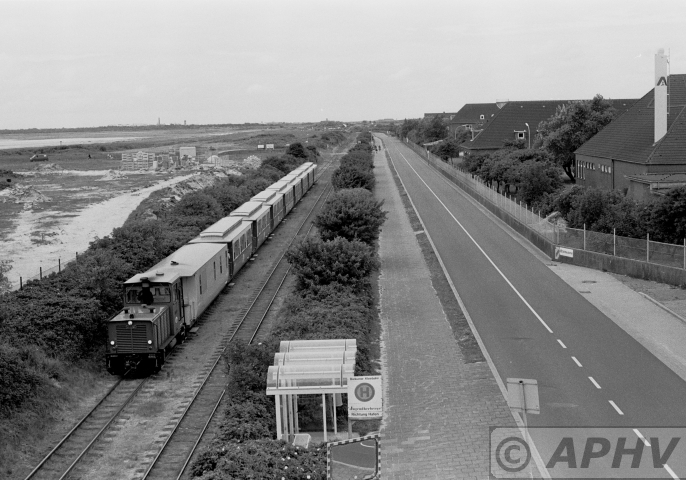 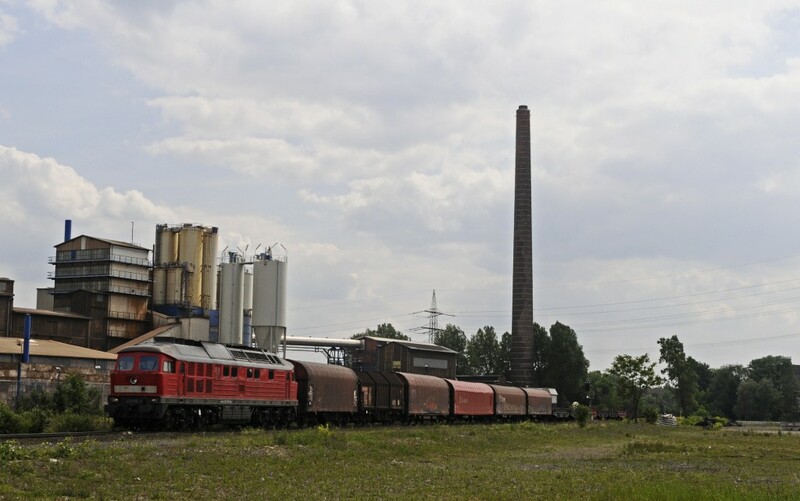 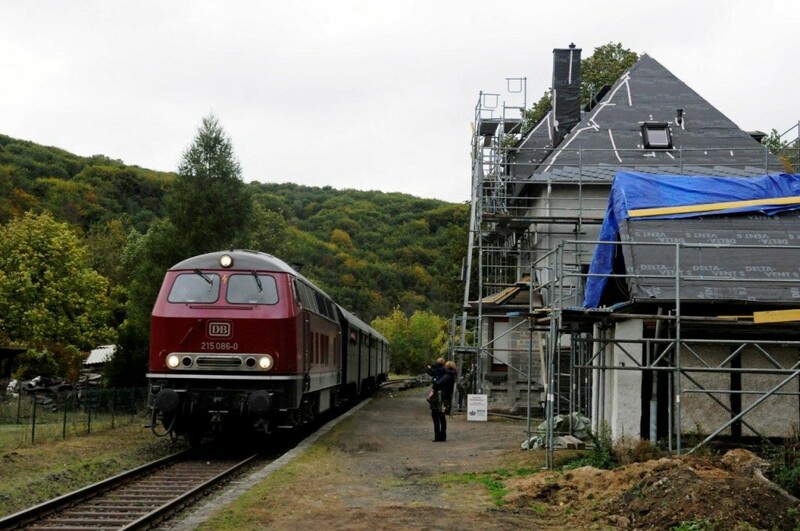 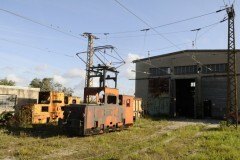 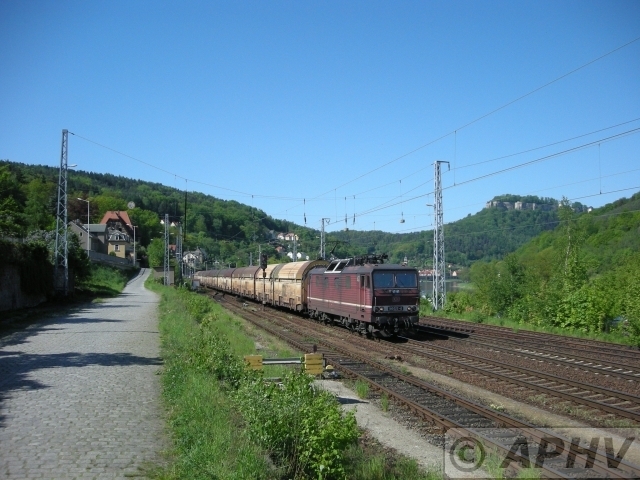 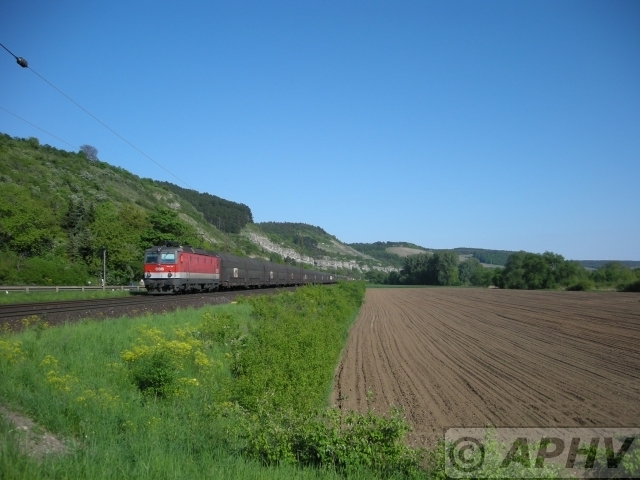 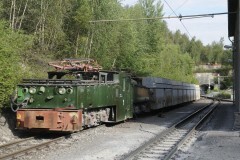 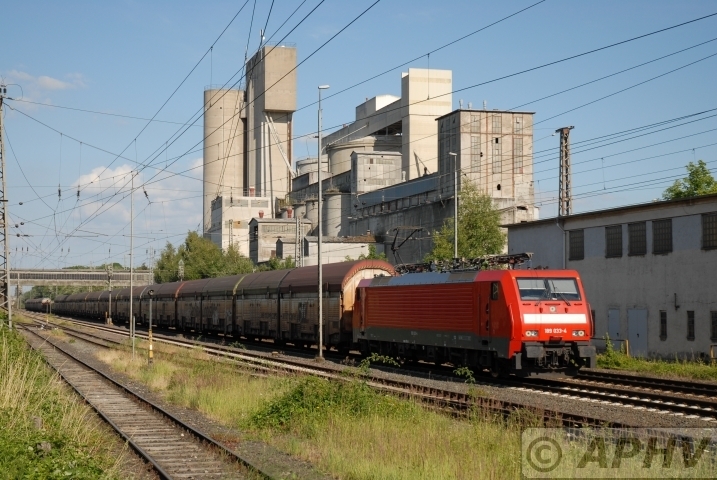 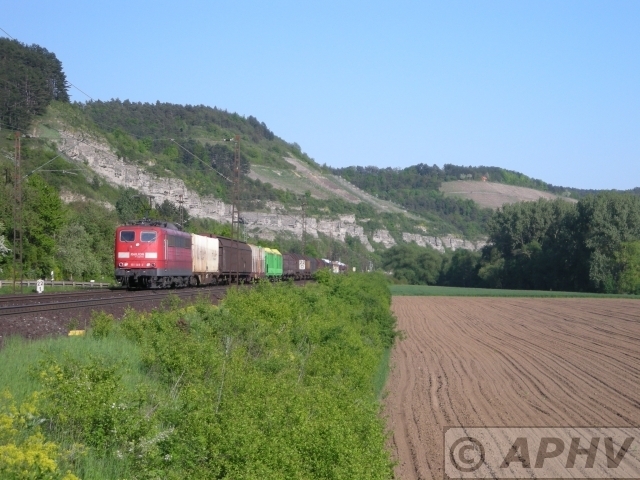 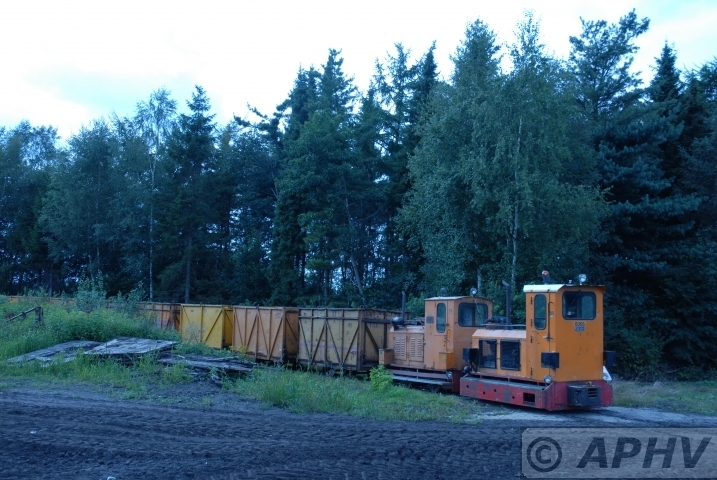 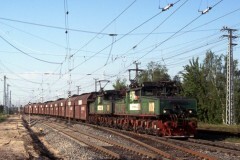 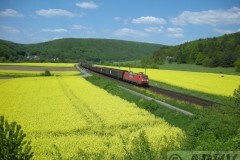 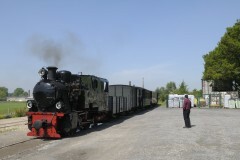 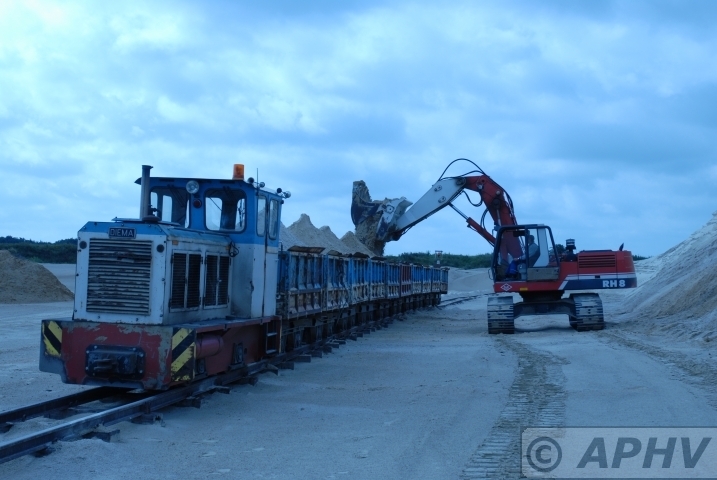 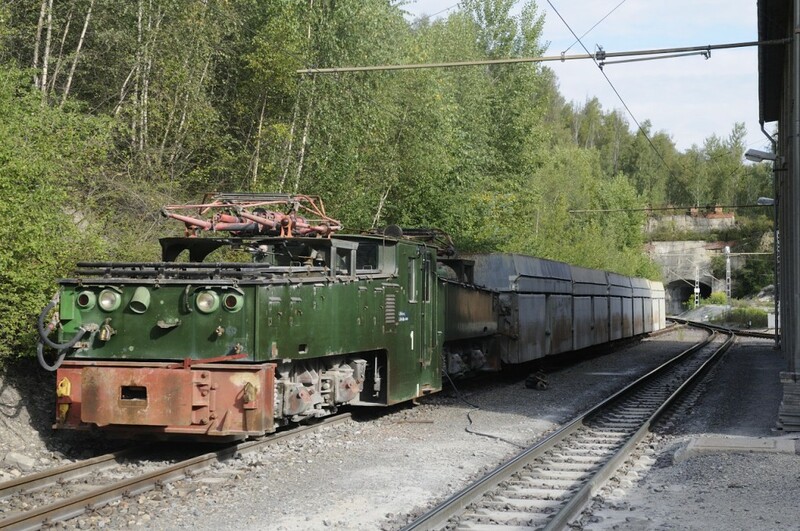 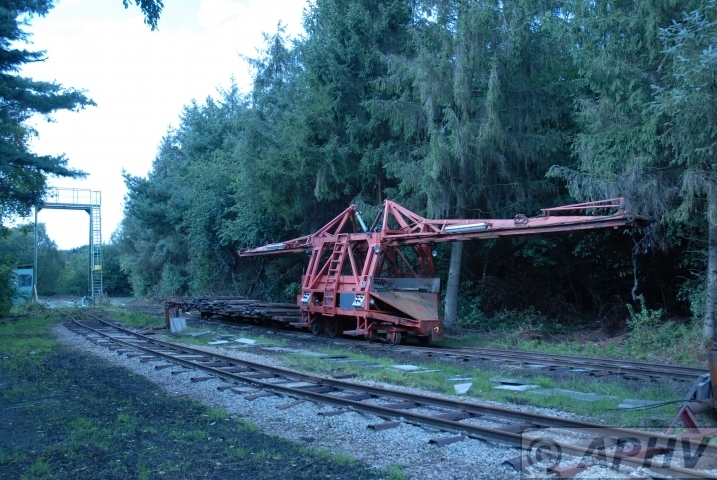 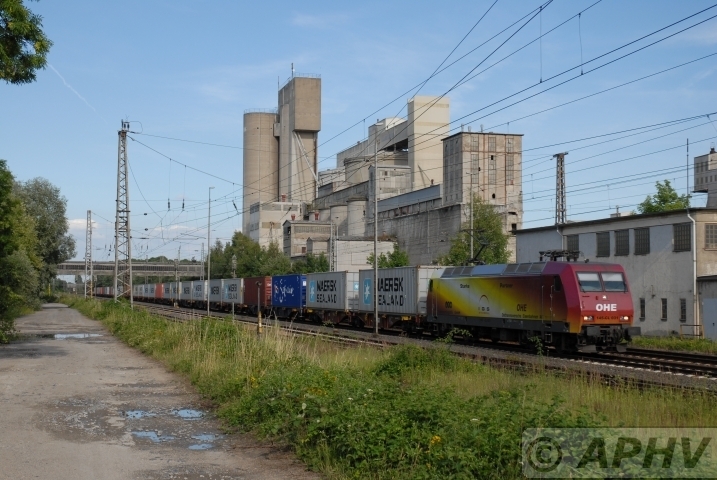 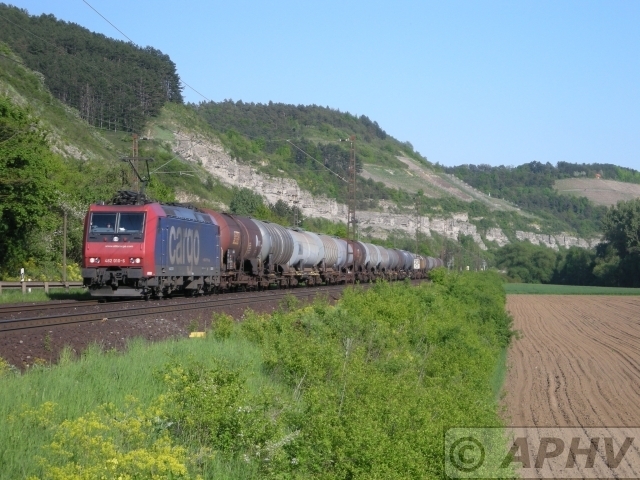 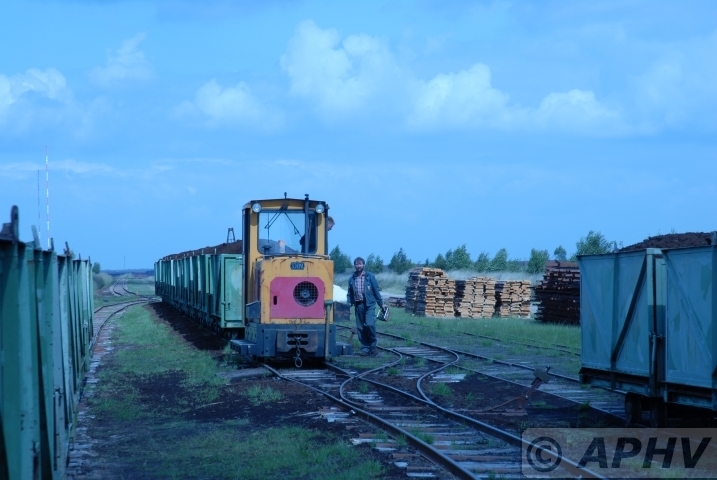 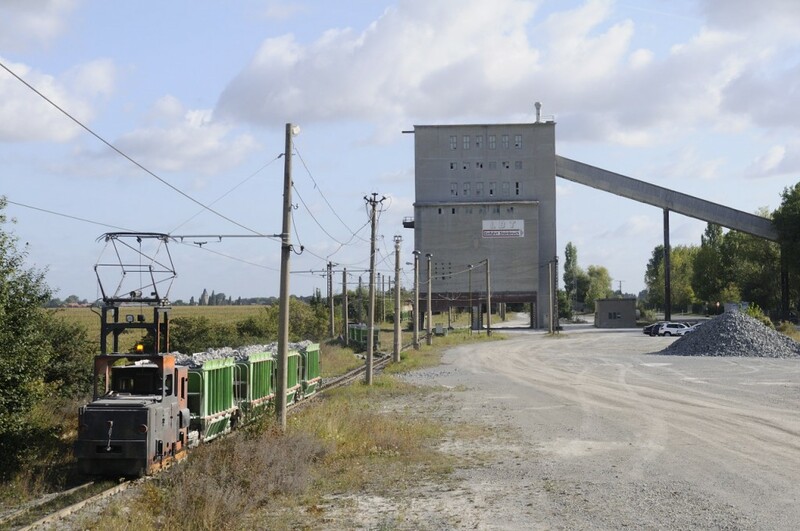 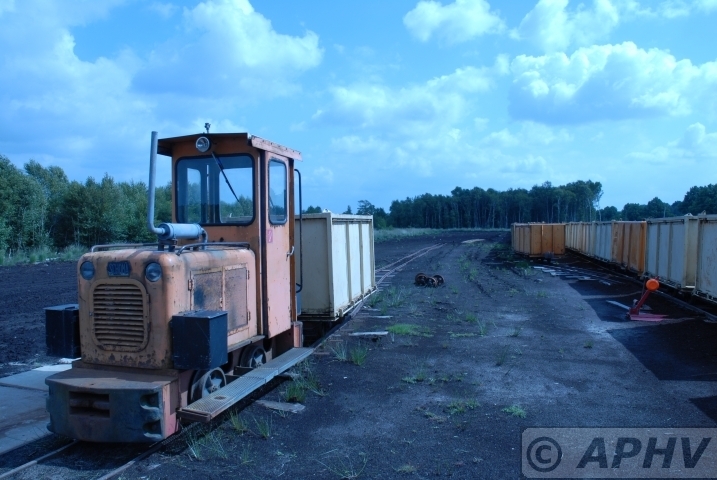 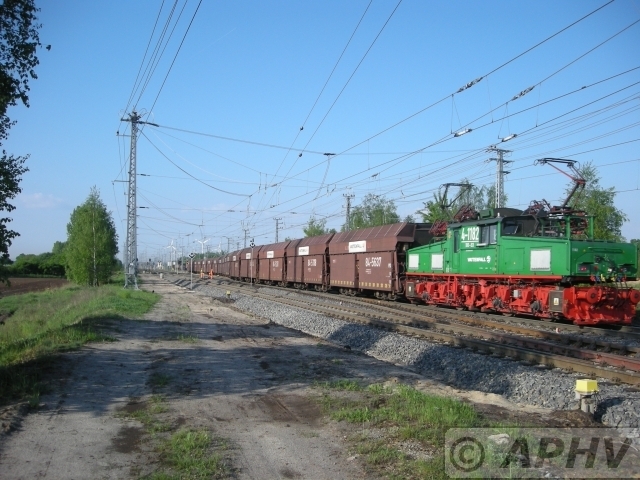 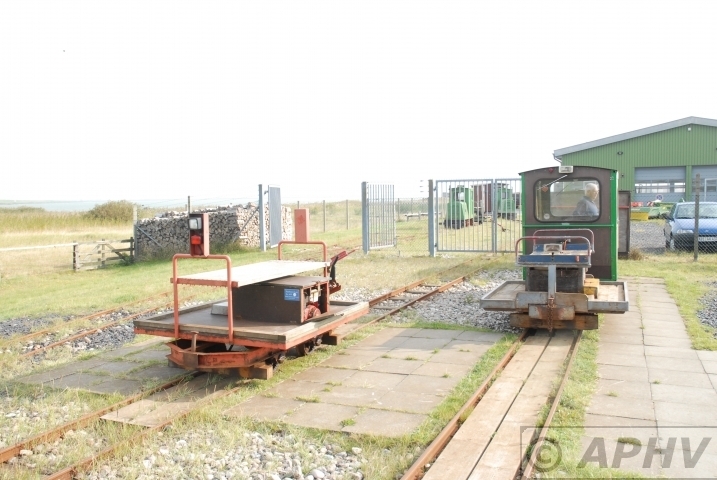 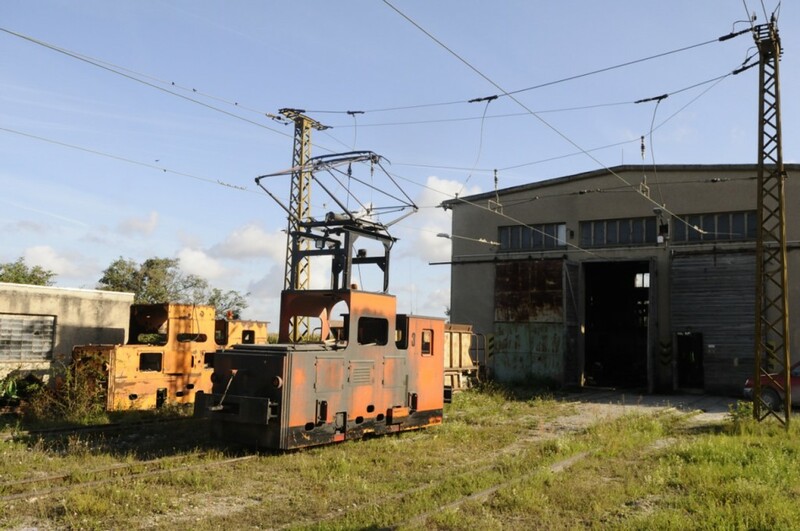 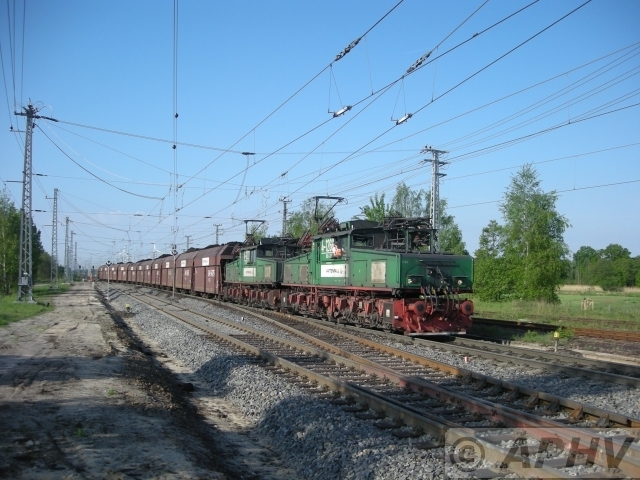 The operation of the railway was abandoned in stept in 1953 successively and 1973 entirely. 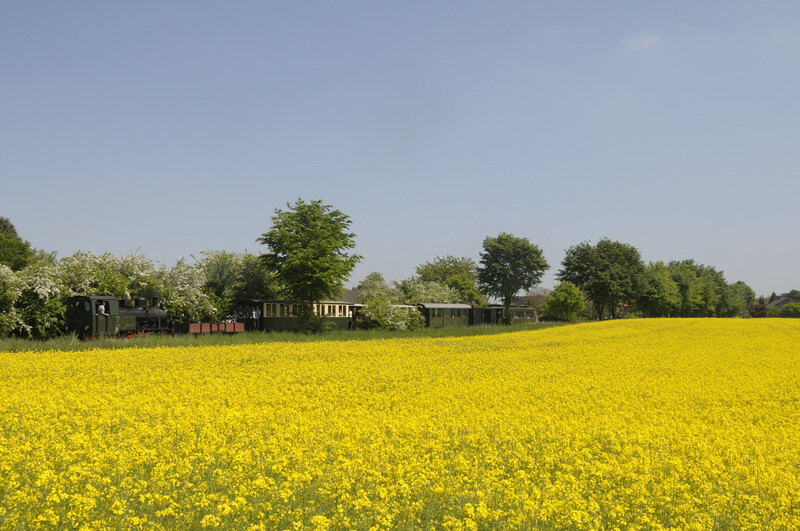 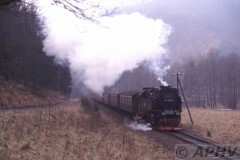 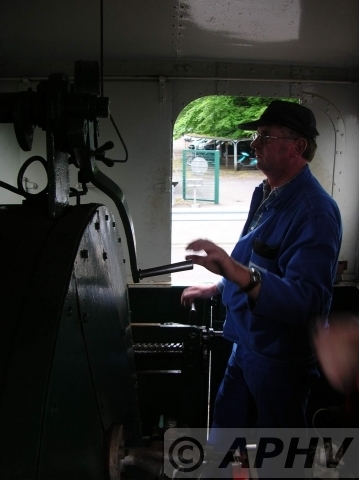 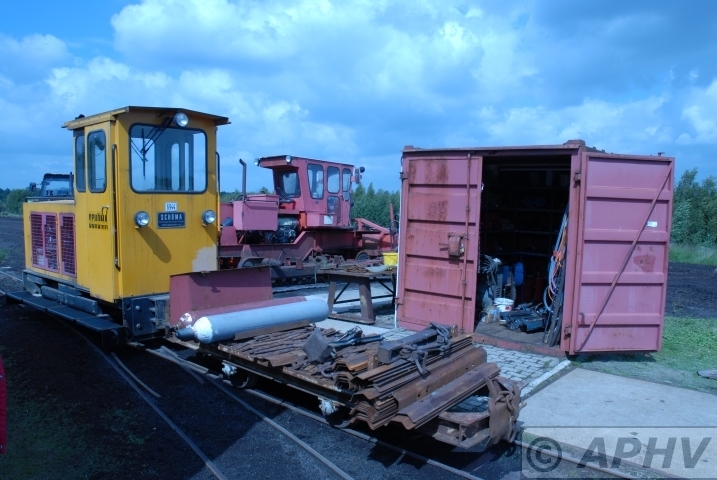 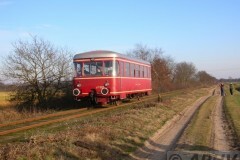 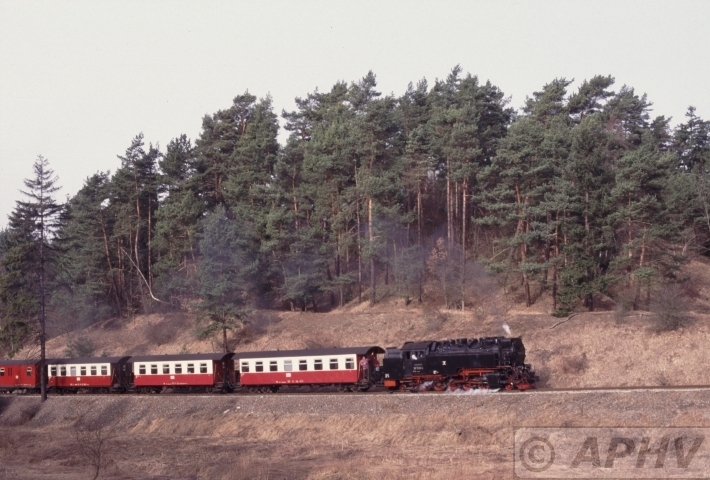 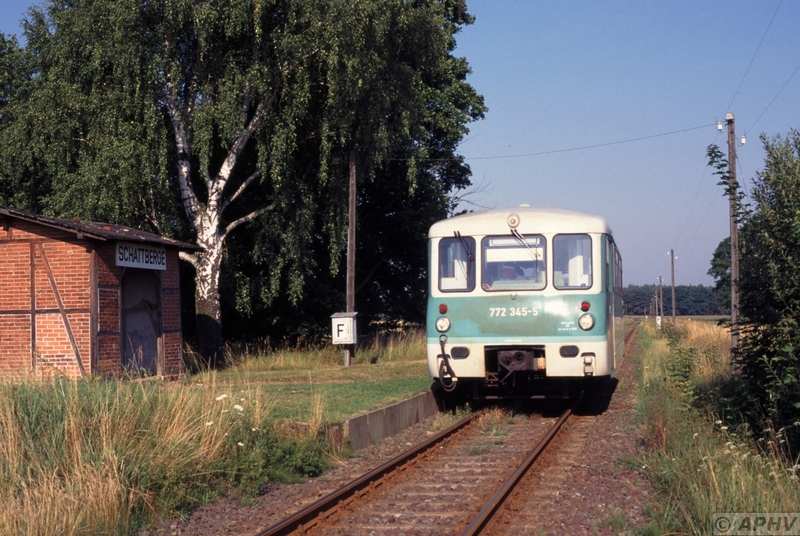 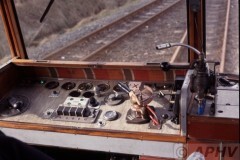 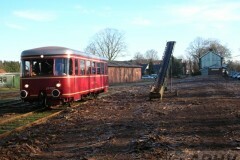 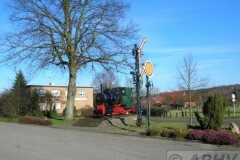 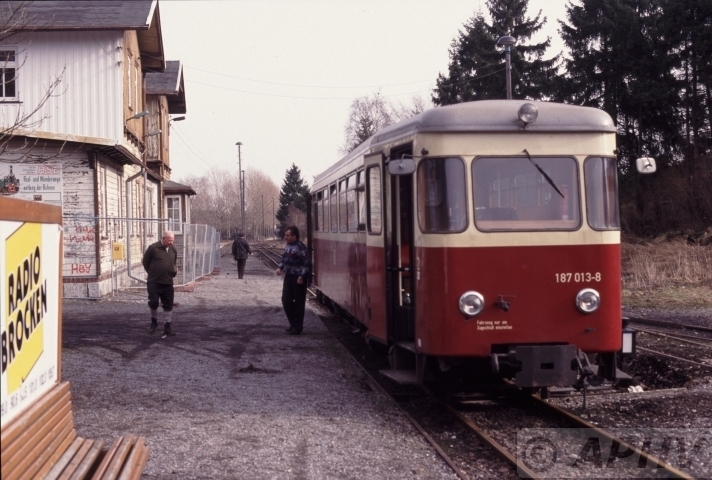 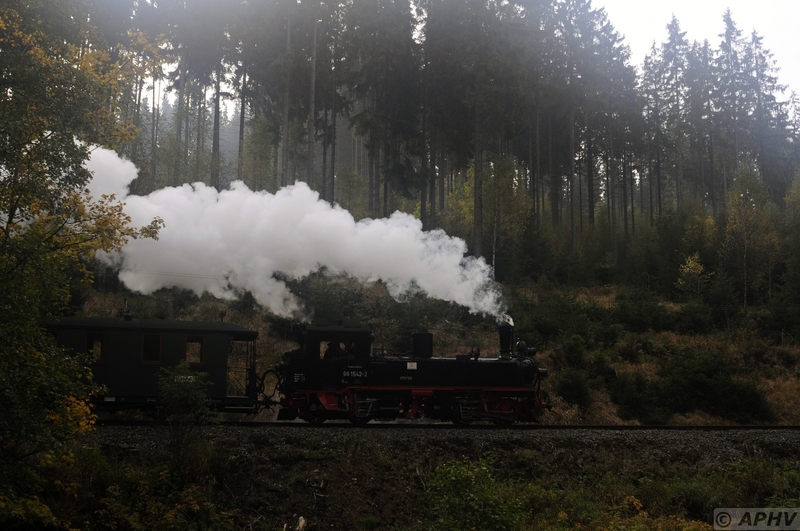 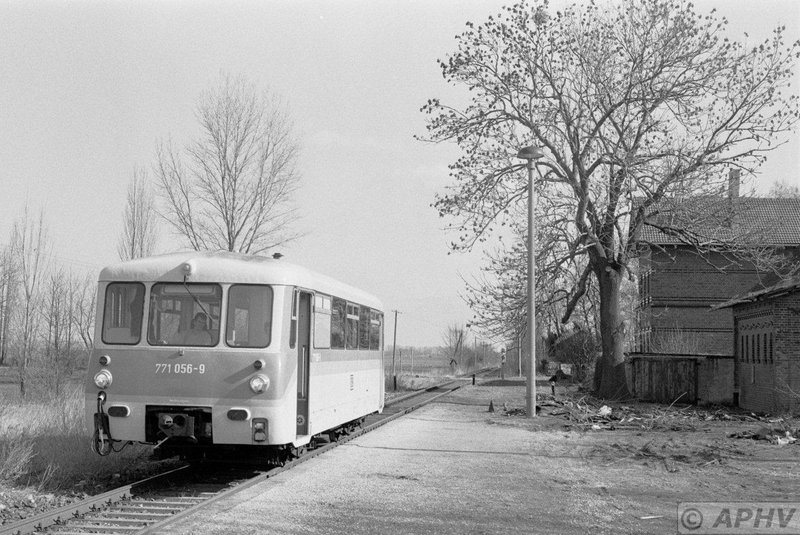 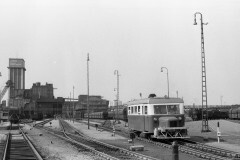 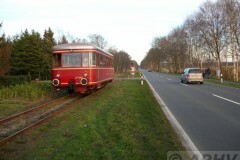 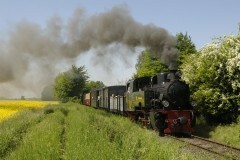 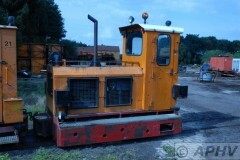 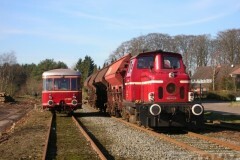 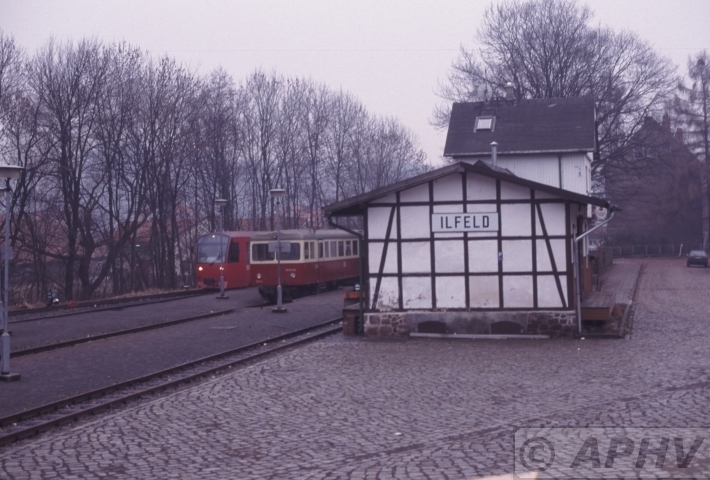 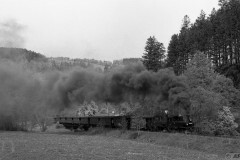 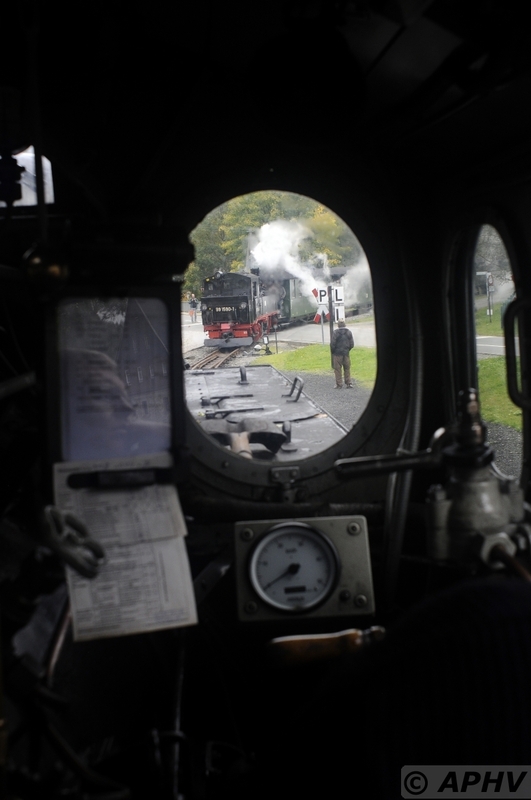 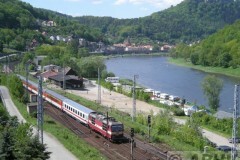 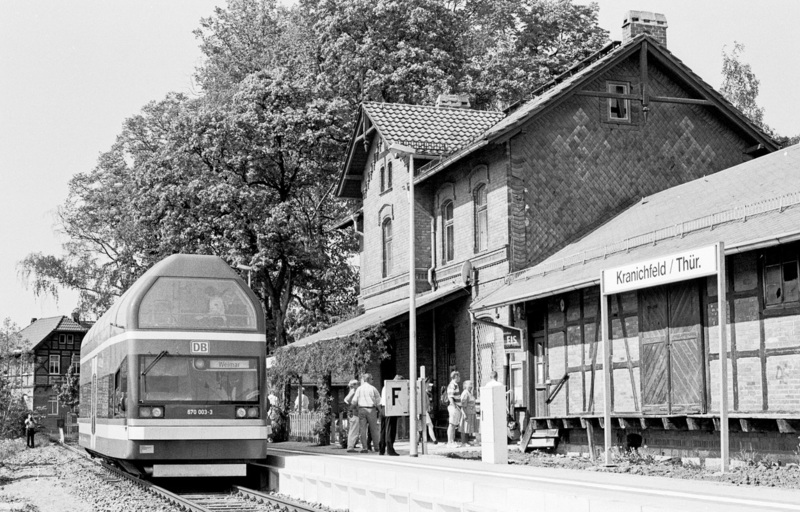 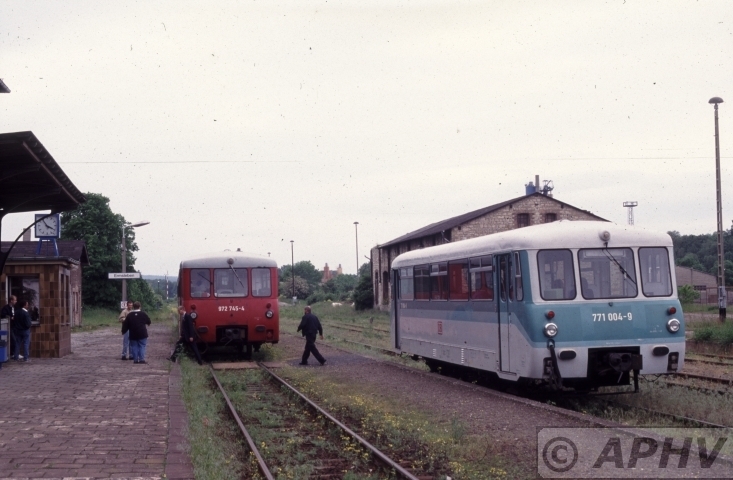 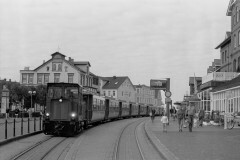 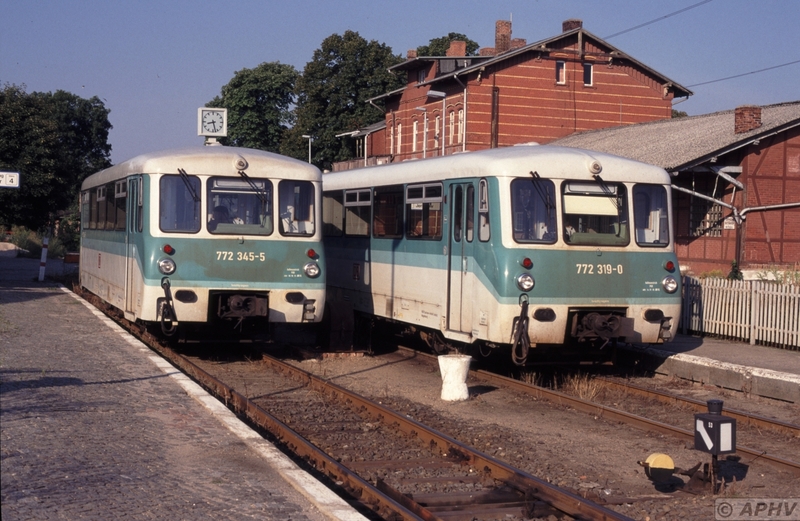 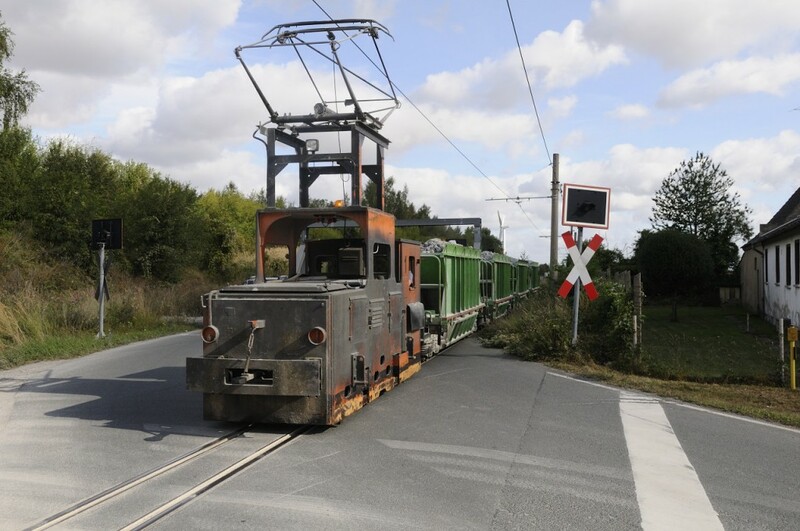 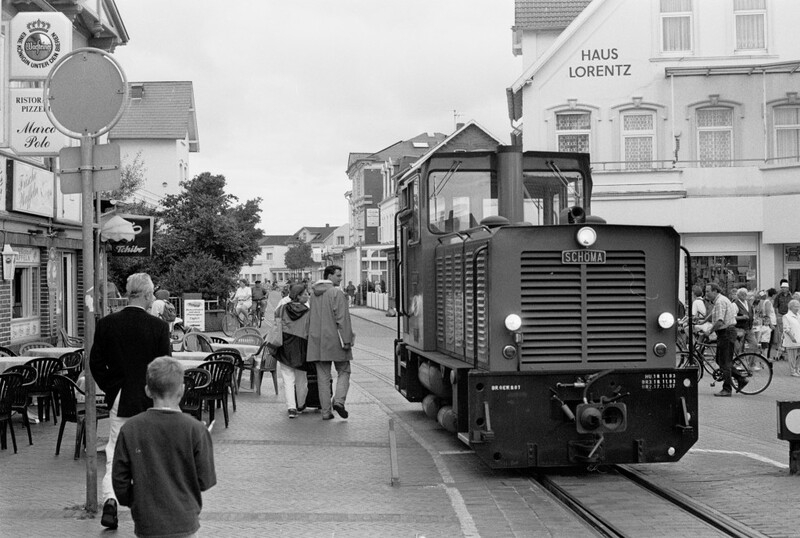 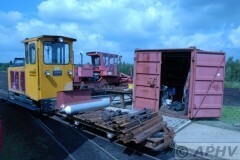 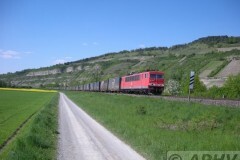 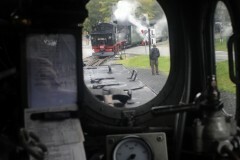 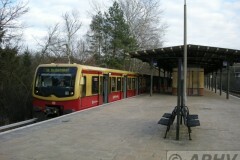 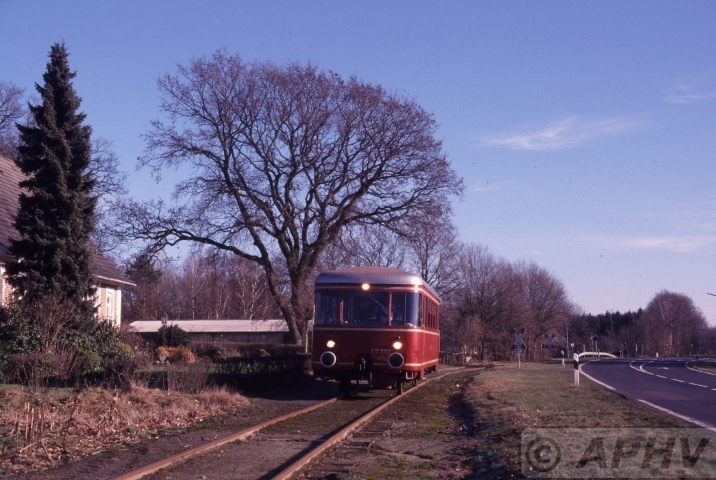 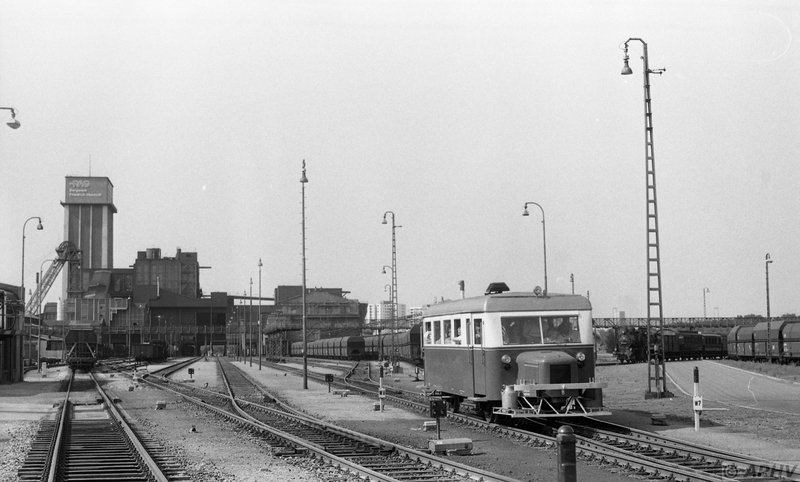 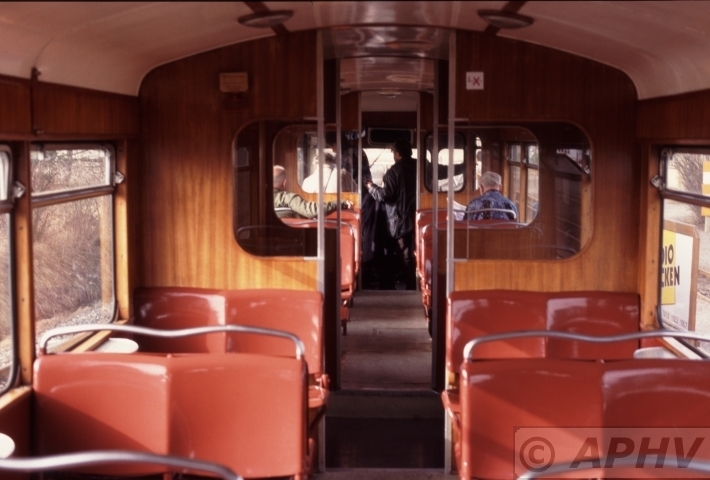 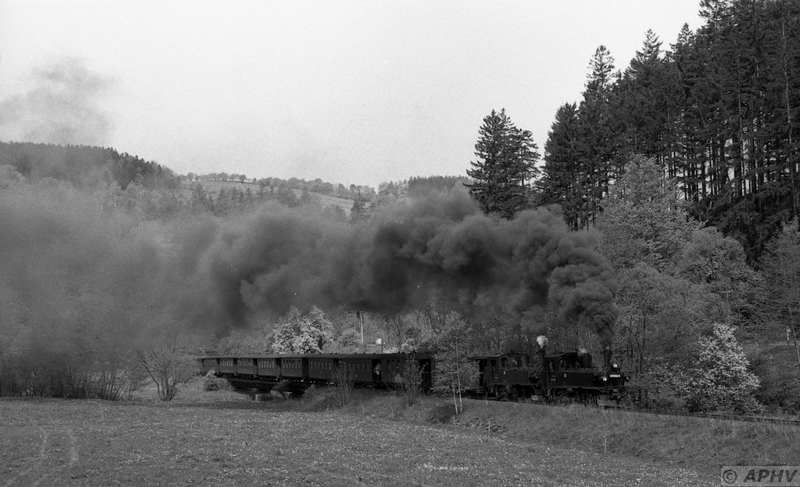 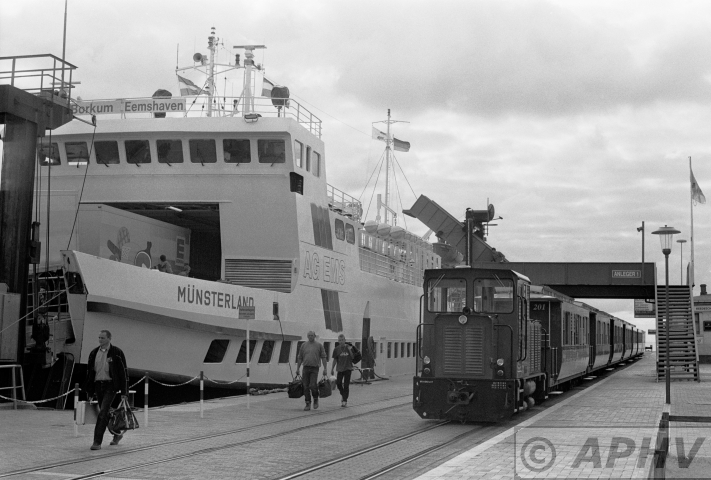 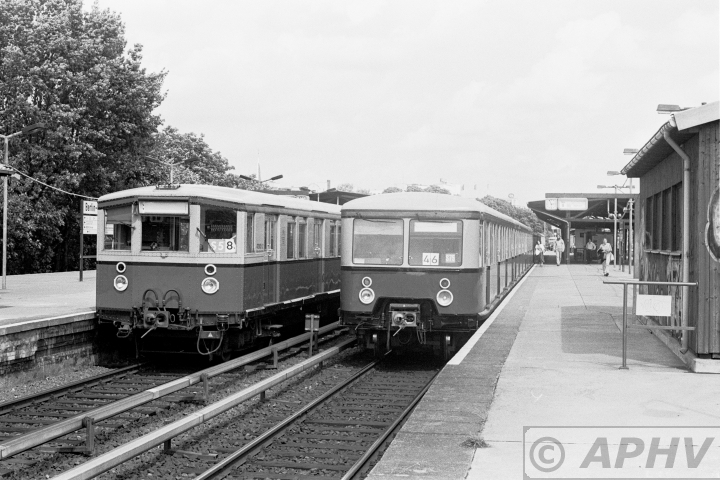 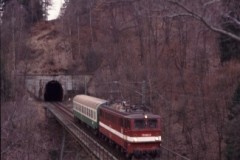 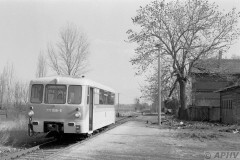 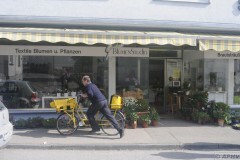 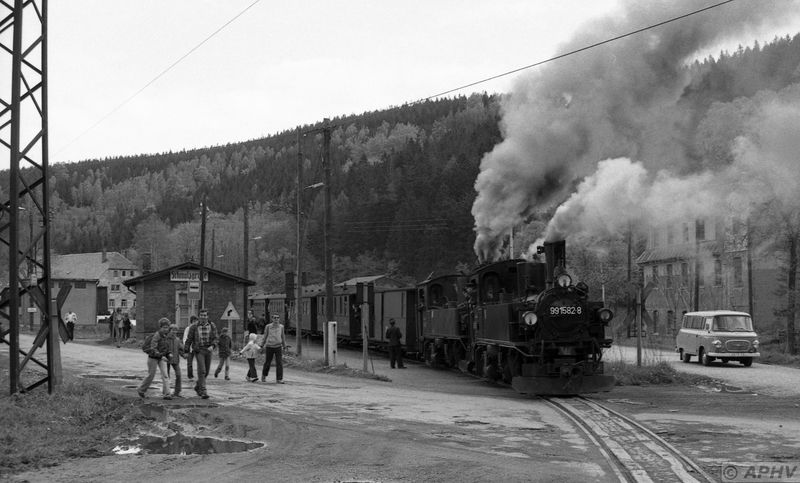 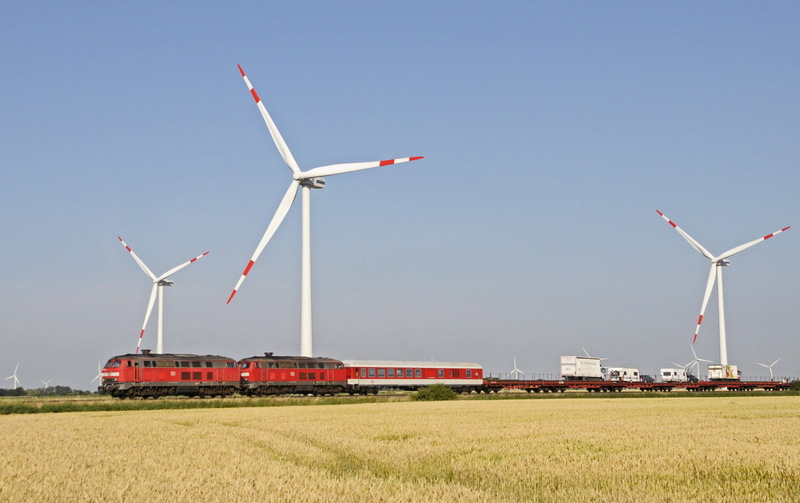 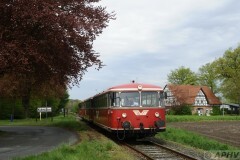 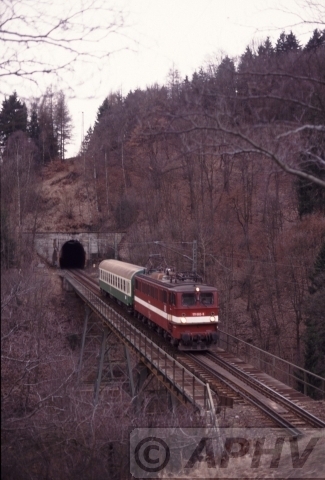 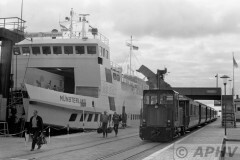 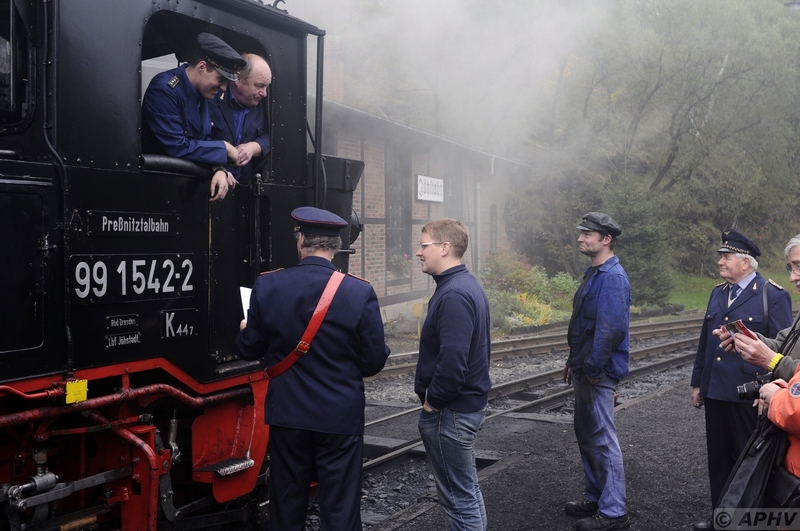 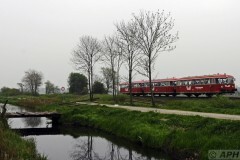 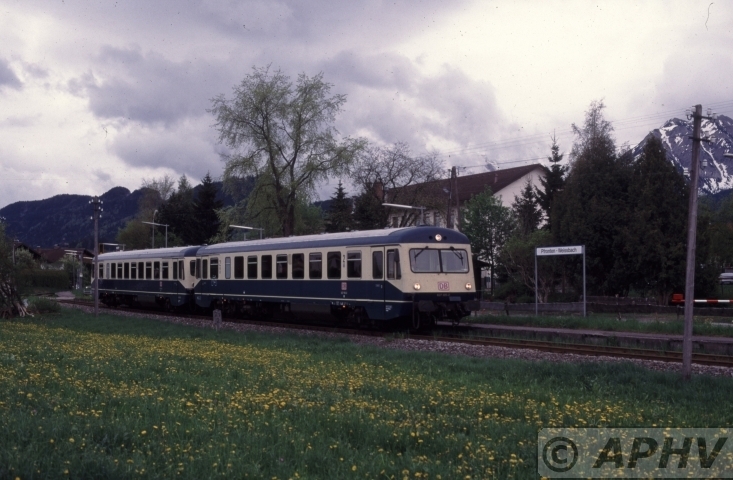 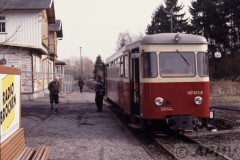 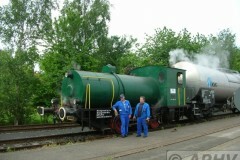 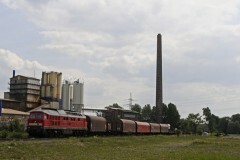 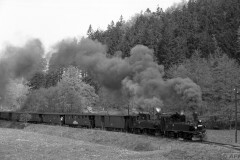 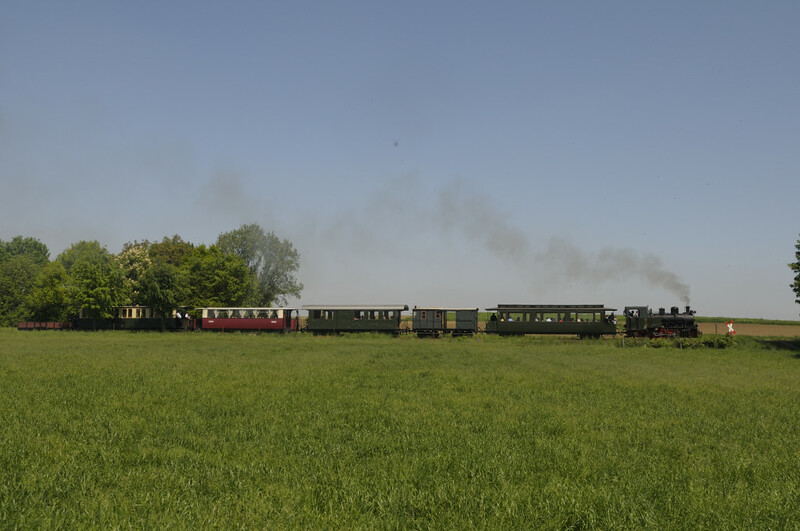 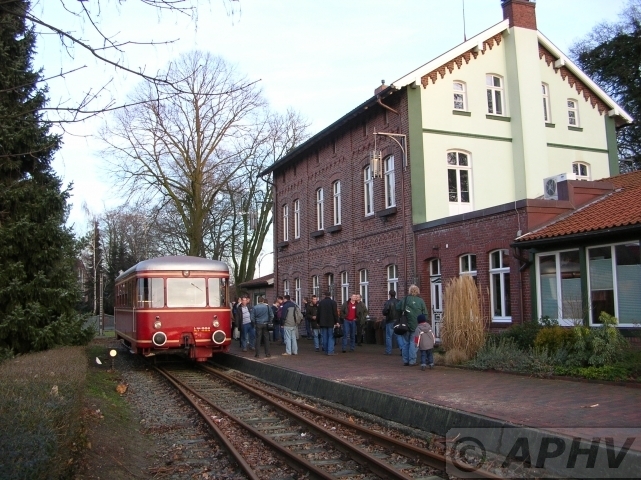 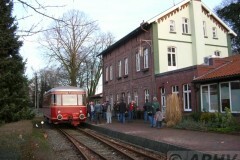 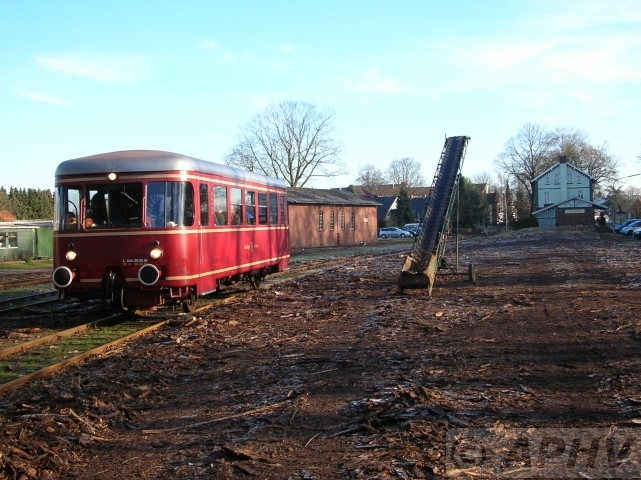 lrath is todays museumline under the name Selfkantbahn. 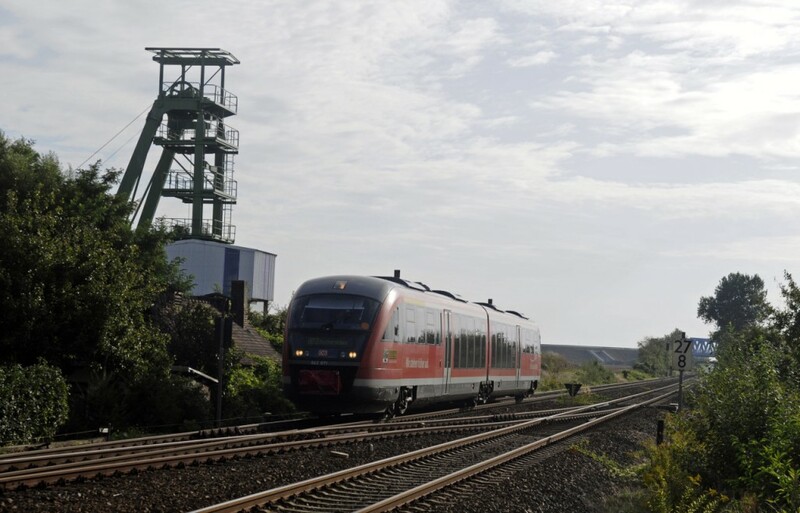 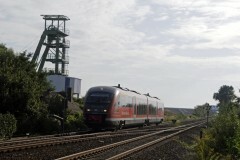 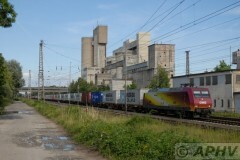 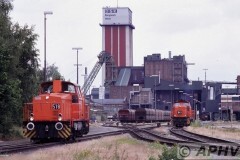 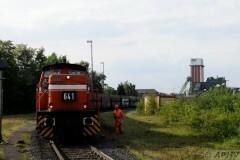 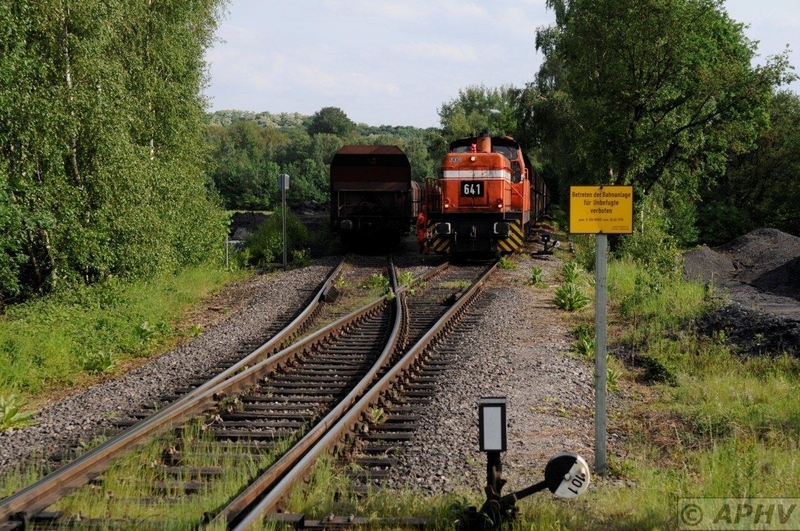 Sodawerk Staßfurt has a 3 kilometer 600 mm electrified line to the open pit near Förderstedt ( Kalksteinbruch ). 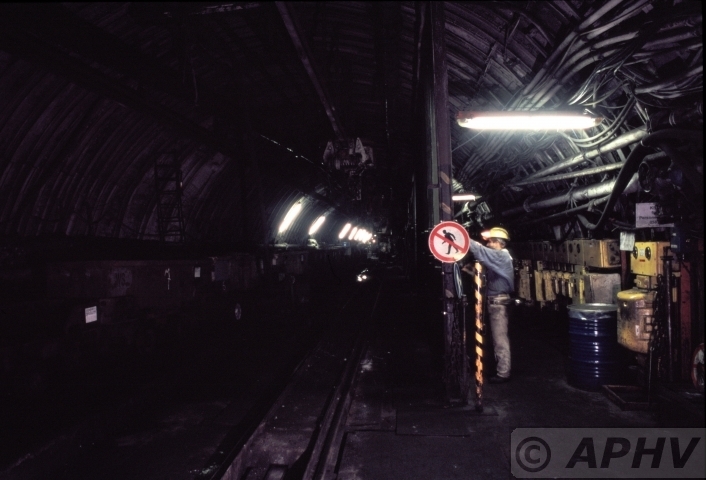 And in Bernburg the 900 mm electrified line runs underground from the mine about 1 kilometer crossing the river Saale into the factory. 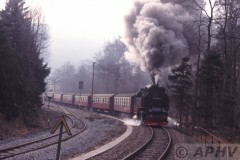 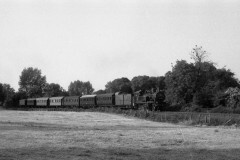 13341 DB 144-081 still in normal service those days. 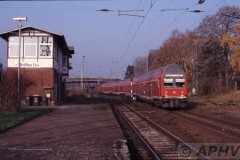 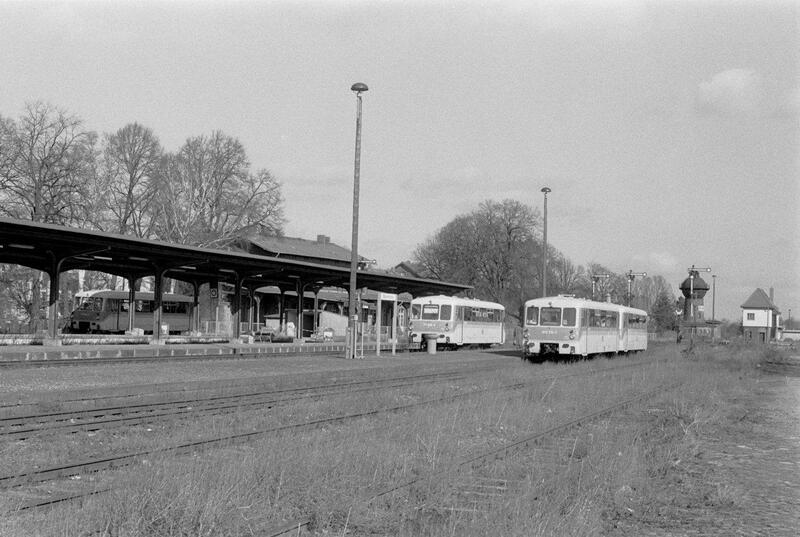 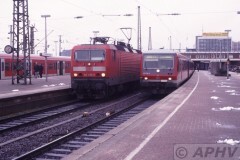 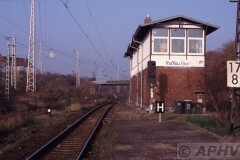 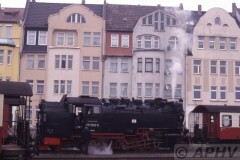 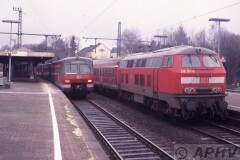 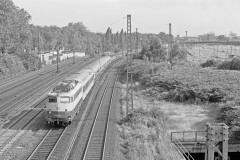 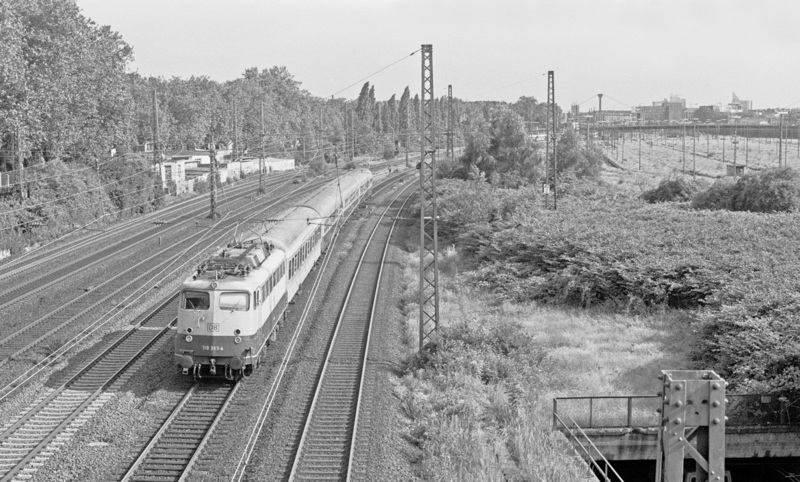 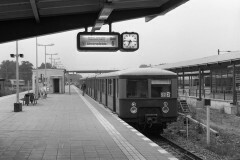 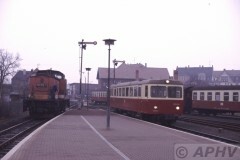 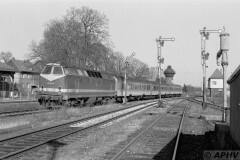 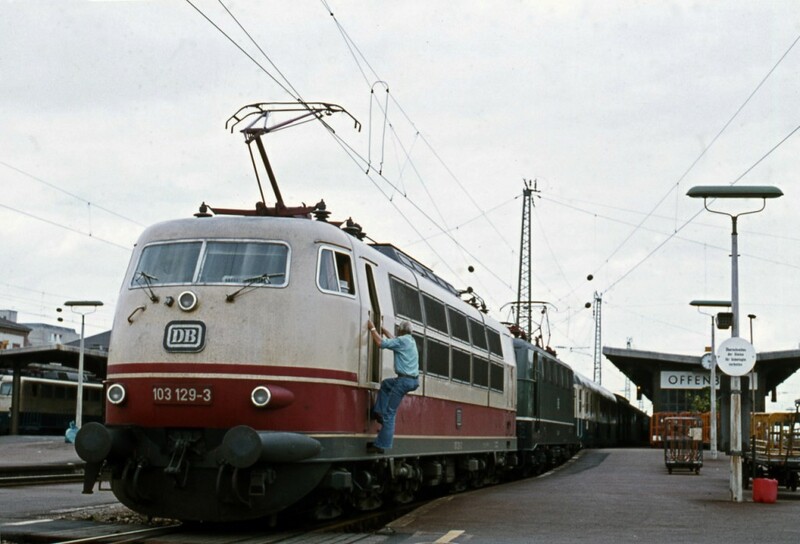 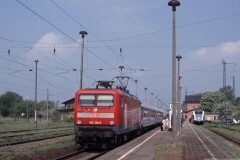 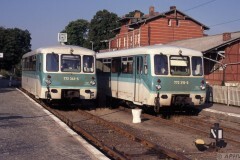 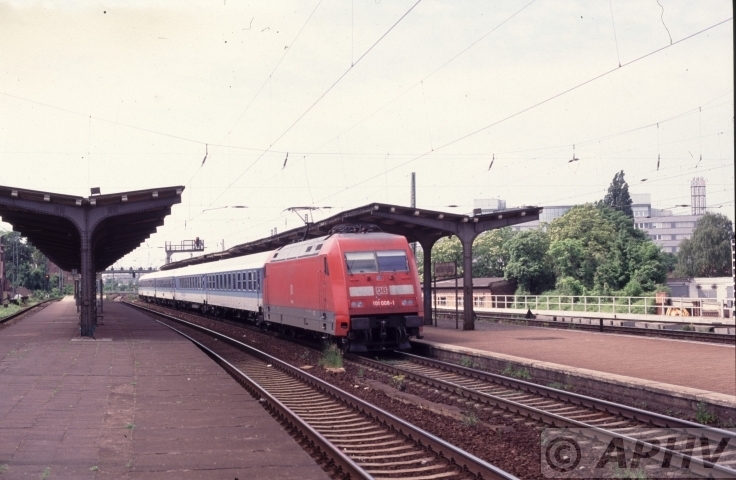 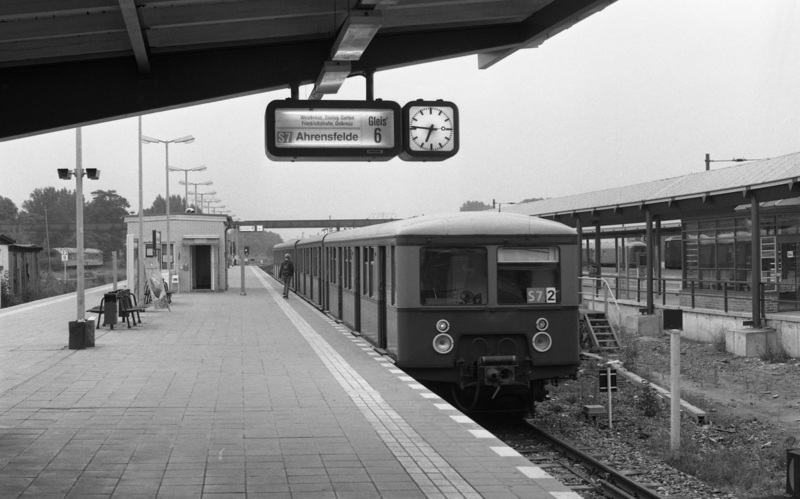 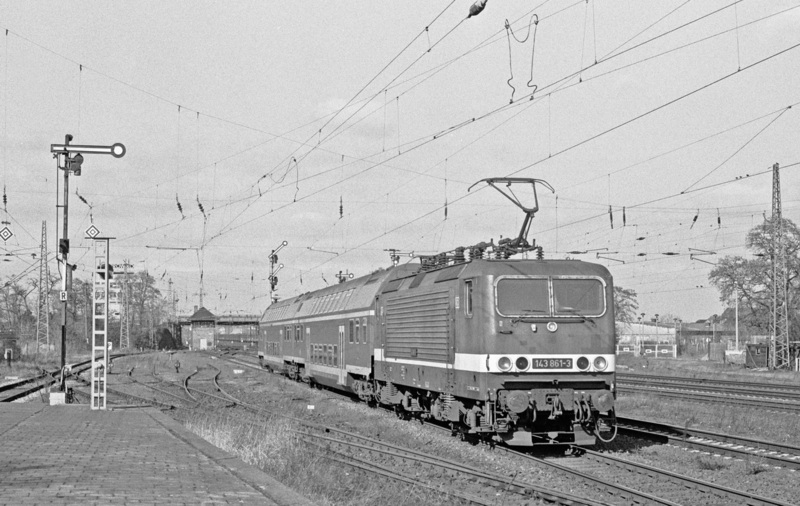 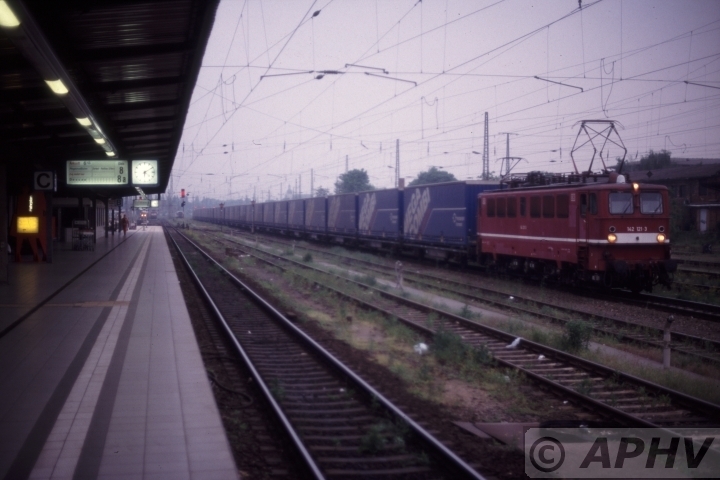 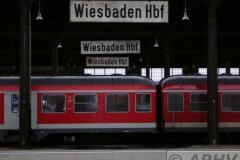 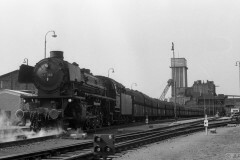 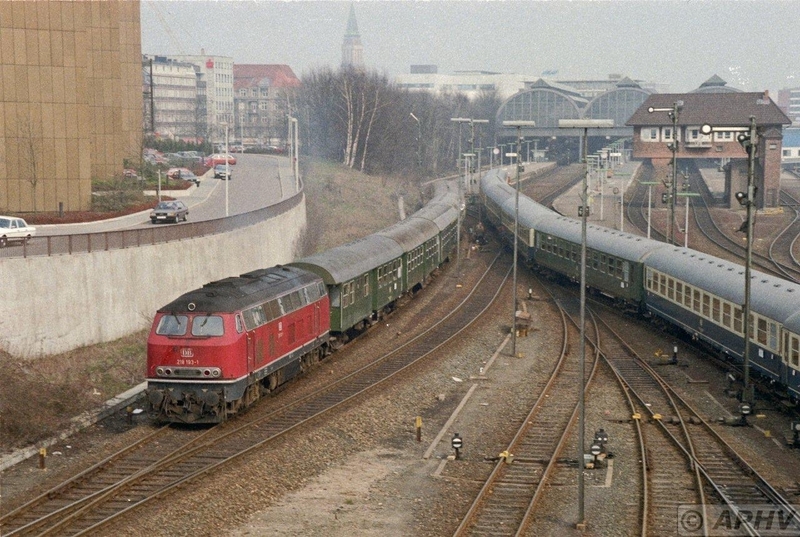 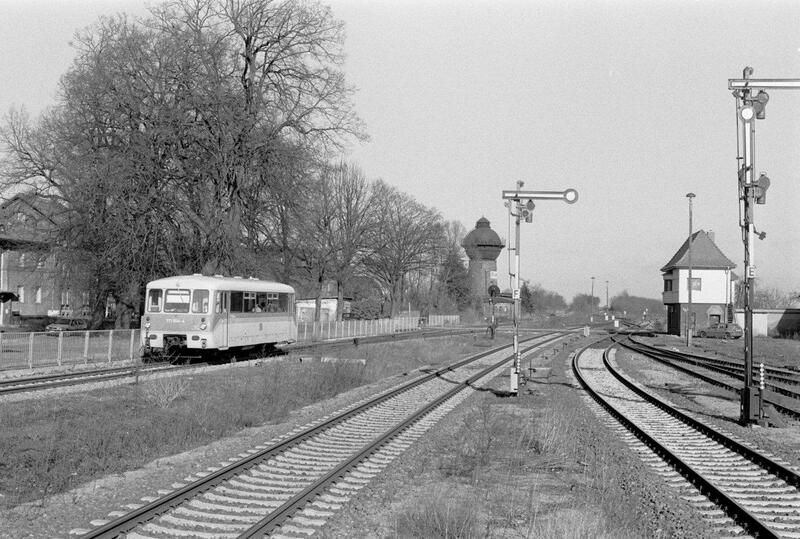 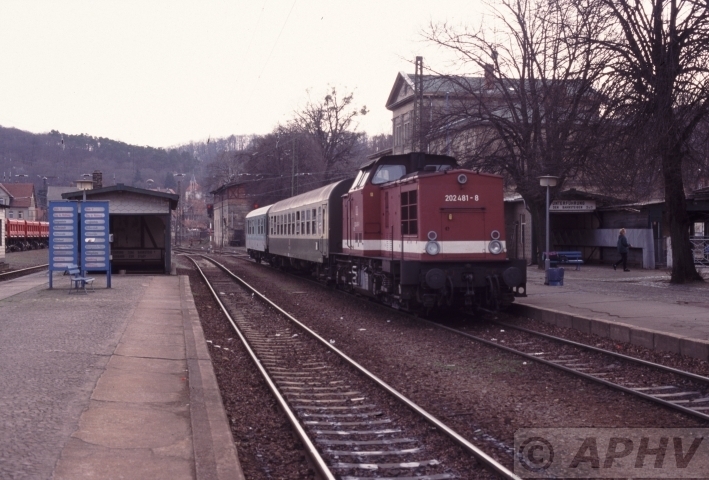 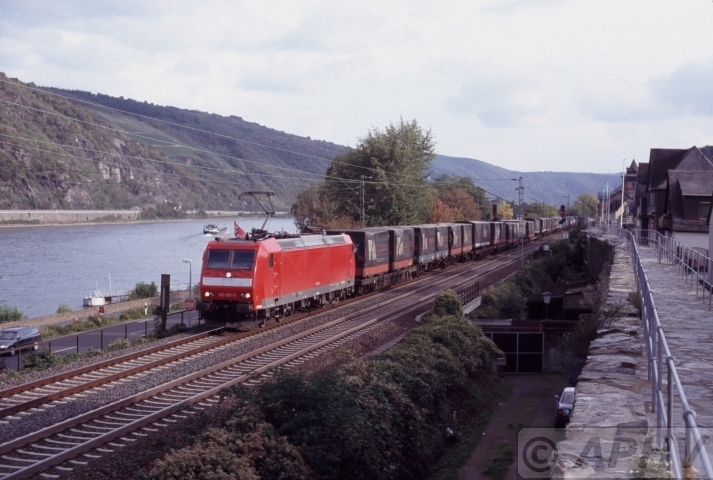 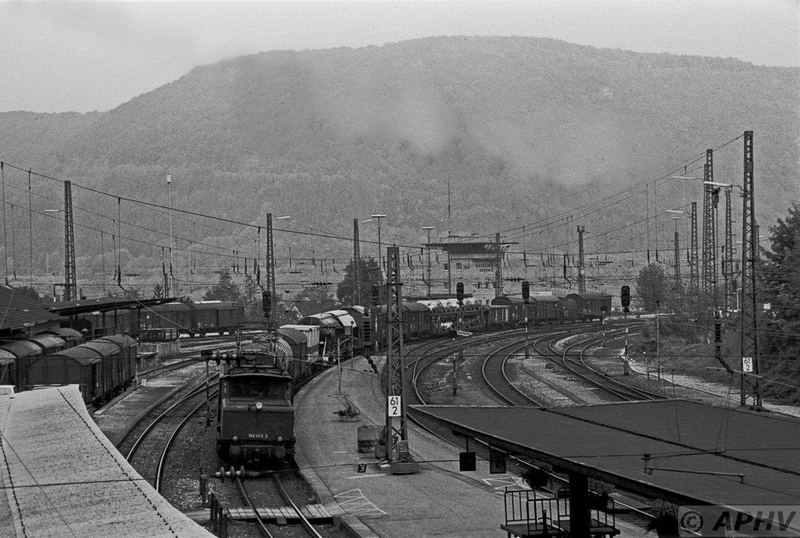 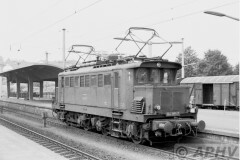 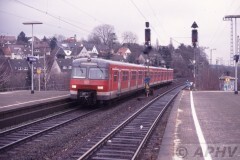 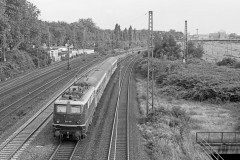 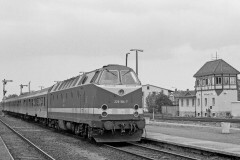 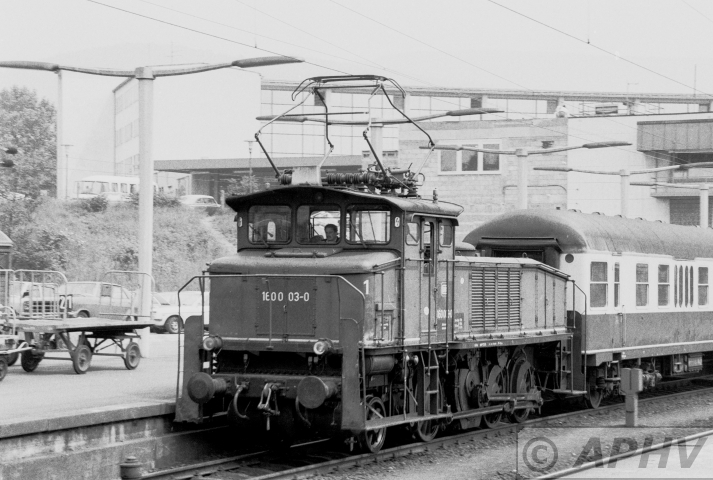 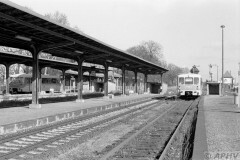 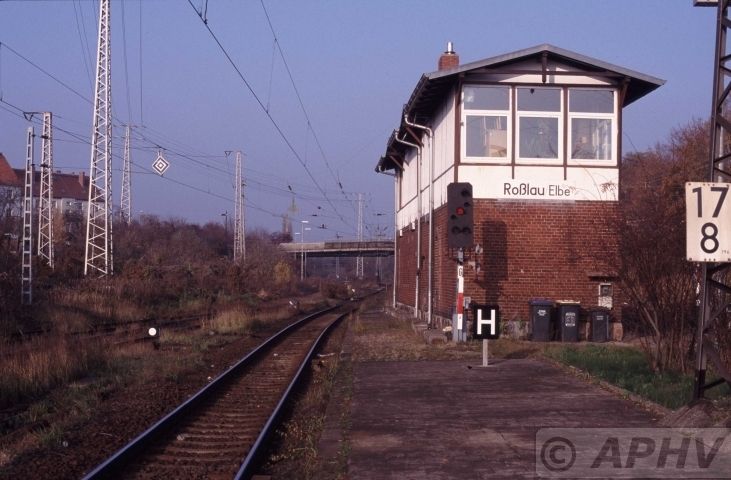 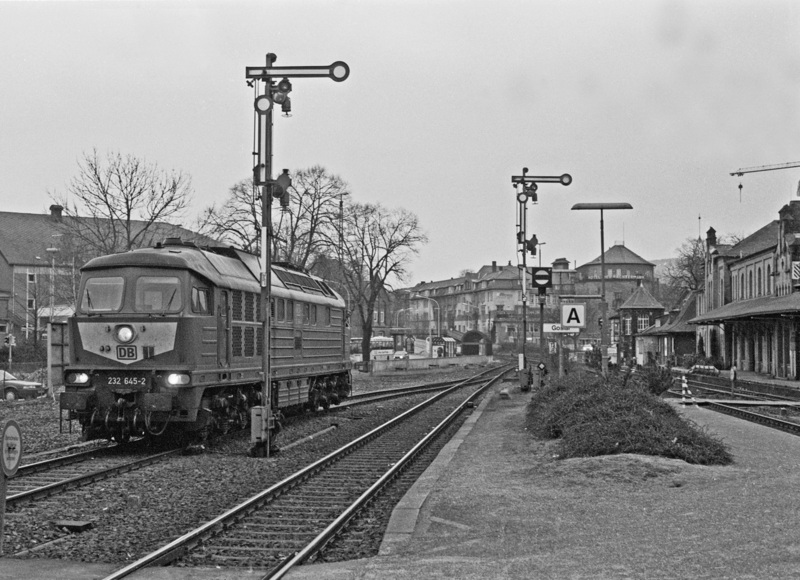 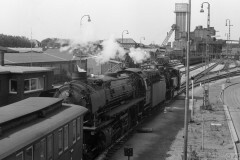 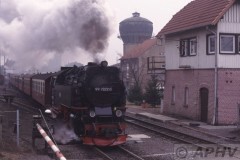 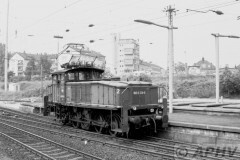 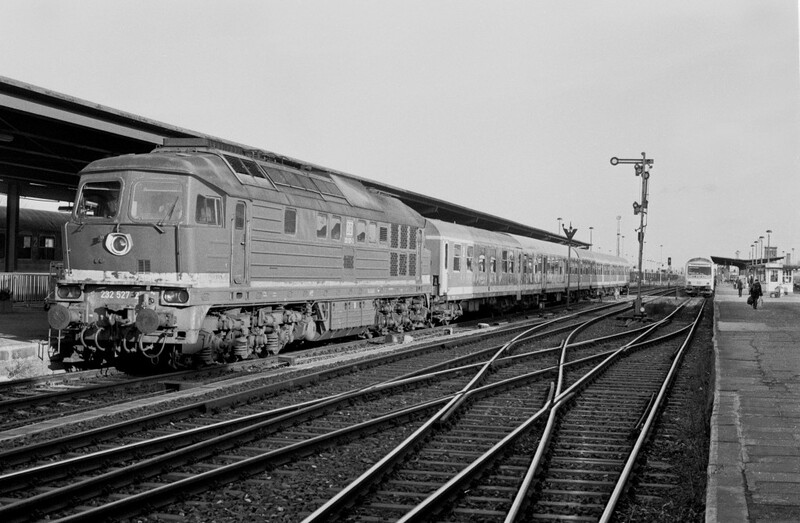 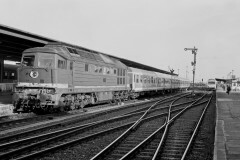 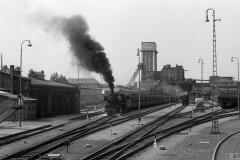 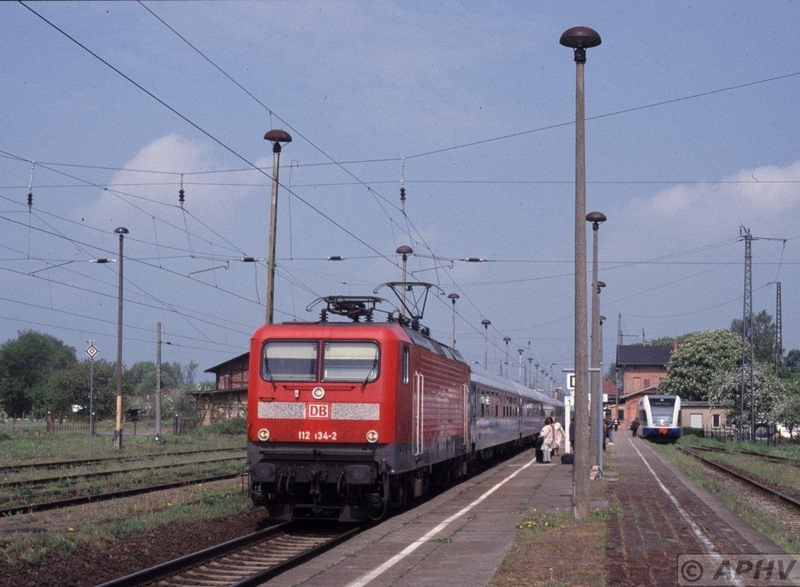 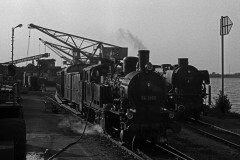 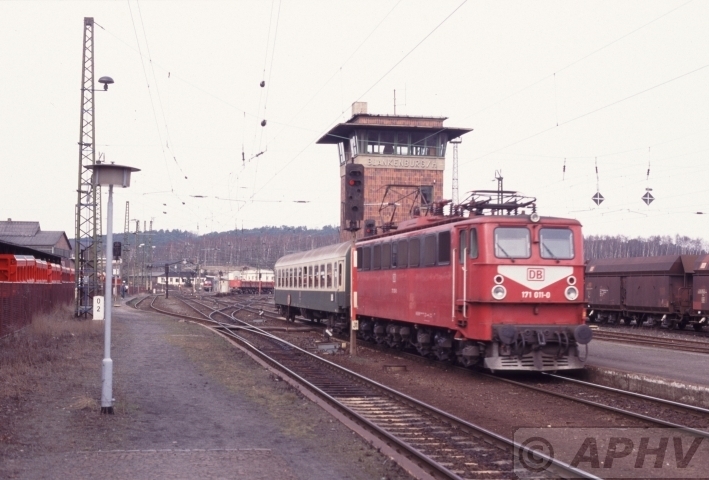 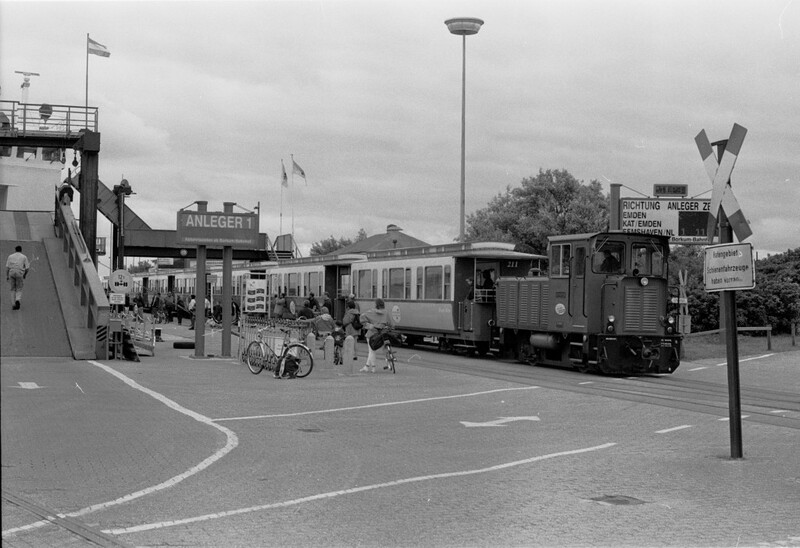 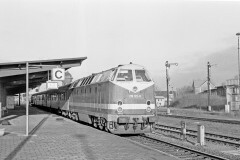 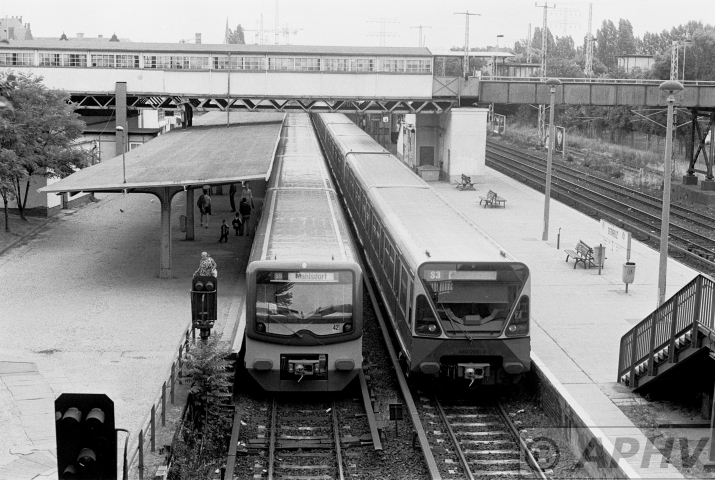 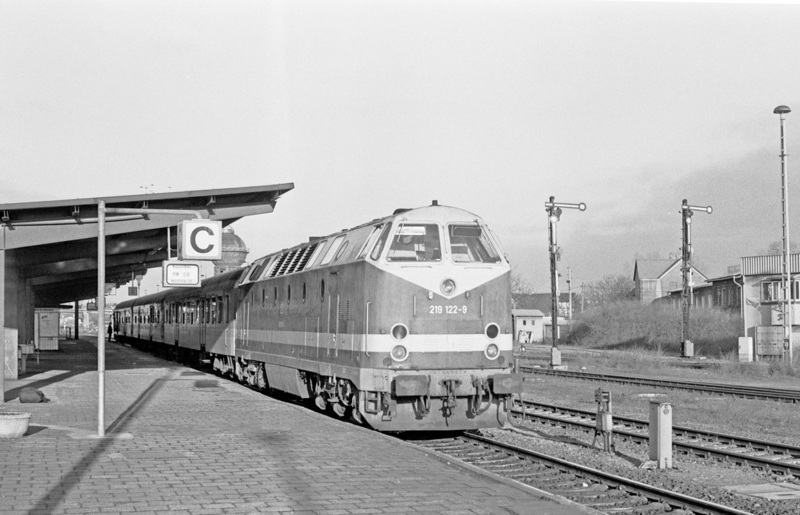 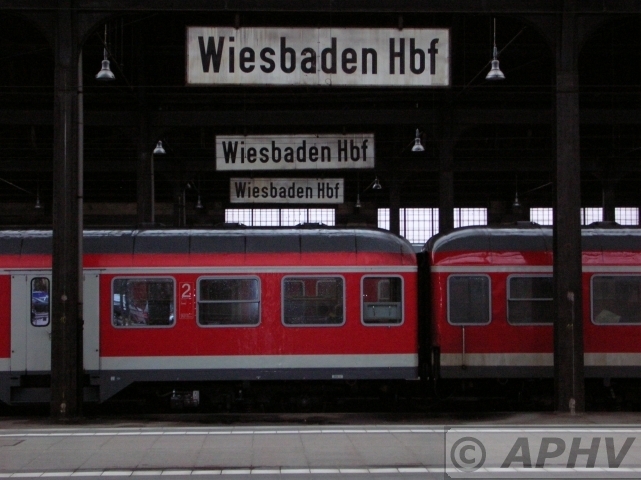 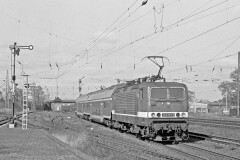 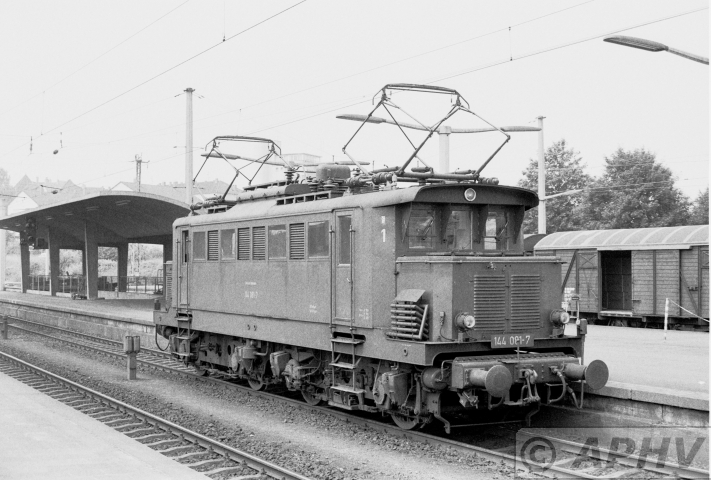 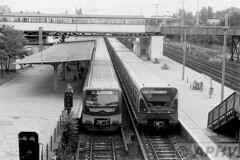 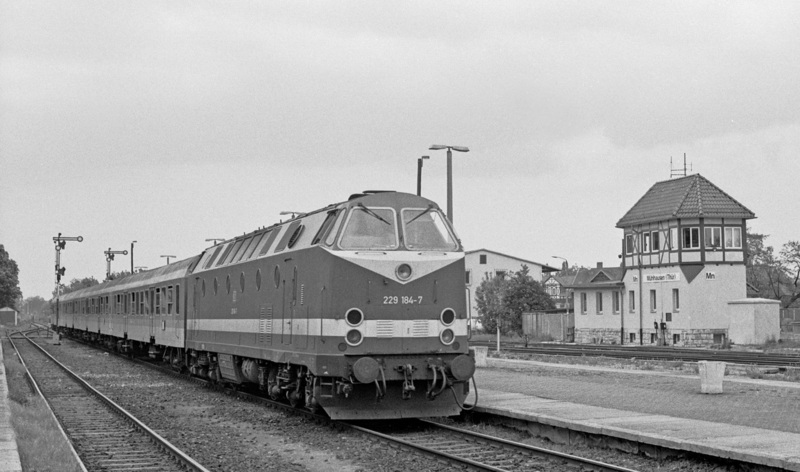 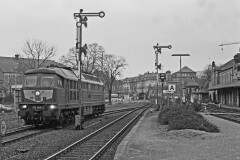 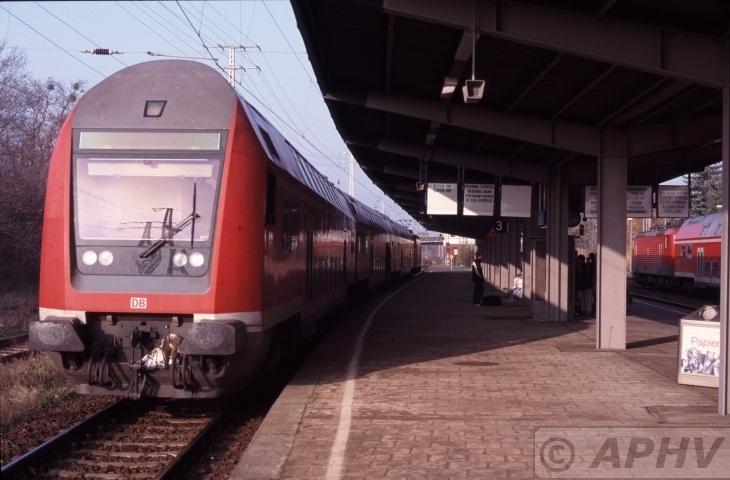 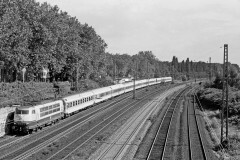 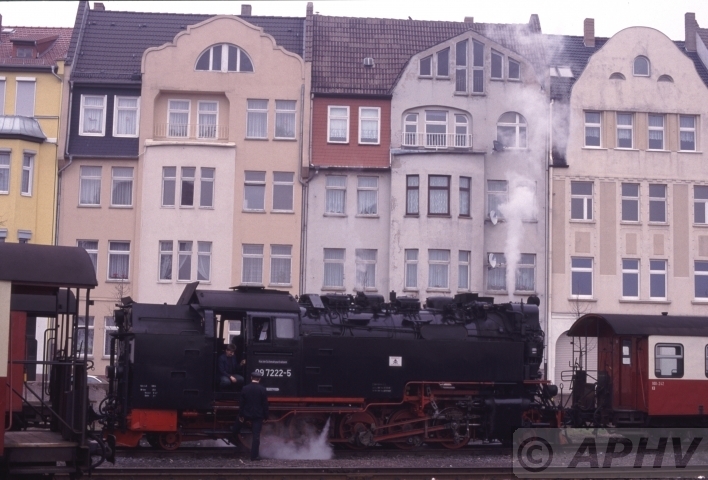 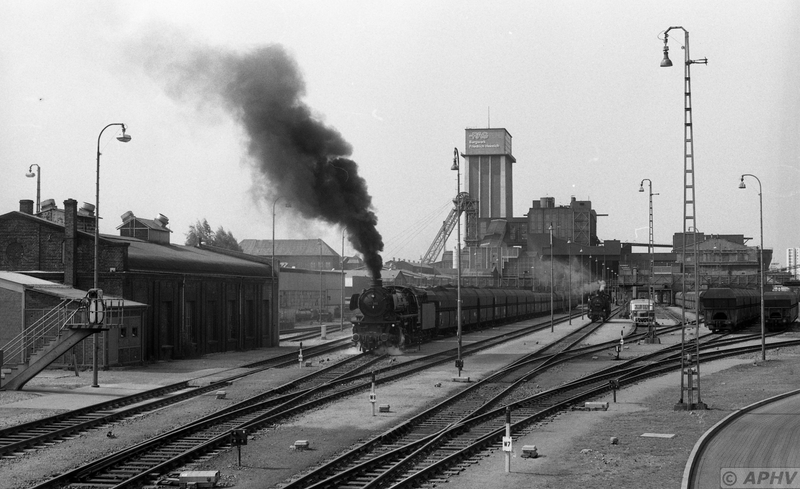 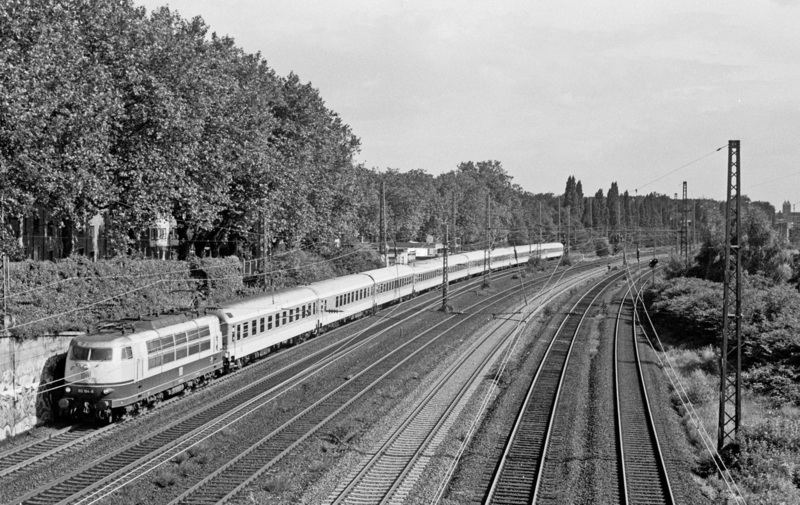 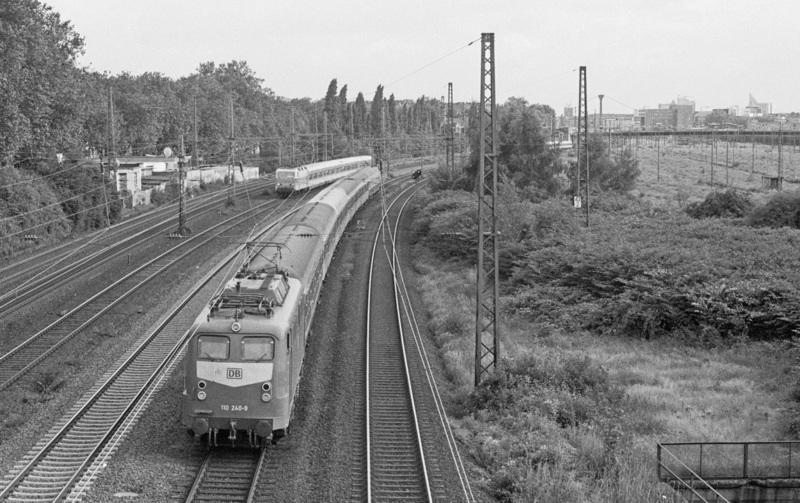 11-6-1980 Heidelberg Hbf. 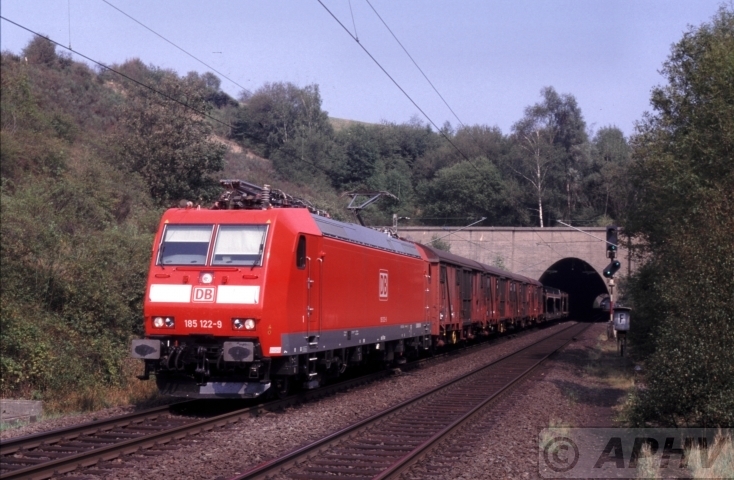 Die UBB wurde 1995 als 100%-ige Tochter der Deutschen Bahn AG gegründet. 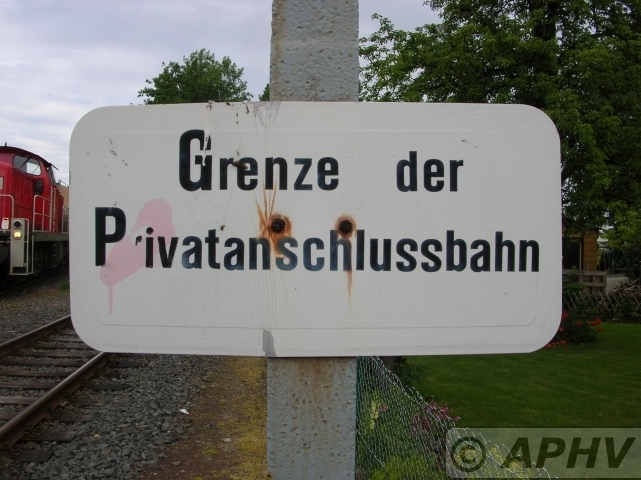 In den darauf folgenden Jahren wurden das völlig marode Schienennetz sowie die überalterte Sicherungstechnik grundlegend saniert. 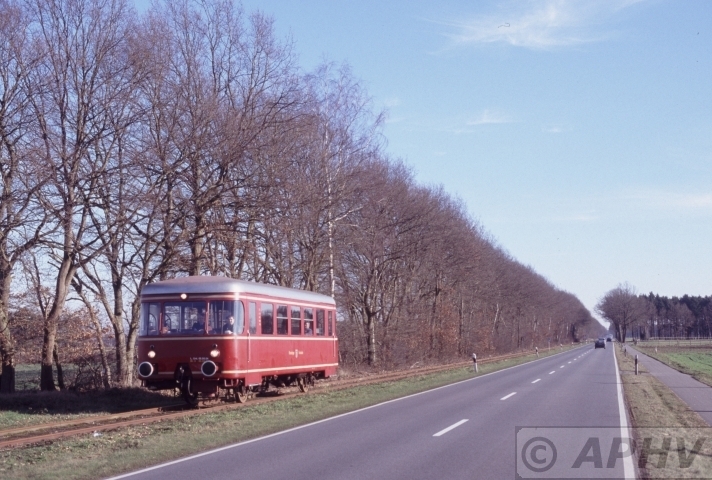 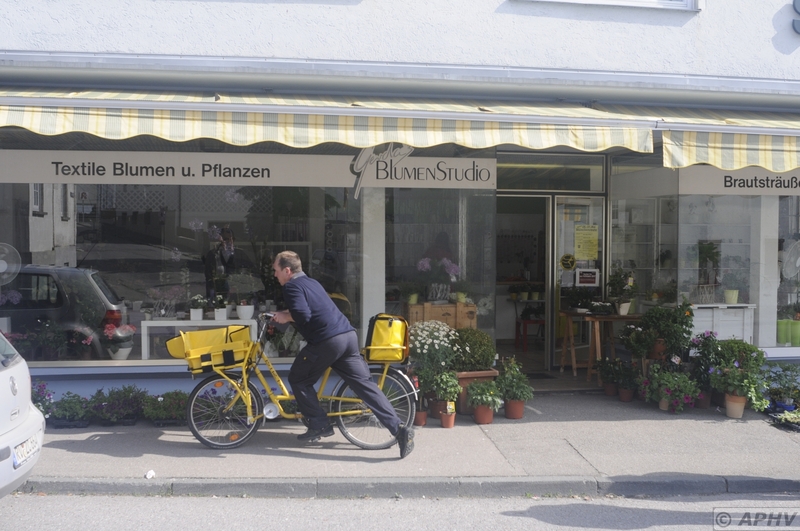 Damit die Fahrgäste nur kurze Wege zu den Zügen der UBB zurücklegen müssen, wurden mehrere neue Haltepunkte errichtet. 22 juni 2004 Bergbau West te Kamp Lintfort. 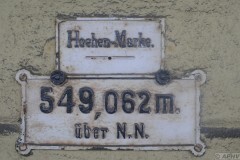 Unter Tage 1100 meter tief. Or 1100 meter below ground. On the photo a large lifting device that holds up the tunnel roof on the corner were the work tunnel and the transport tunnel meet. 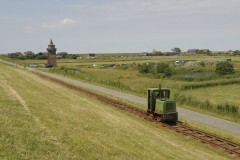 It is able to walk forwards and follow the explatation progress of the work. 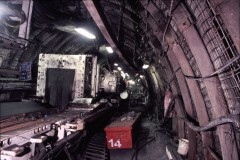 Its here were the coal comes from that fills the trains on ground levell. 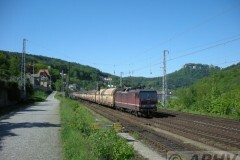 22 June 2004 Bergbau West Kamp-Lintfort 1100 meter “Unter Tage”. 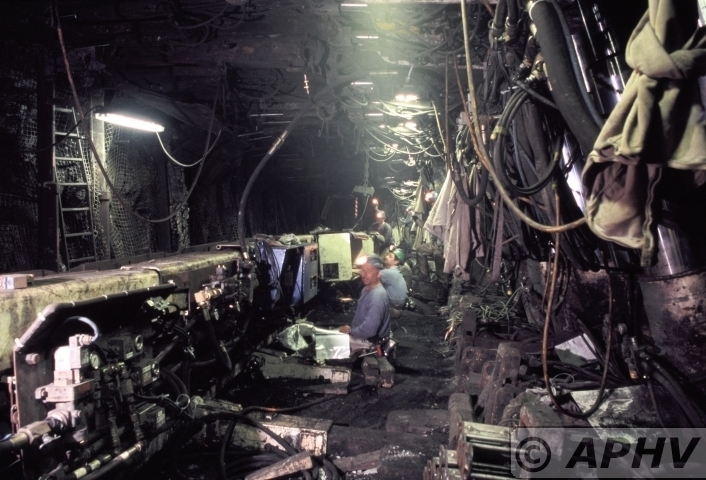 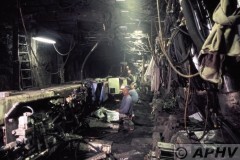 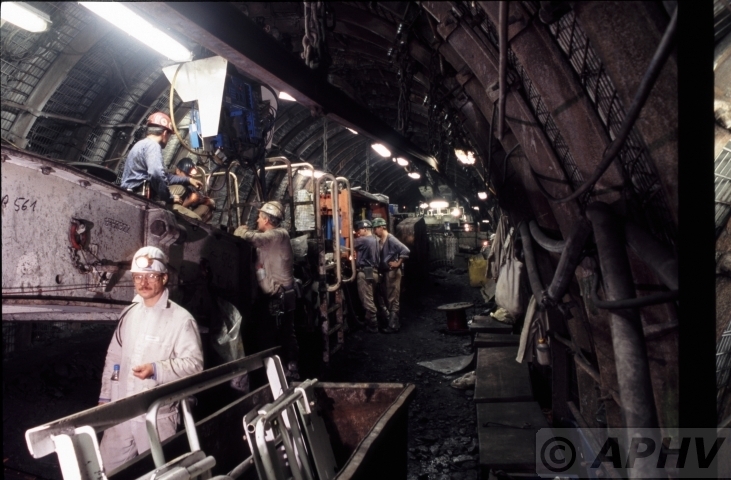 Mechanics are busy installing and testing the equipment that will almost automatically scrape 8000 tones of coal every 24 hours. 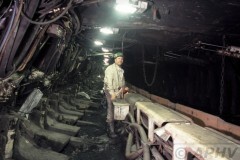 The coal field is on this spot between 2 and 2,5 meter thick. 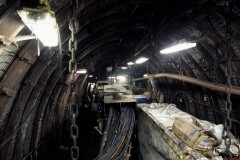 The length off the winning tunnel is 270 meter. 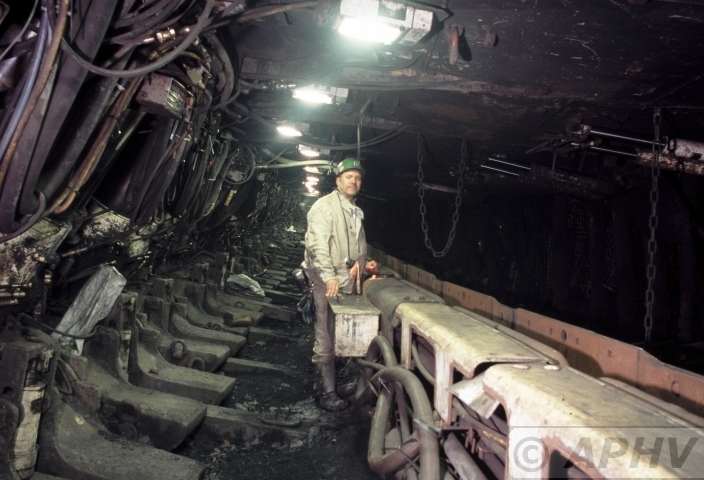 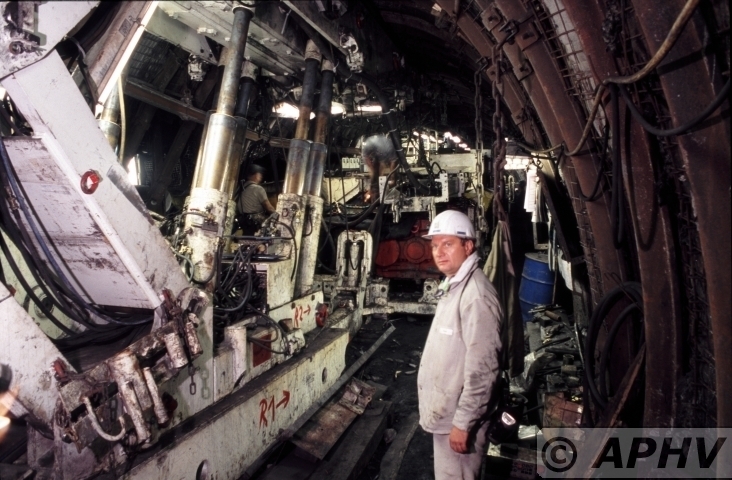 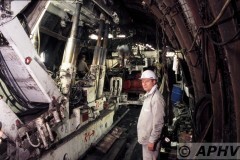 Some 1100 meter deep in the coal layer. 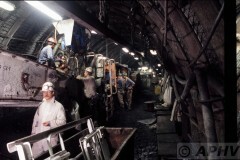 The hight is here between 2 and 2,5 meter and this winning tunnel follows the coal field. 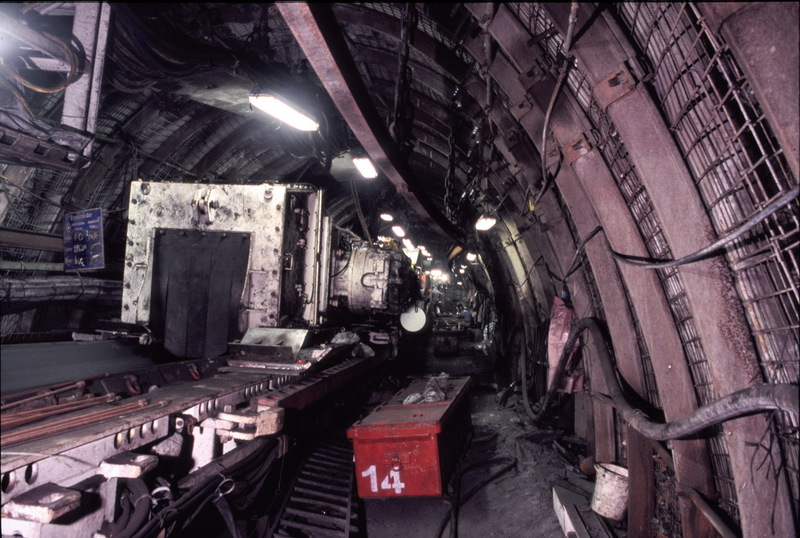 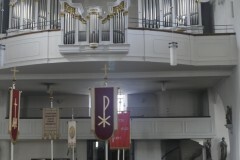 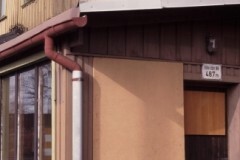 On the left the hydrailic struts that computerised will walk forward (to the right) on the moment the winning on the right side starts. 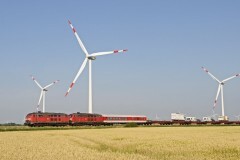 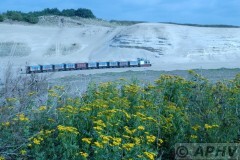 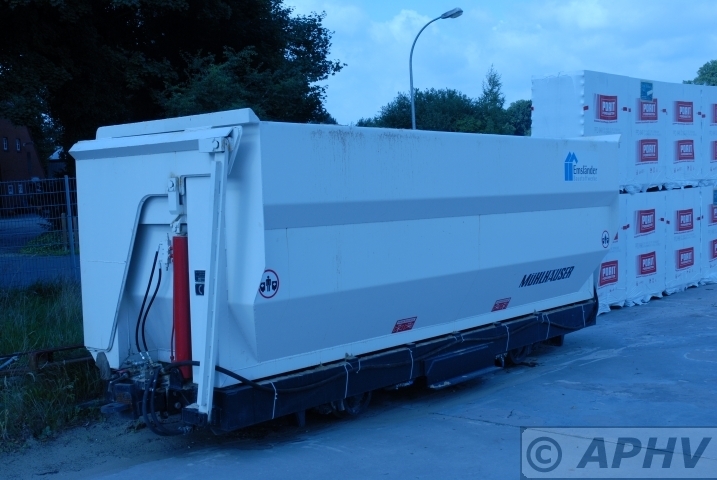 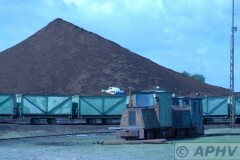 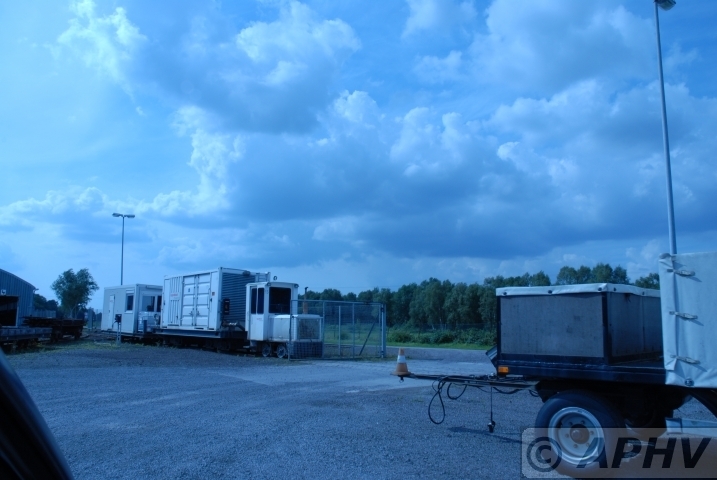 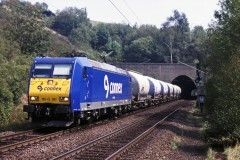 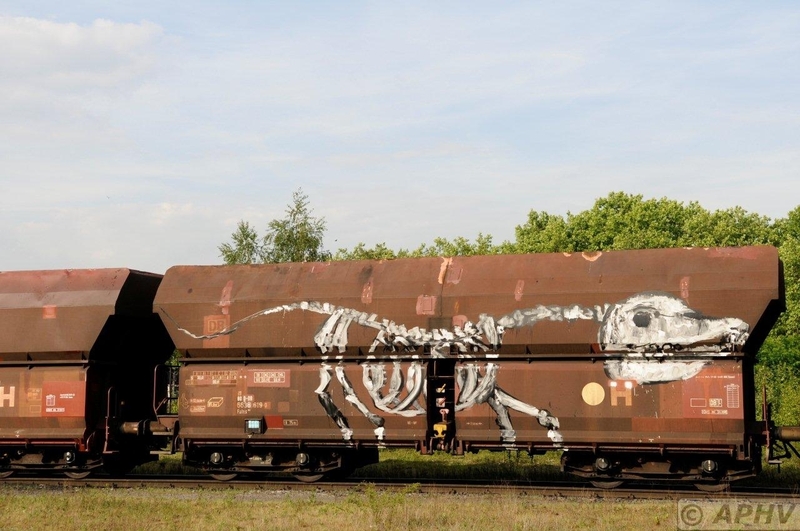 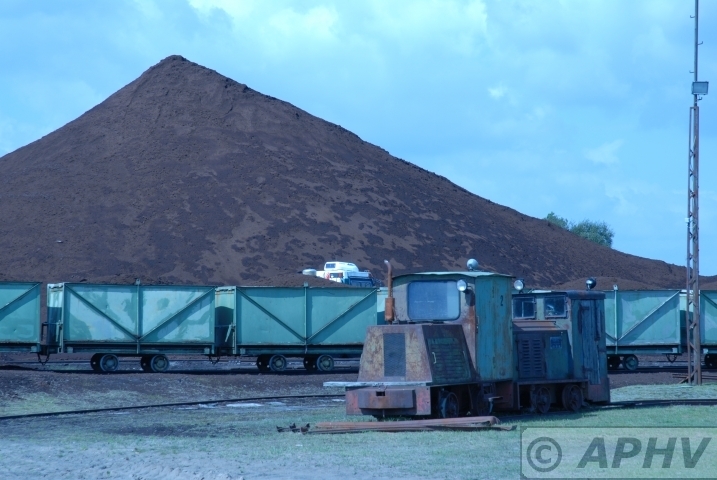 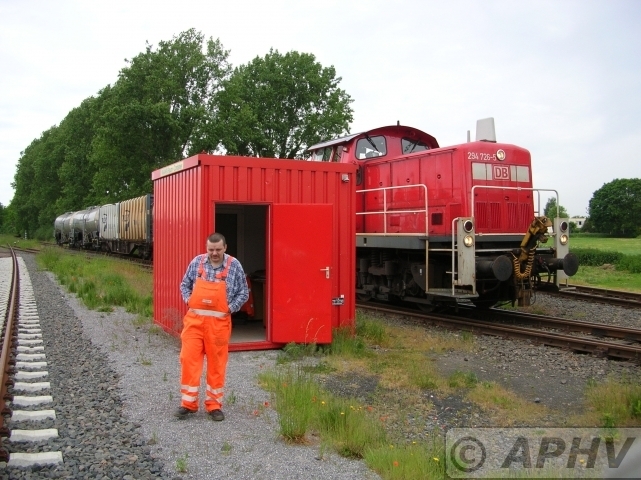 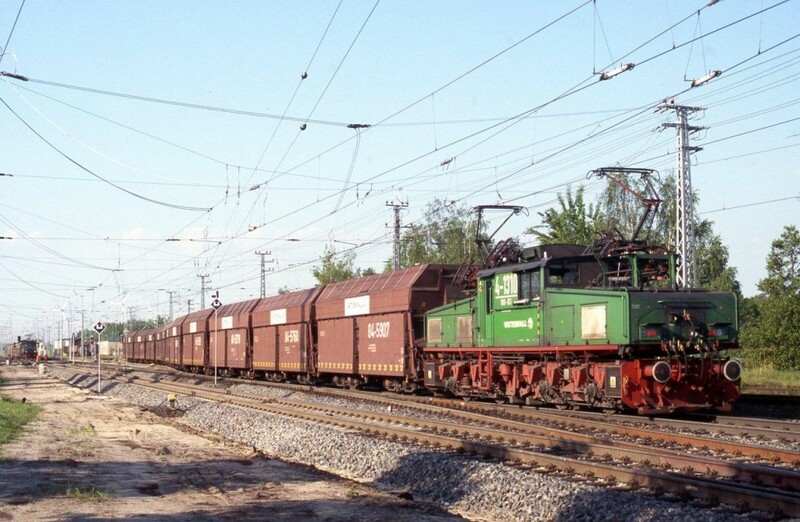 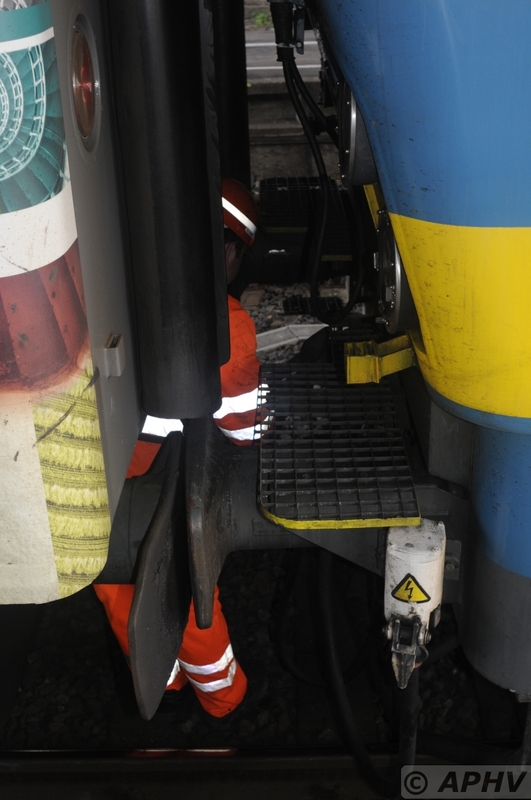 This transport equipment moves the coal away. The winning field is on the right side. Am 1. 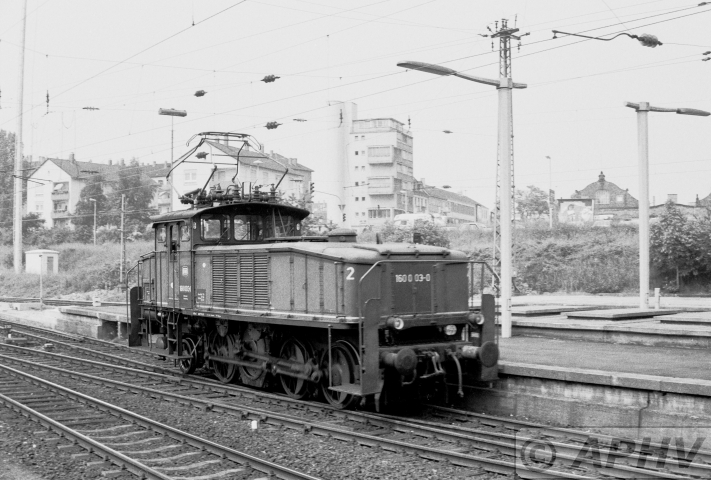 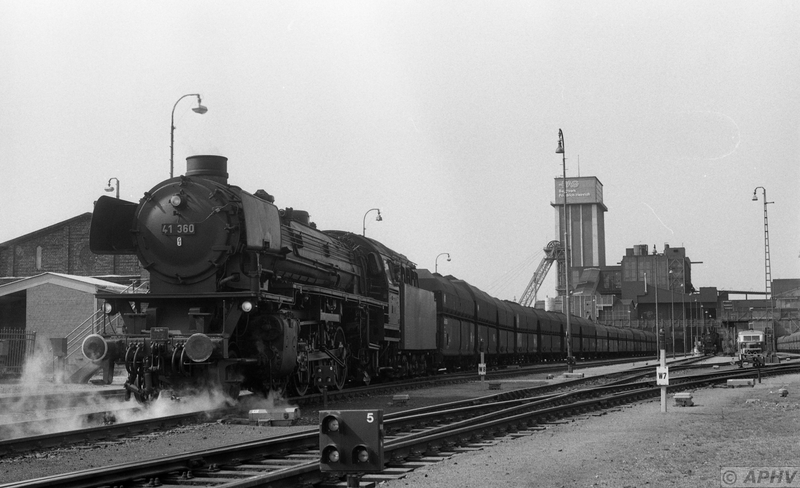 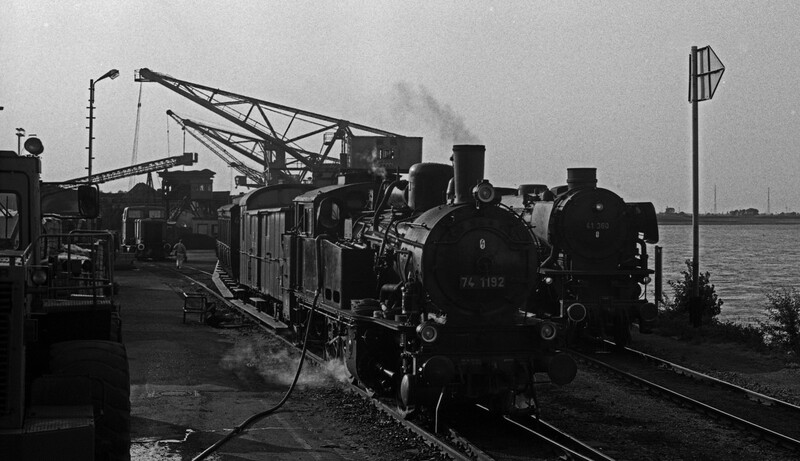 Januar 1950 wurde die 1946 verstaatlichte Halberstadt-Blankenburger Eisenbahn von der Deutschen Reichsbahn übernommen. 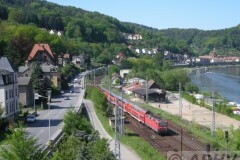 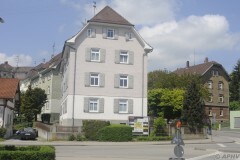 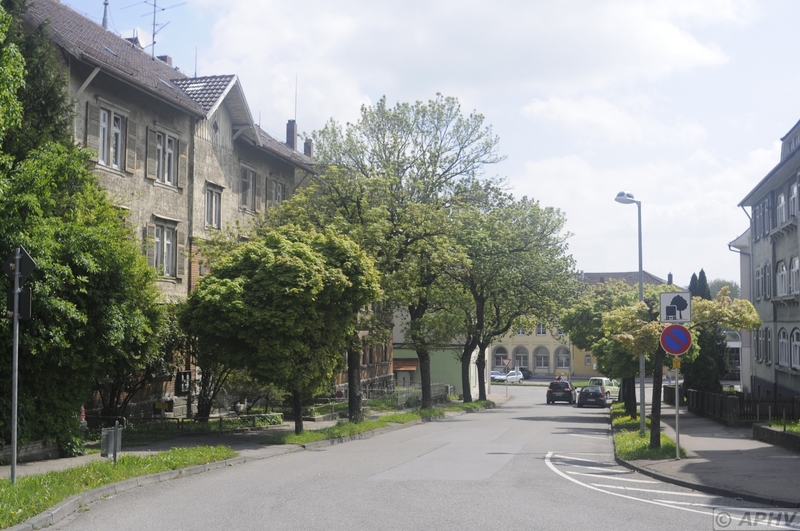 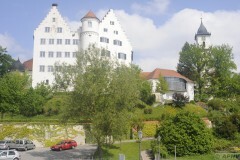 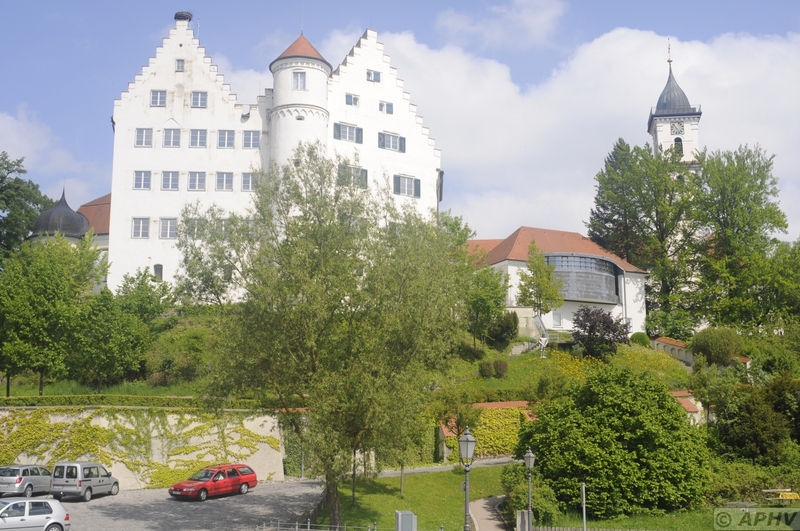 Aulendorf liegt inmitten des Schwäbischen Oberlandes zwischen Donau und Bodensee, umgeben von Wiesen, Mooren und Wäldern, an der Oberschwäbischen Barockstraße und an der Schwäbischen Bäderstraße. 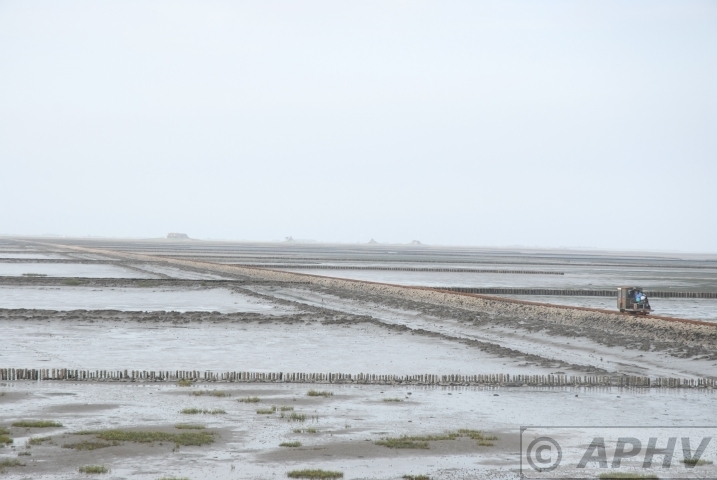 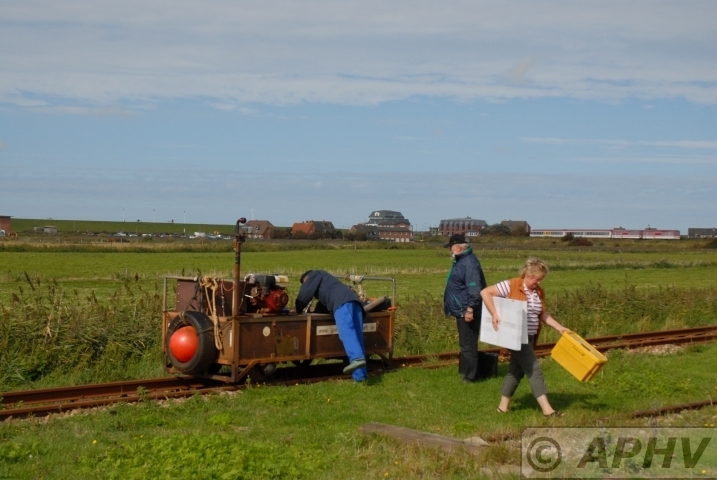 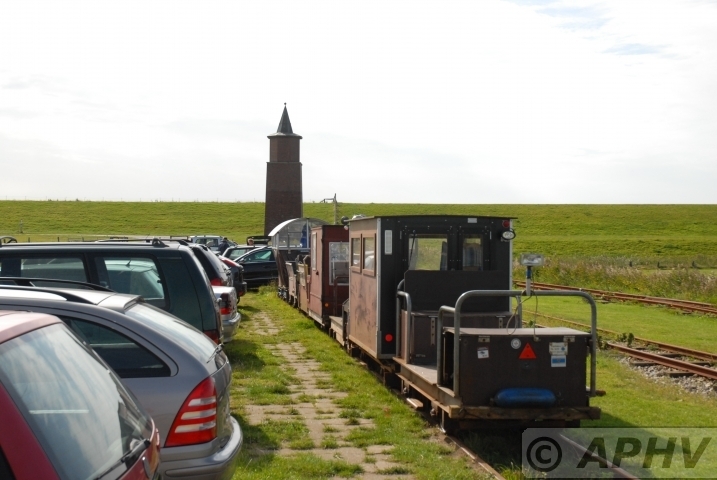 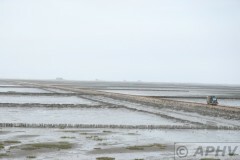 A Hallig (plural Halligen) is one of the ten small German islands without protective dikes in the North Frisian Islands on Schleswig-Holstein’s Wadden Sea-North Sea coast in the district of Nordfriesland. 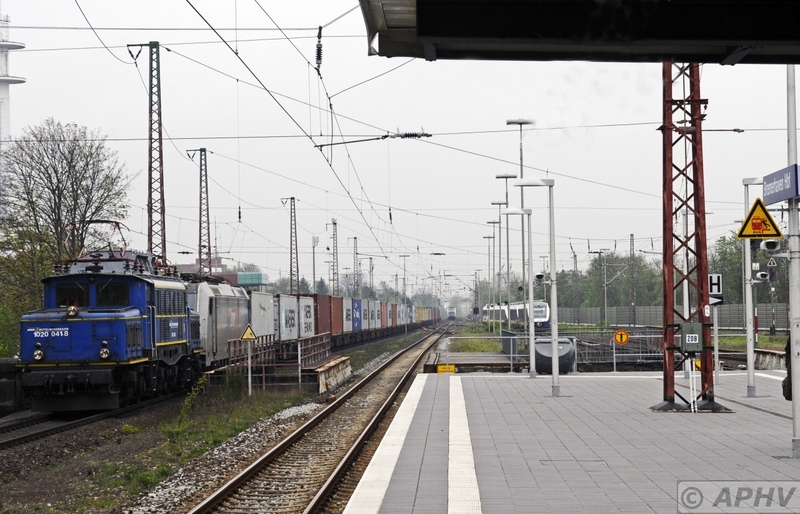 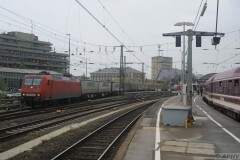 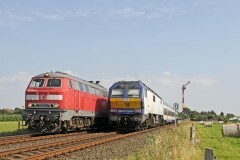 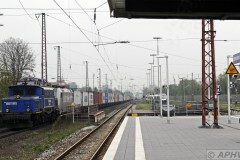 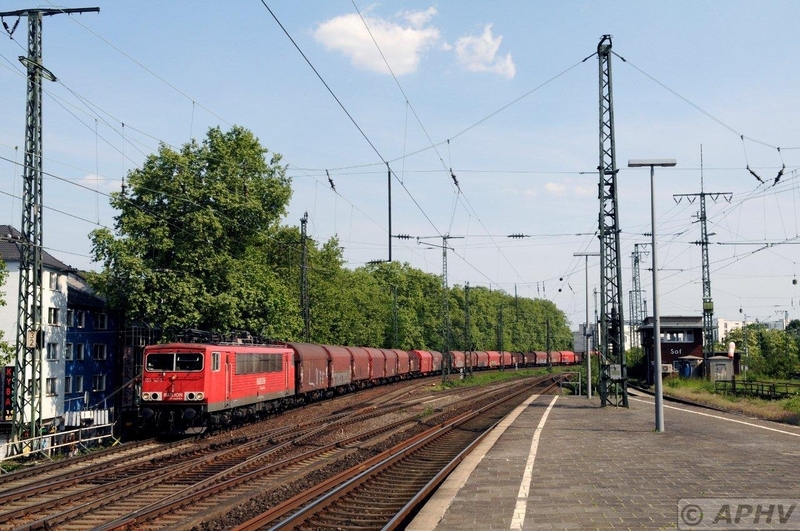 The EVB cooperates with MWB and here MWB 1020-041 pulles a containertrain through Bremerhafen Hbf towards Bremen while the EVB Trax is a sleeping second. 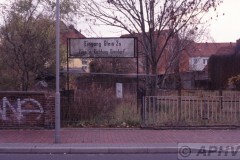 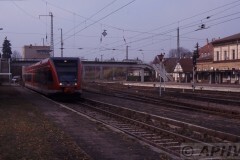 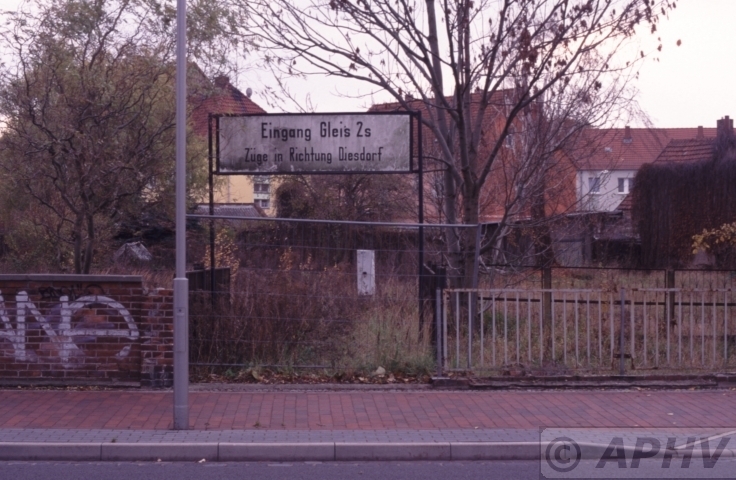 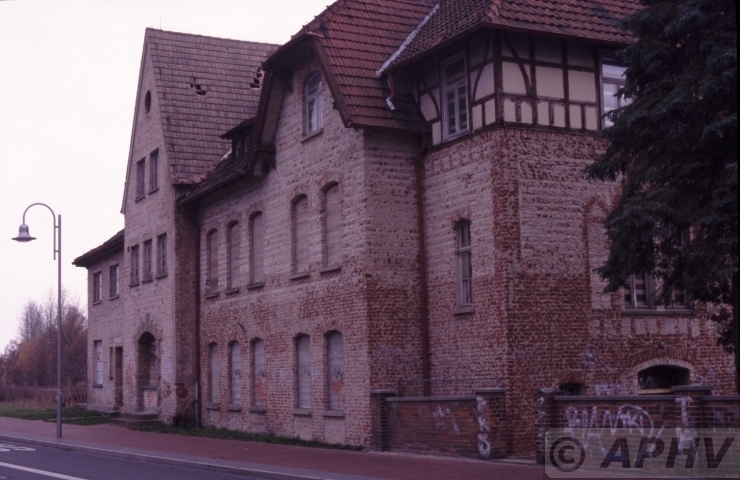 Belzig 9 November 2003. 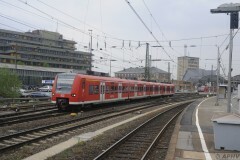 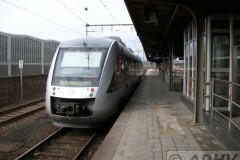 Stadler build DB946-024/524 after arriving from Brandenburg. 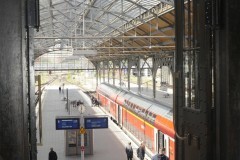 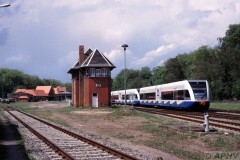 The main line station has another building on the other side off the line. 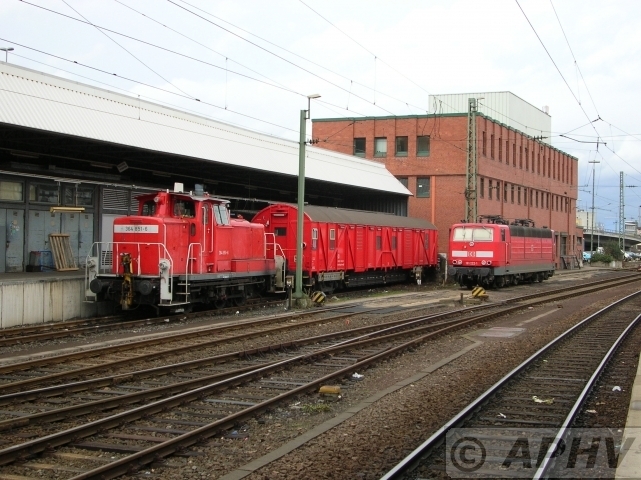 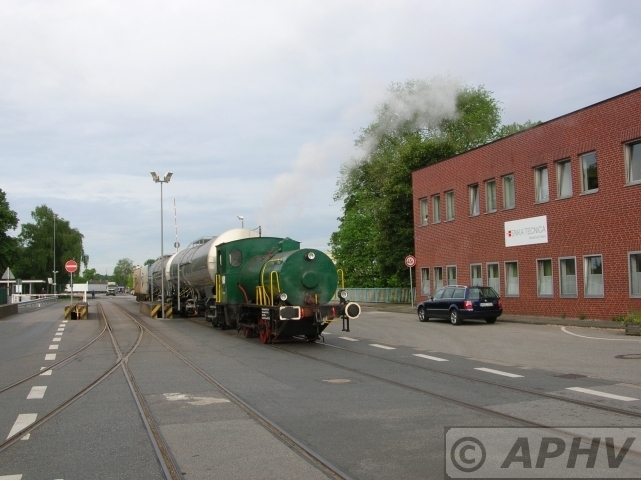 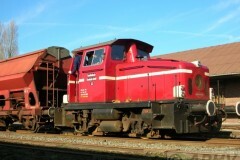 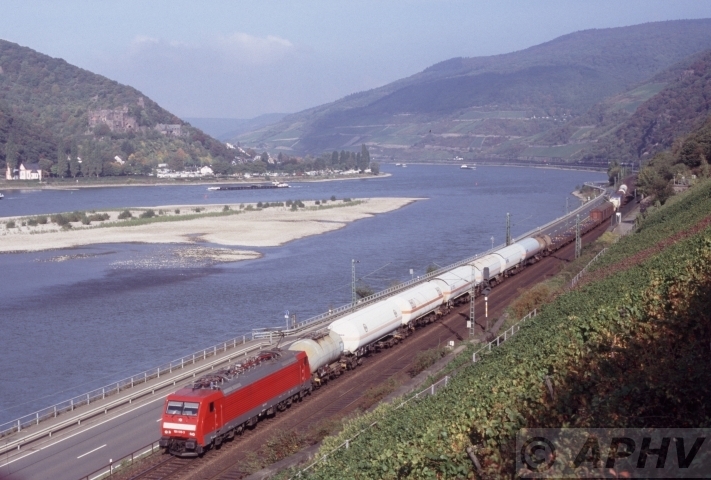 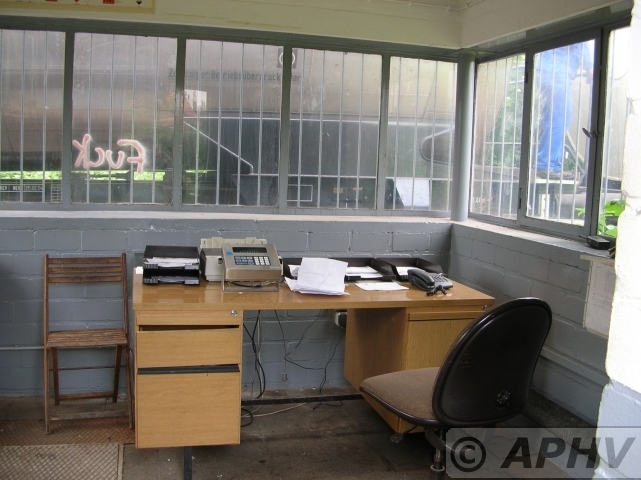 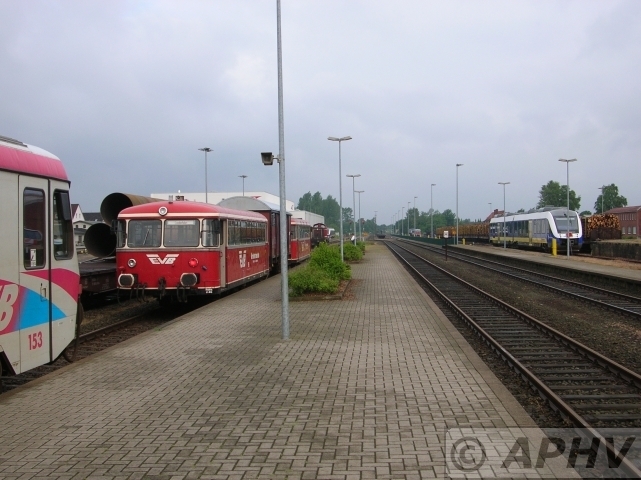 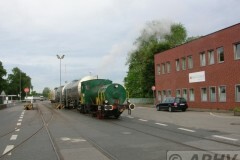 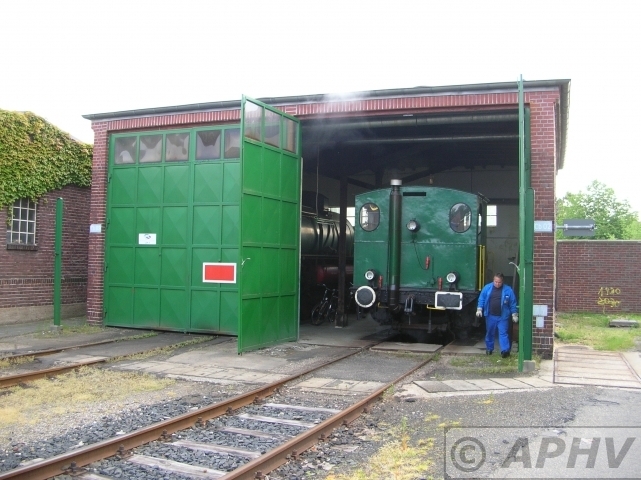 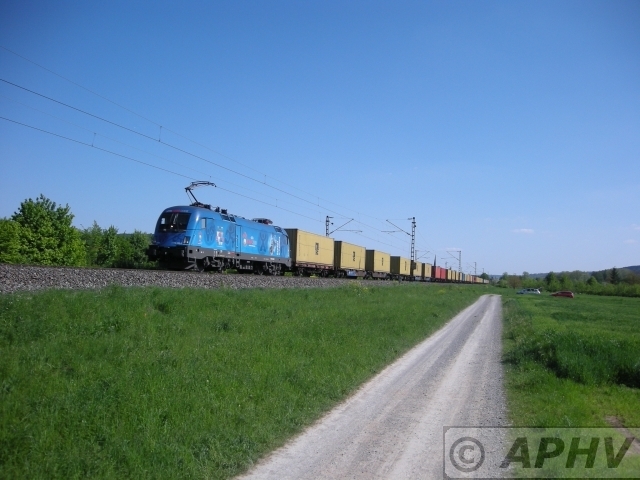 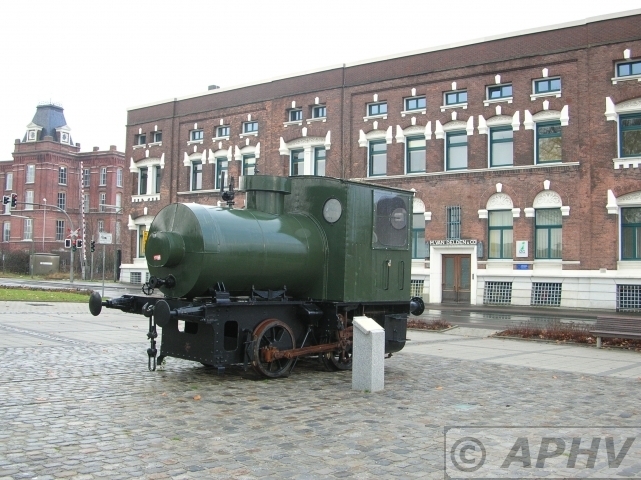 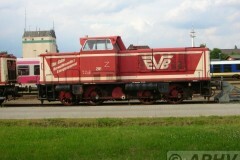 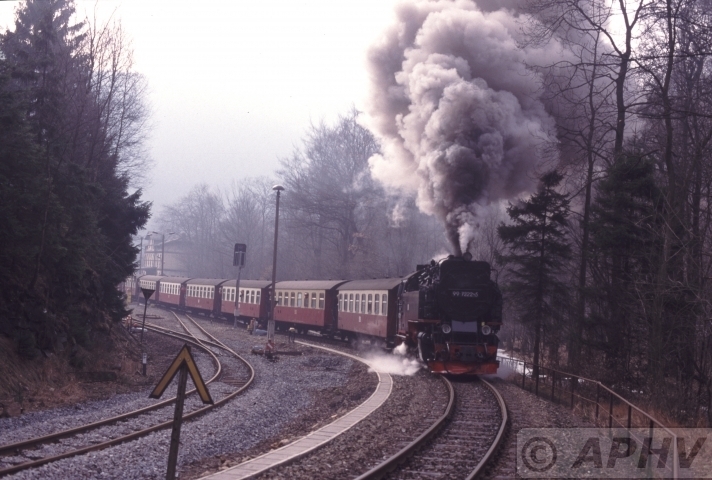 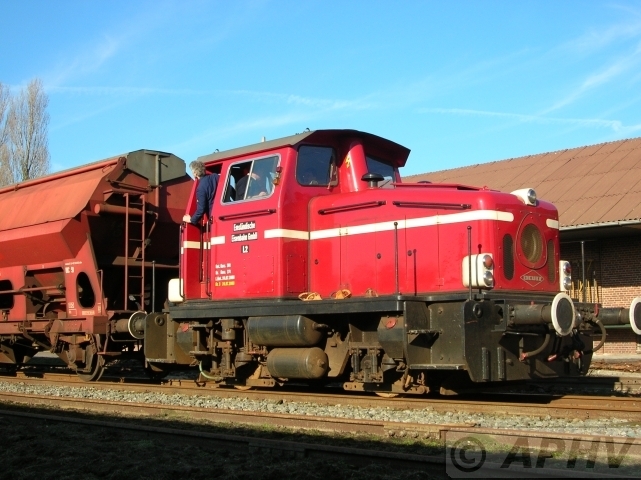 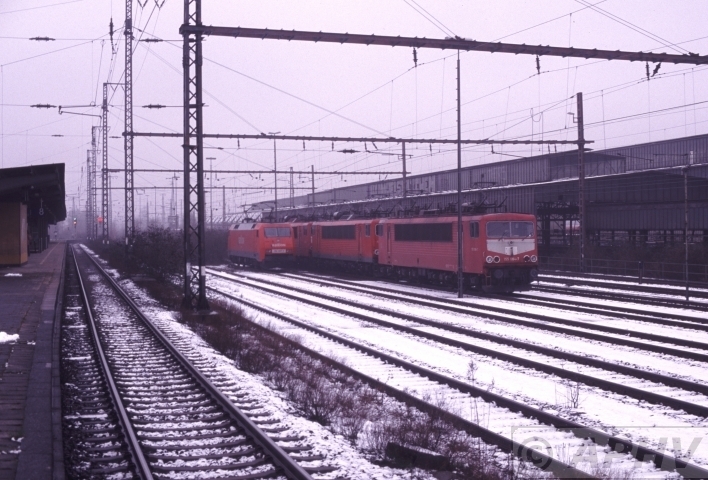 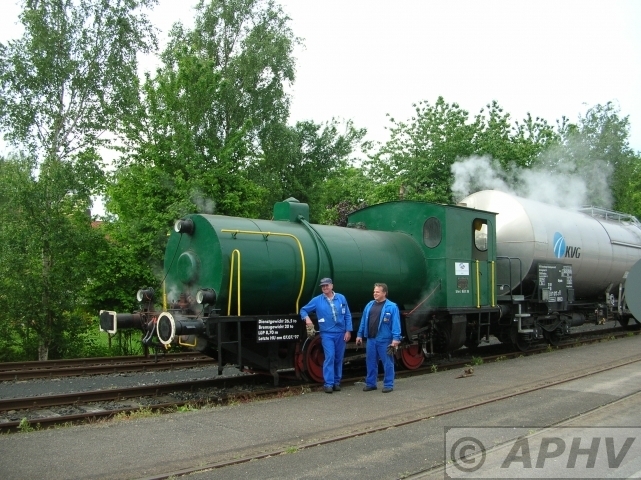 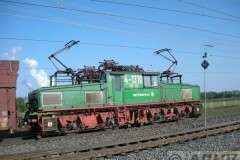 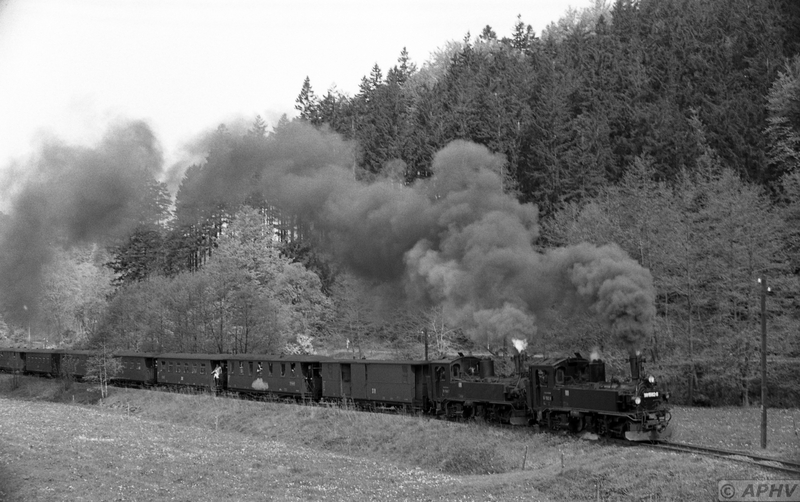 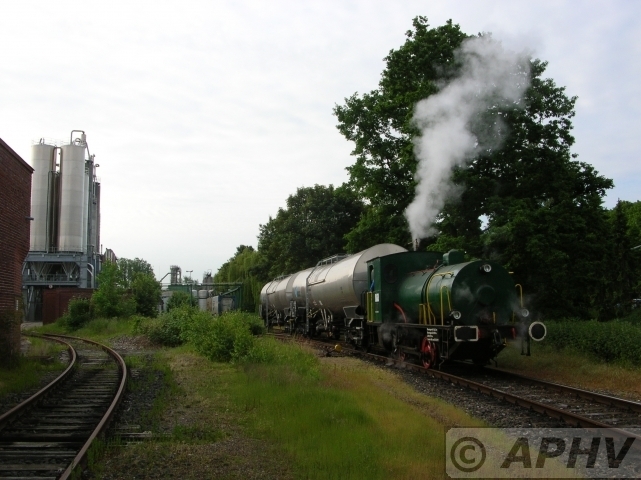 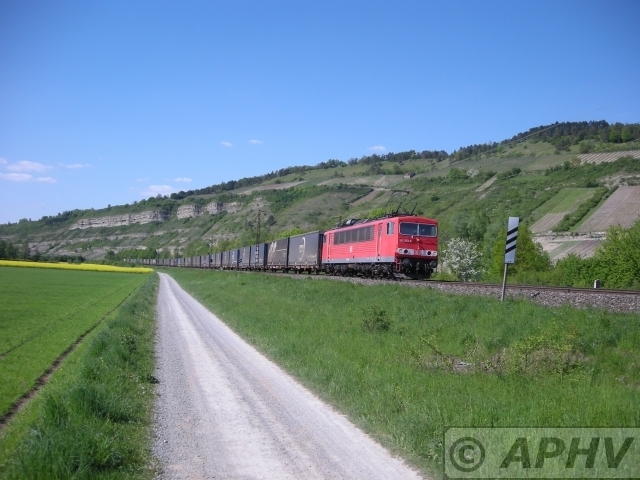 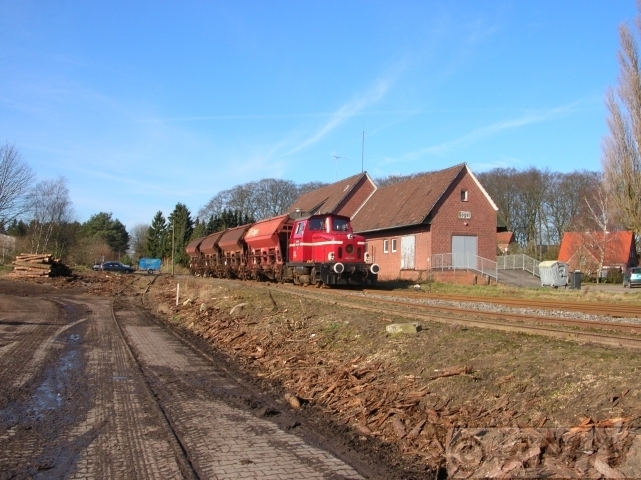 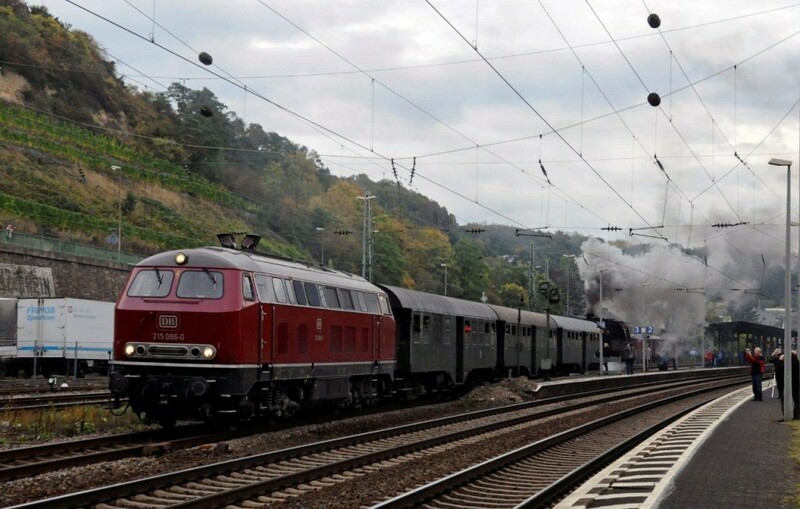 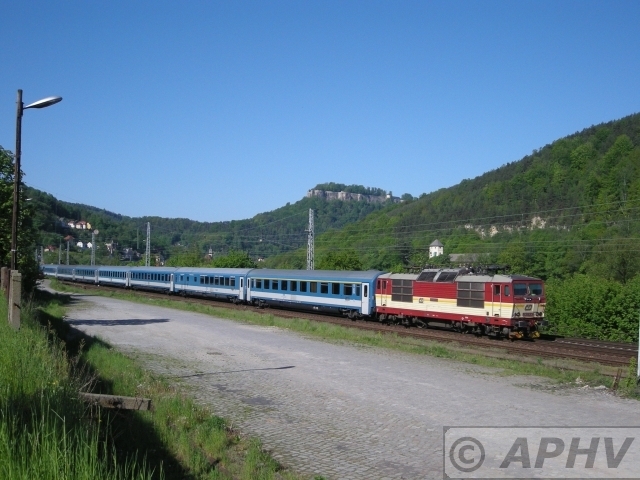 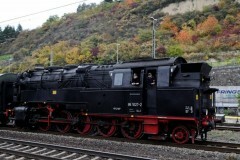 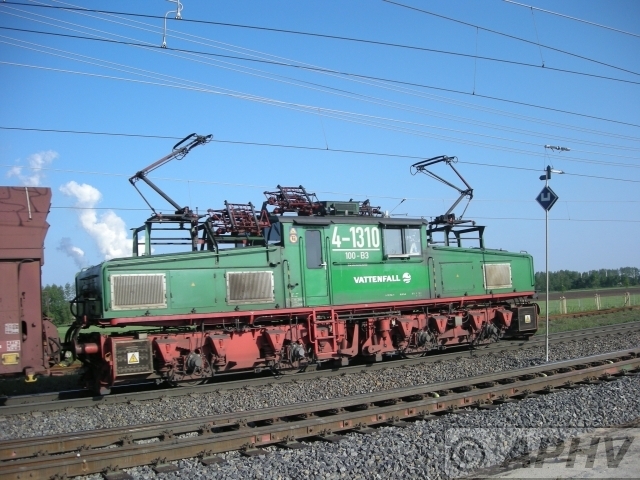 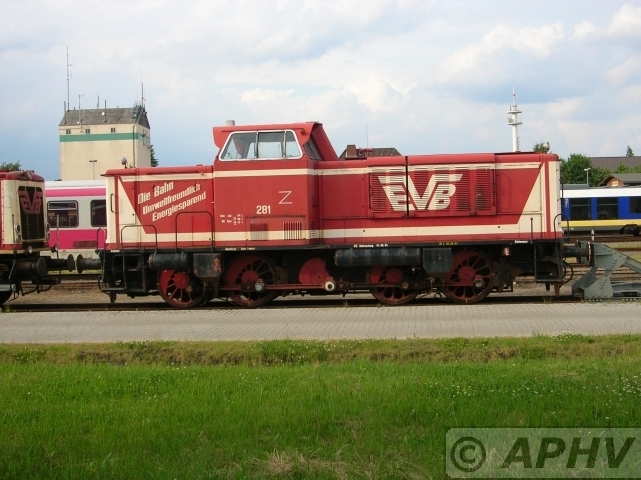 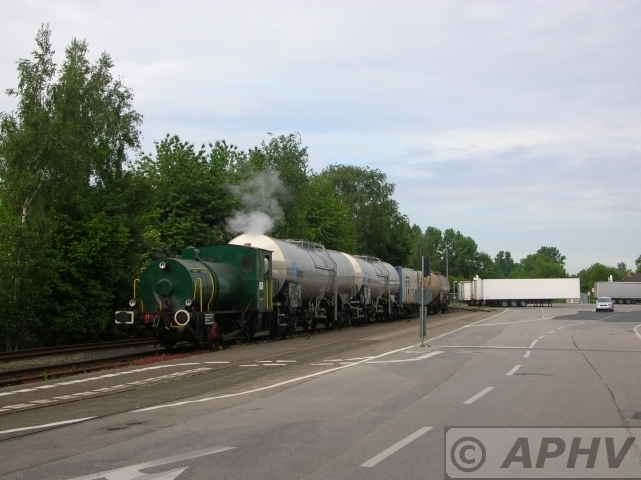 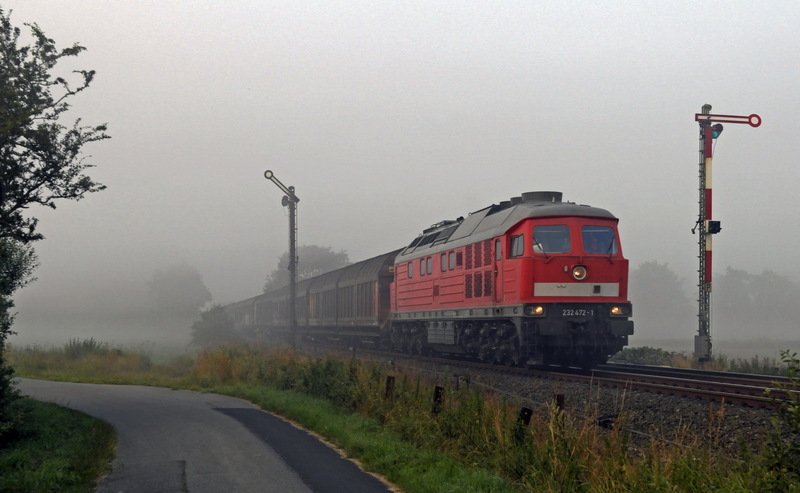 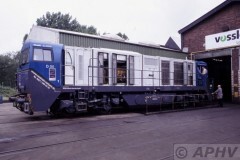 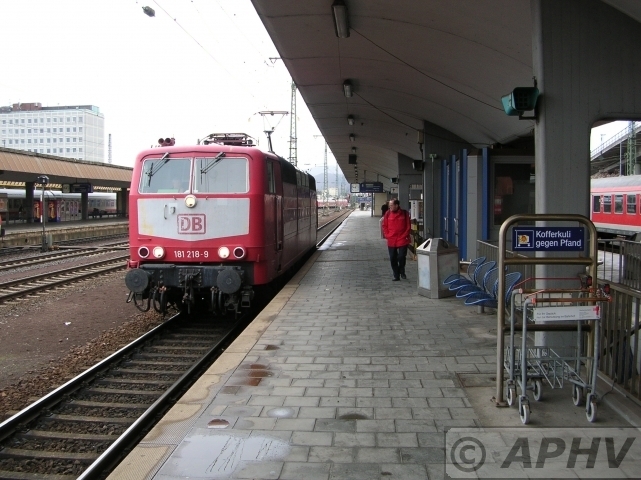 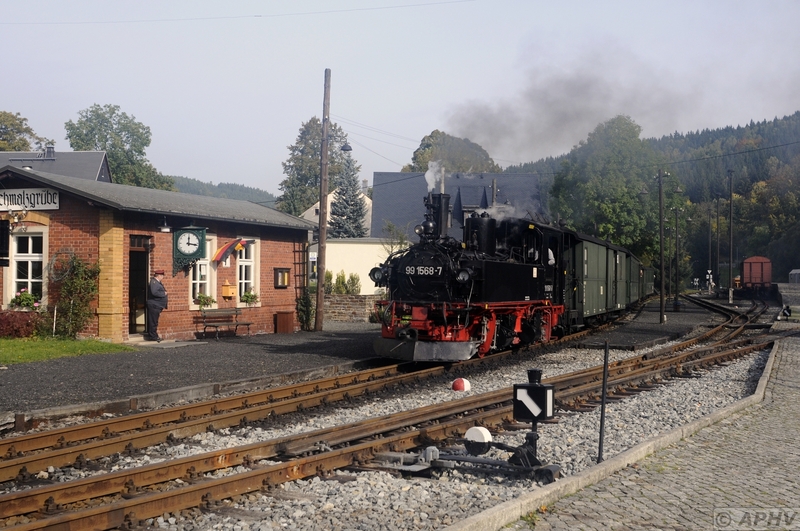 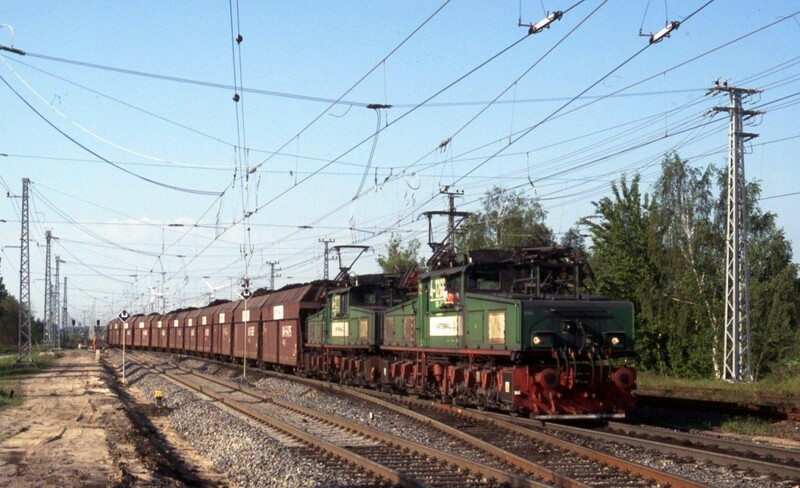 8 November 2003 at Salzwedel Kbs 303 was only operated in the week ends at this date. 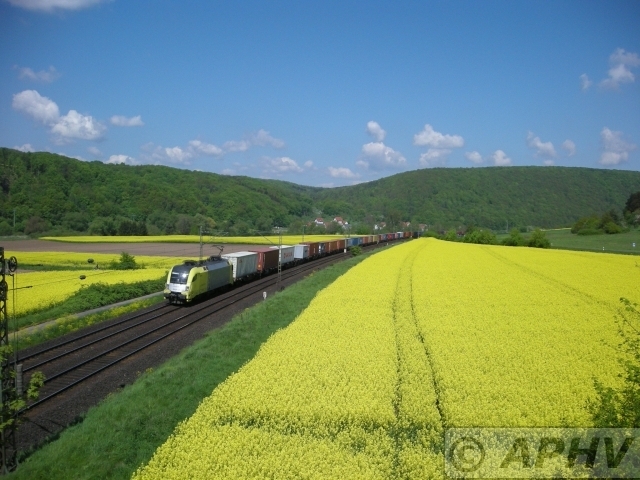 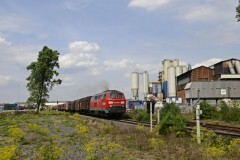 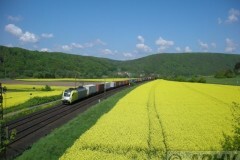 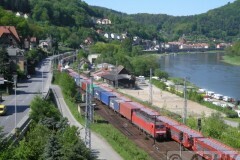 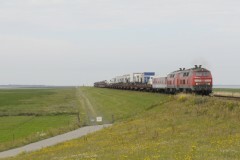 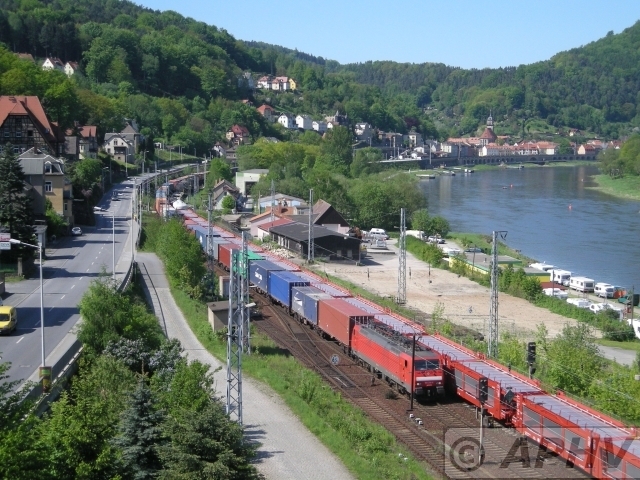 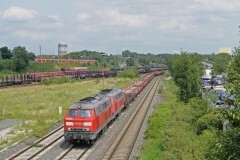 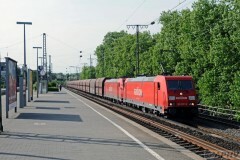 As a great surprise Ferkeltaks 772-414-8 appeared to make the run to Wittenberge. 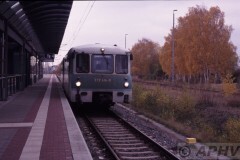 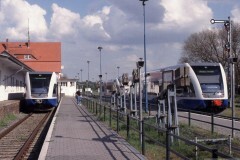 8 November 2003 Salzwedel Lokalbahnhof old platforms to Diesdorf. 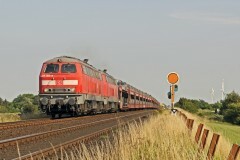 Bhf Aewndsee Altmark 772-155 & 972-755 passing with 772-414 & 972-709 in a fading light. 8 November 2003 Salzwedel Lokalbahnhof closed and falling to pieces. 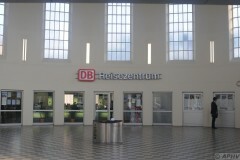 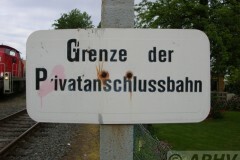 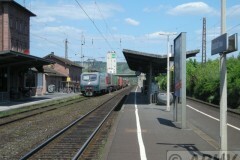 It was here that the train to Diesdorf departed. 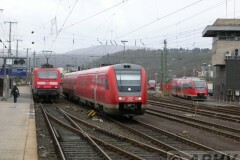 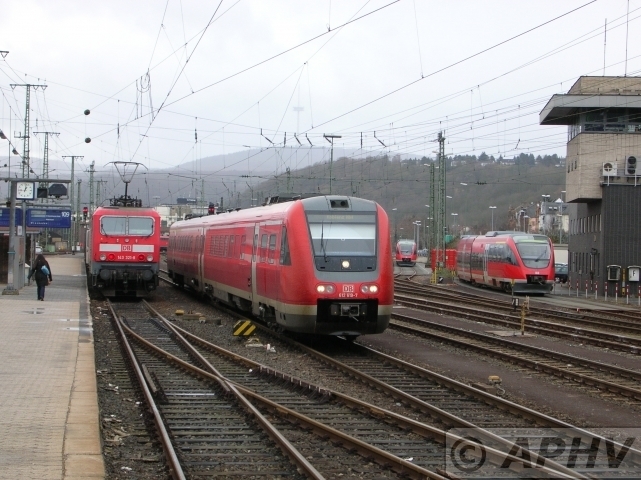 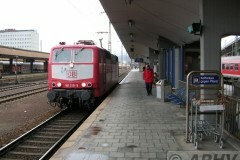 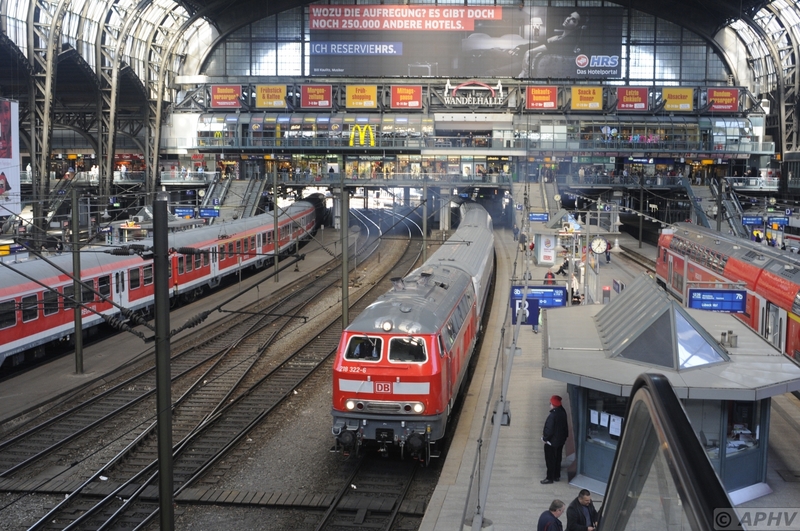 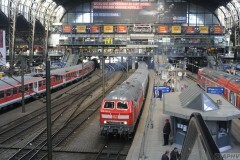 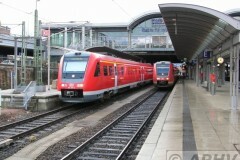 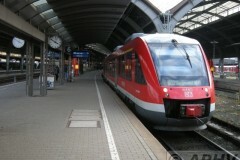 18-2-2006 Koblenz Hbf with DB143-321 awaiting departure with its Rb push and pull train and DB614-619 arriving. 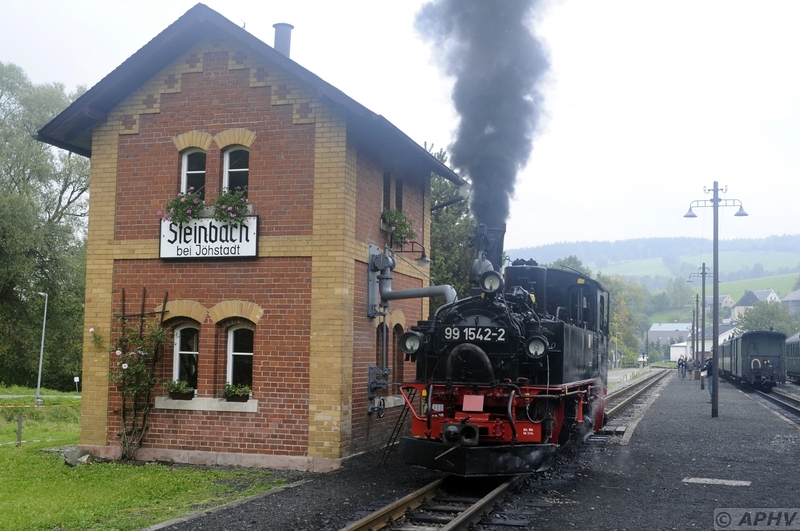 Due to the weak German economy the reopening of the beautifull Siershain to Engers 22 kilometer seems to be postphoned for ever. 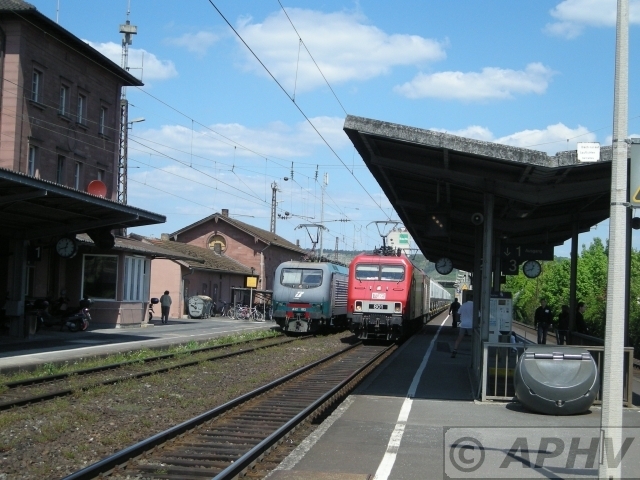 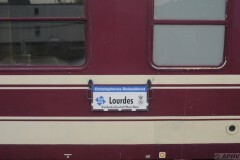 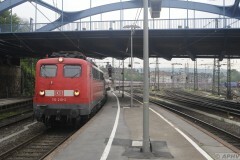 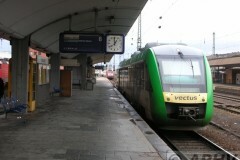 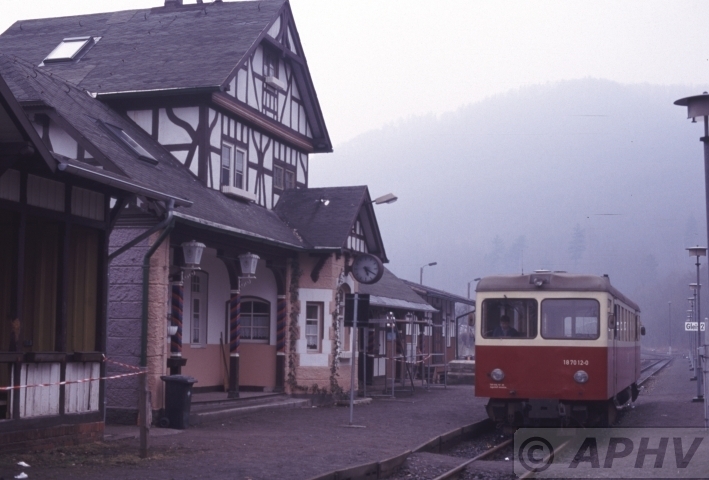 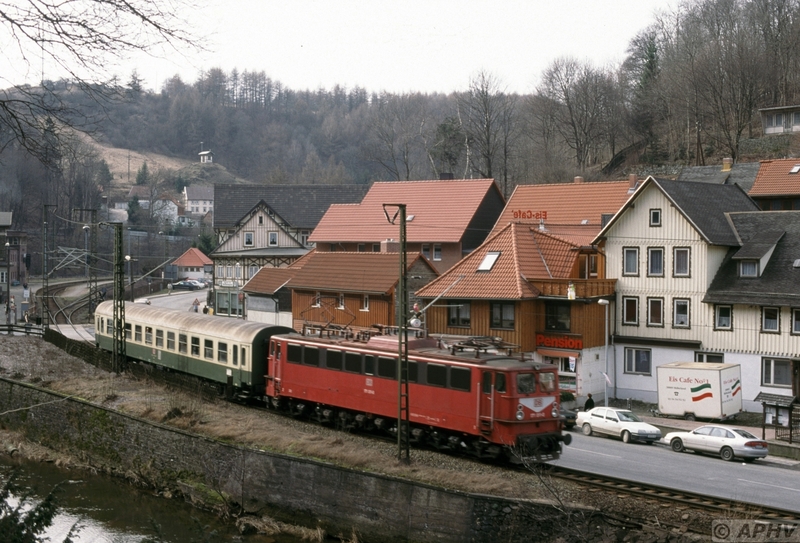 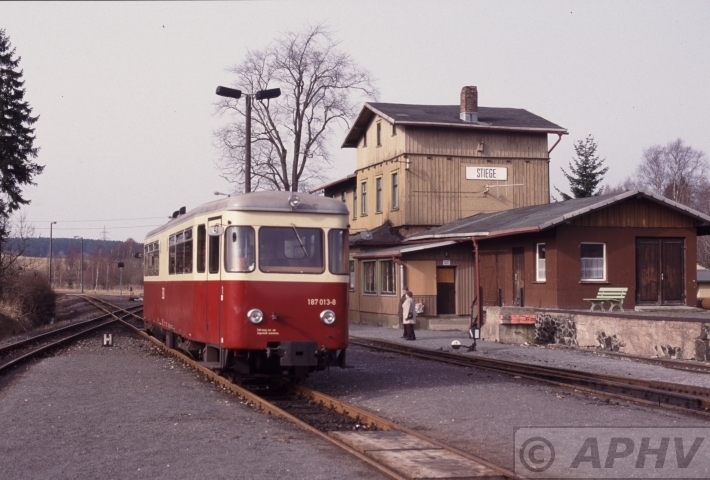 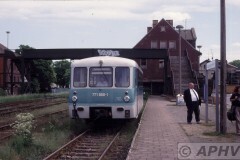 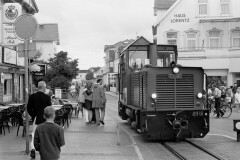 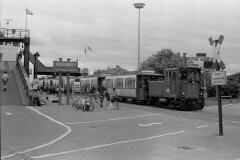 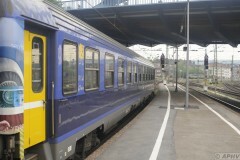 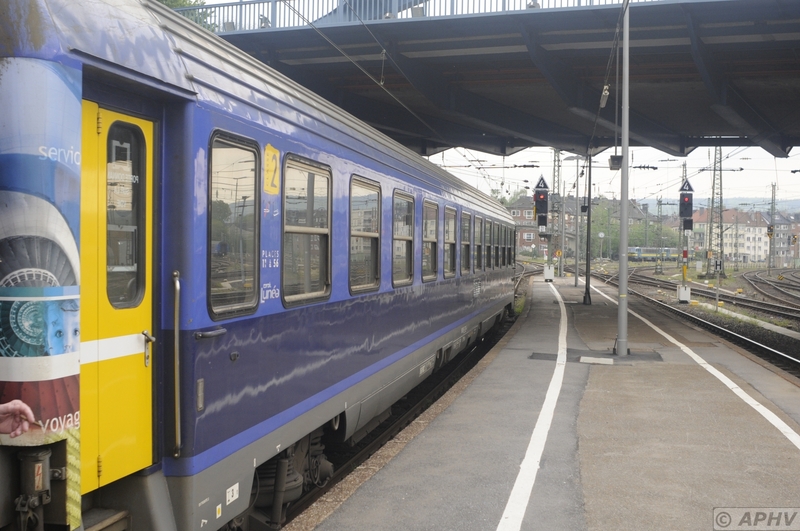 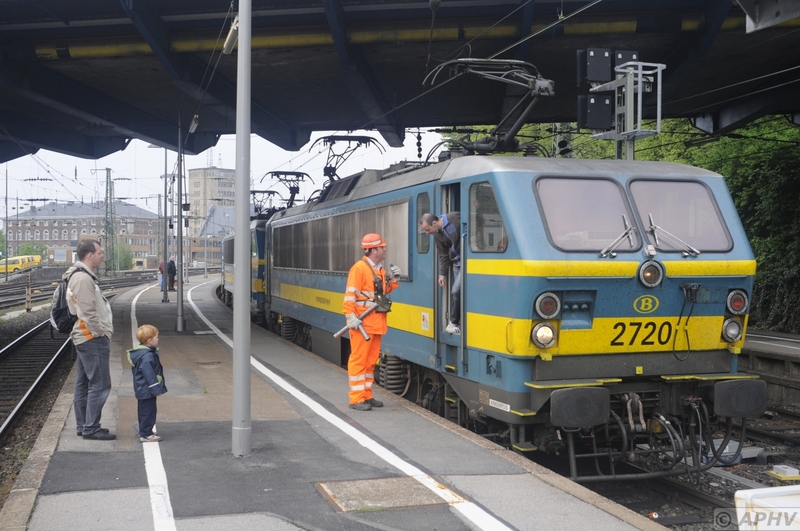 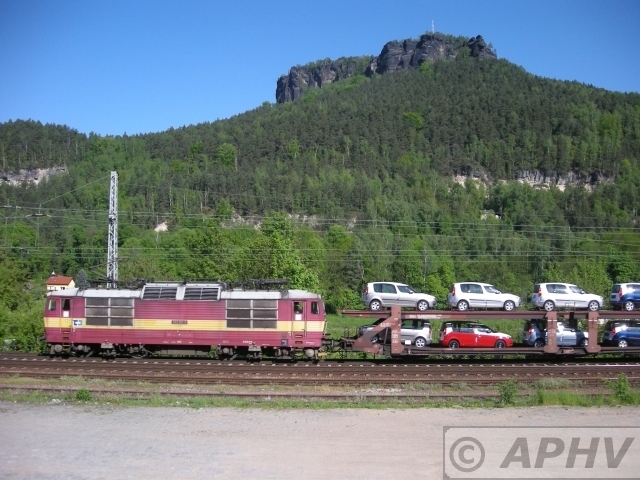 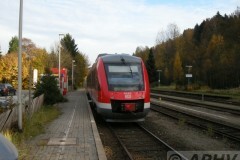 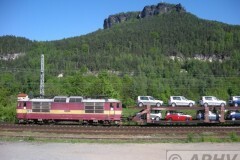 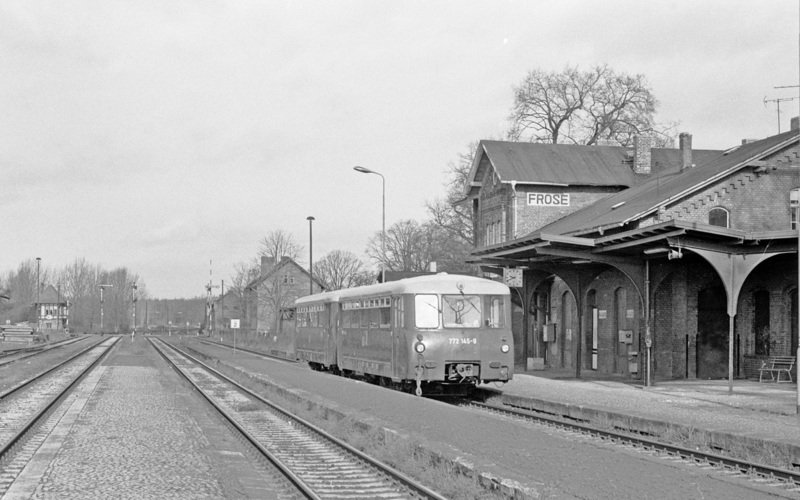 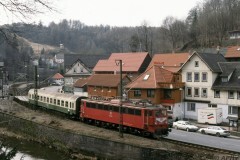 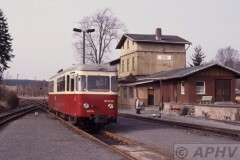 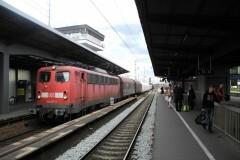 Rosslau stearing car at the platform. 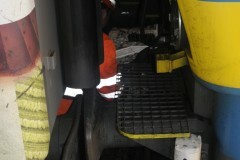 Then the women driver asked if it was still there? 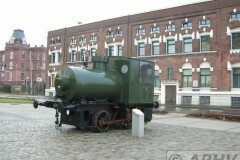 Rosslau; a closer look and indeed it was still there althuogh killed by the hit. 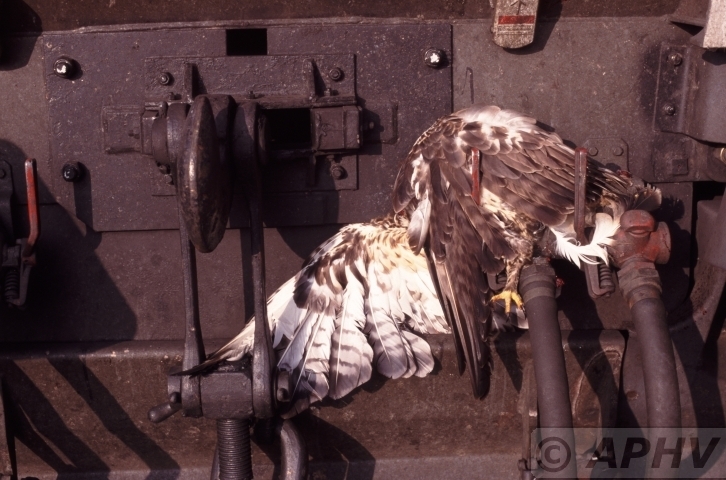 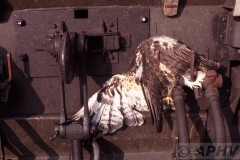 The “Buizerd” or `Bussard` in German, must have been circling over the farm land and tracks when the silent stearing couch off the electric train stopped its hunt, Beautuful coulors on its once mighty wings. 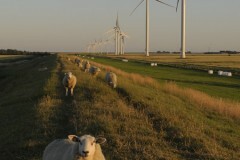 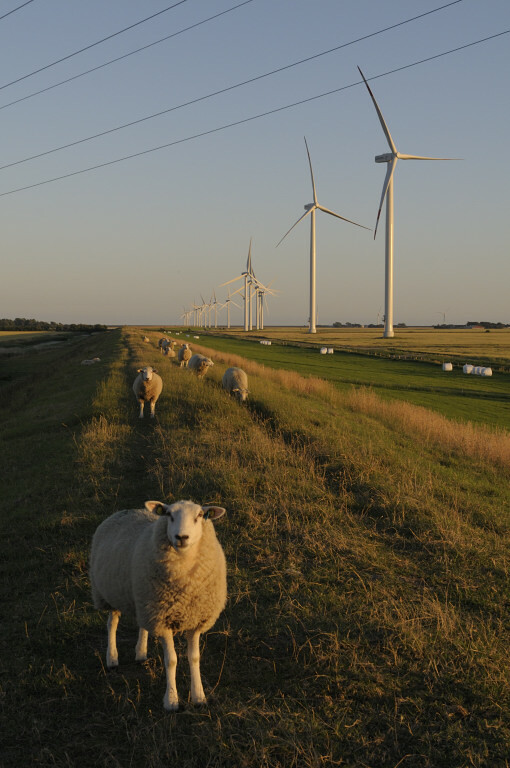 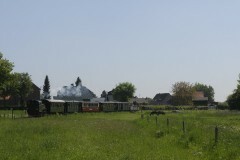 Through farmland and along side the local main road. 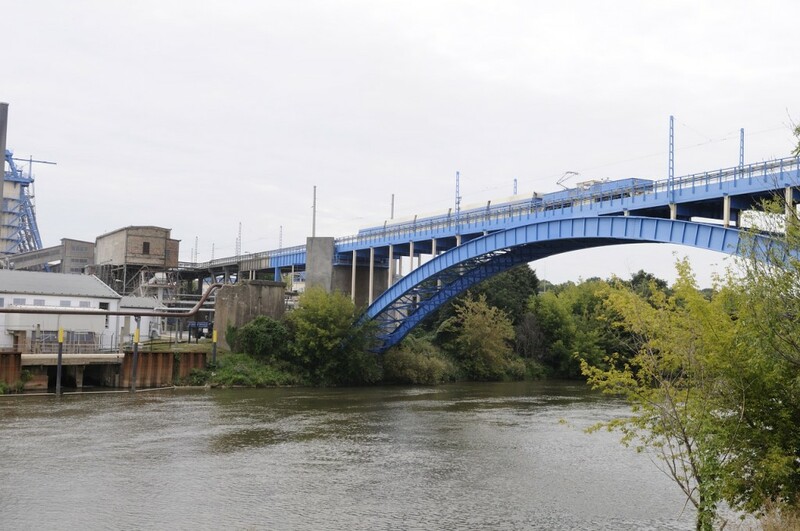 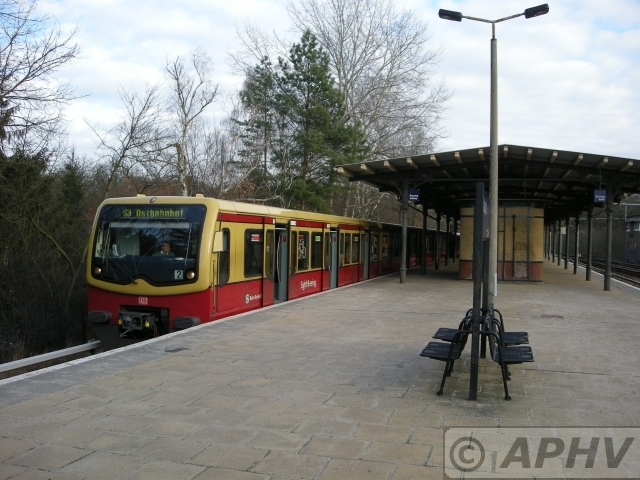 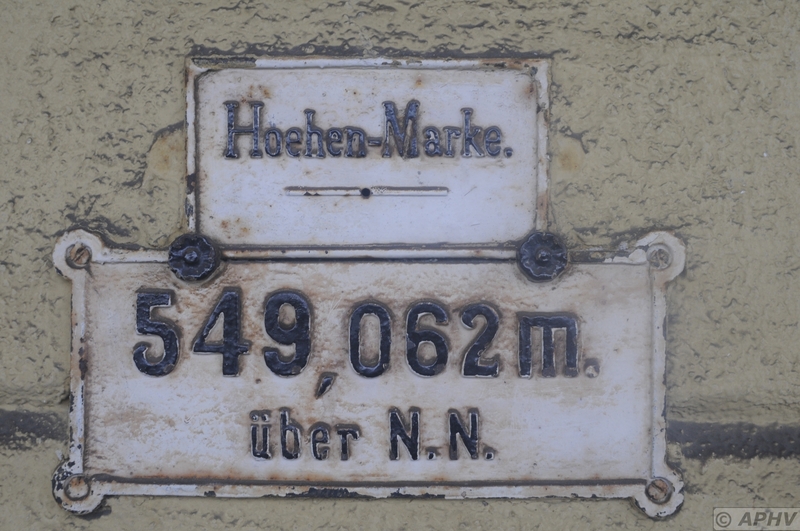 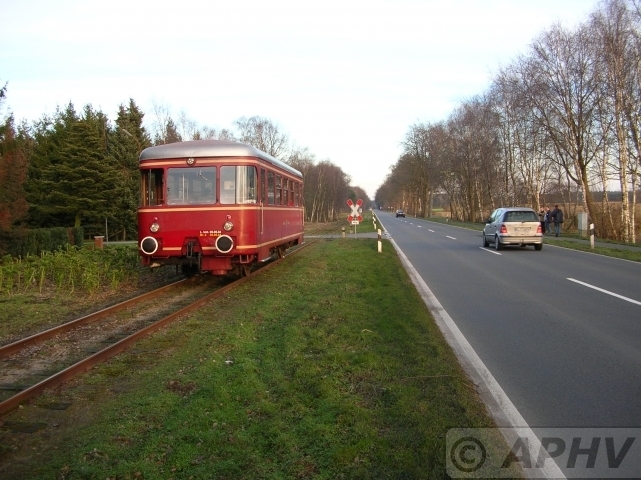 This is how this former Hummlinger Kreisbahn line runs. 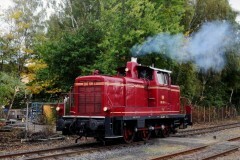 Operated by the Emsländisch Eisenbahn their even has been some maintenance on some bad sections. 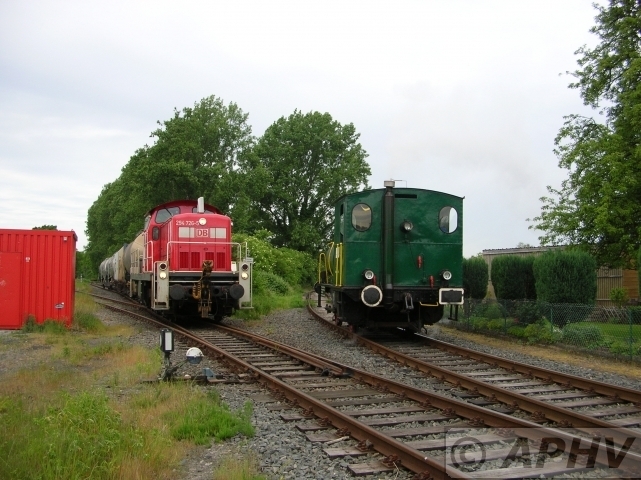 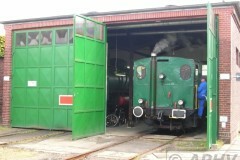 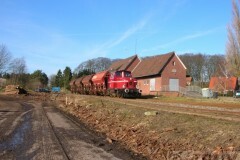 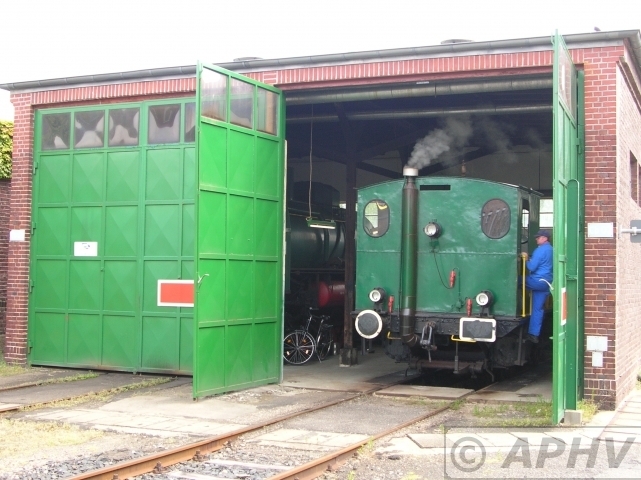 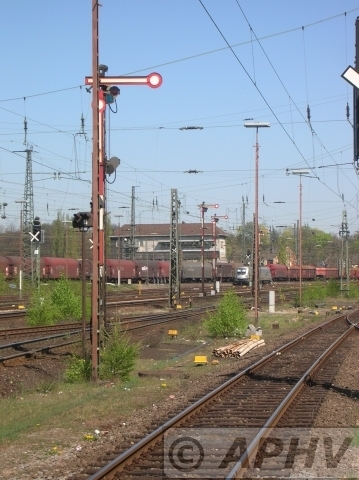 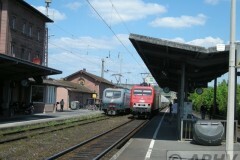 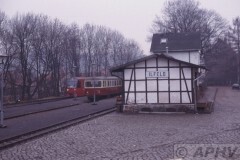 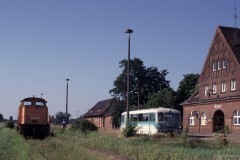 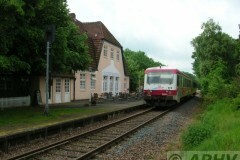 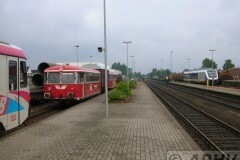 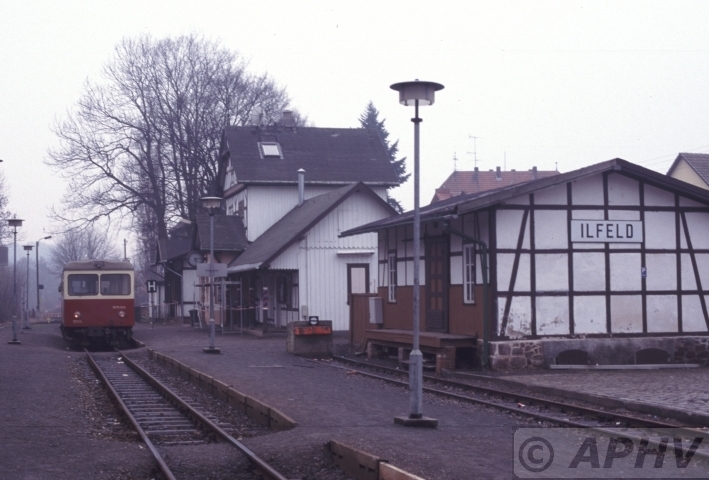 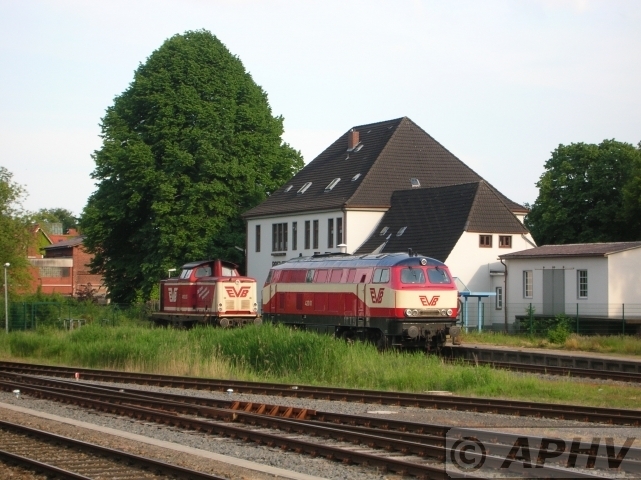 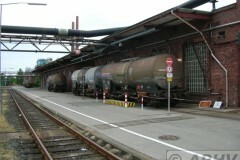 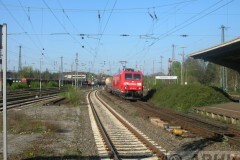 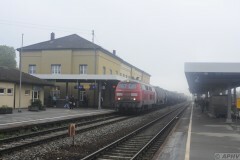 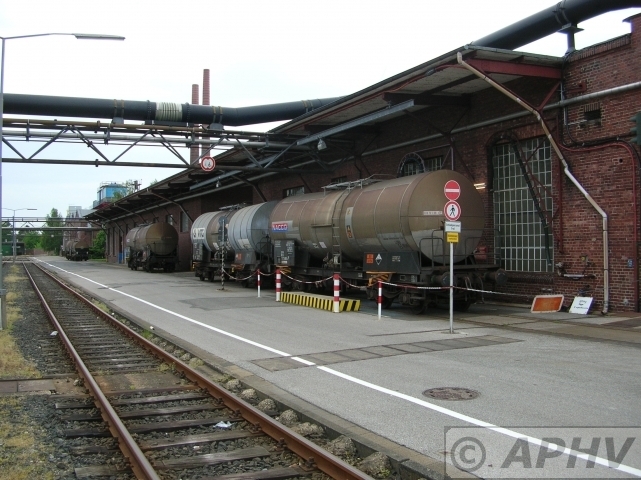 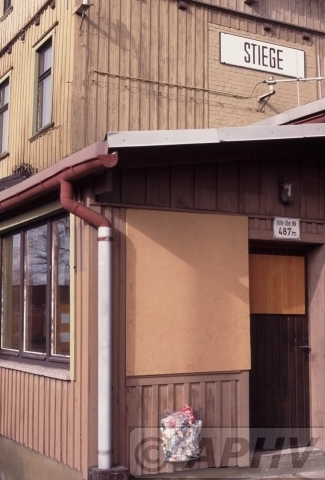 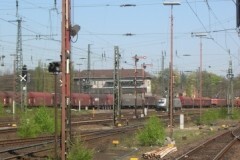 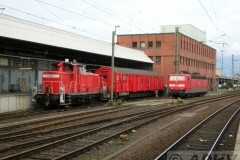 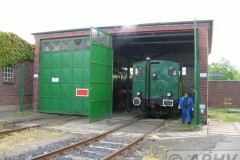 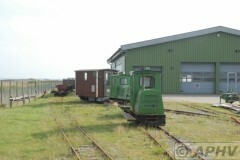 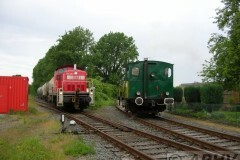 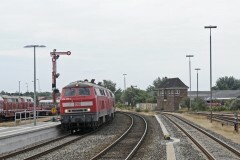 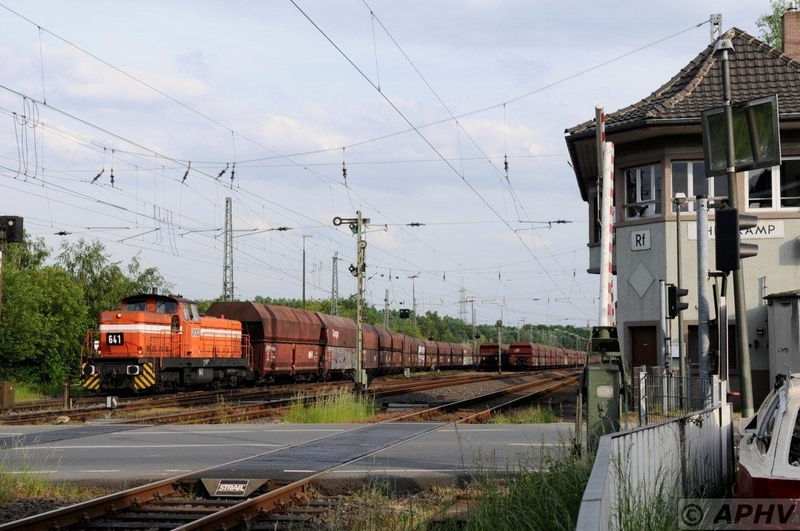 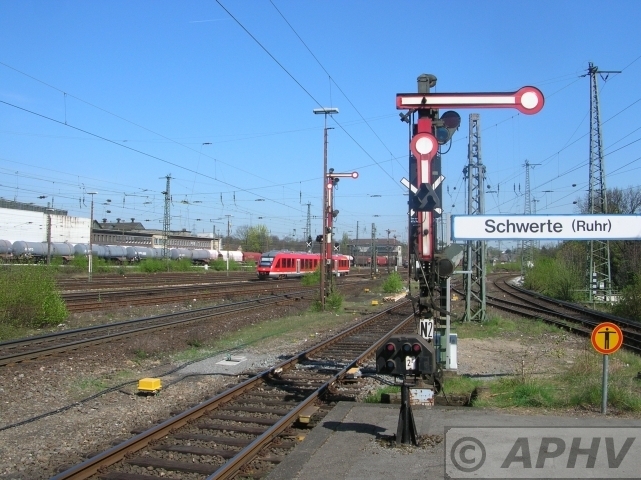 Sögel and Werlte still have their original station buildings and a simple 4 to 5 track yard. 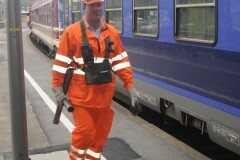 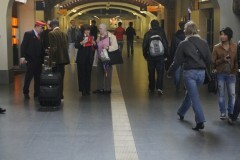 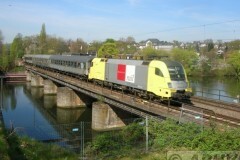 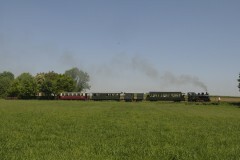 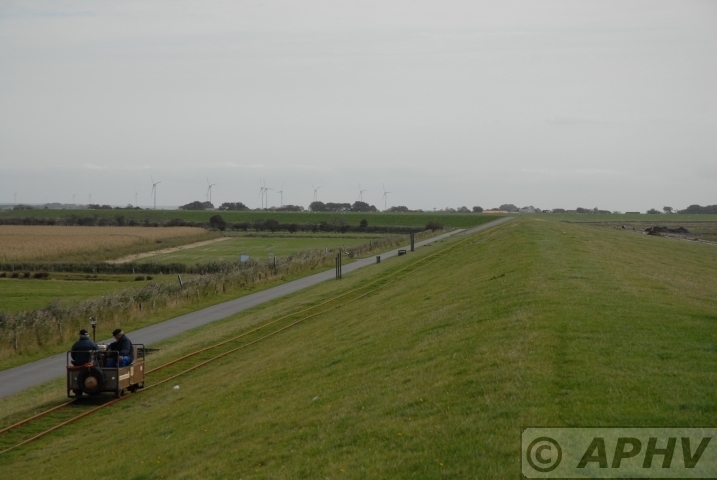 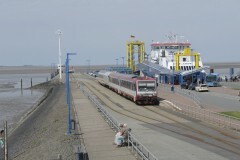 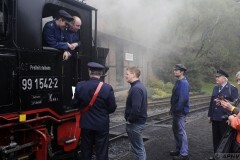 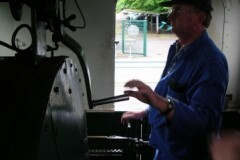 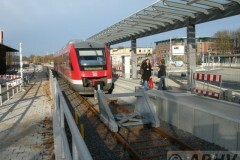 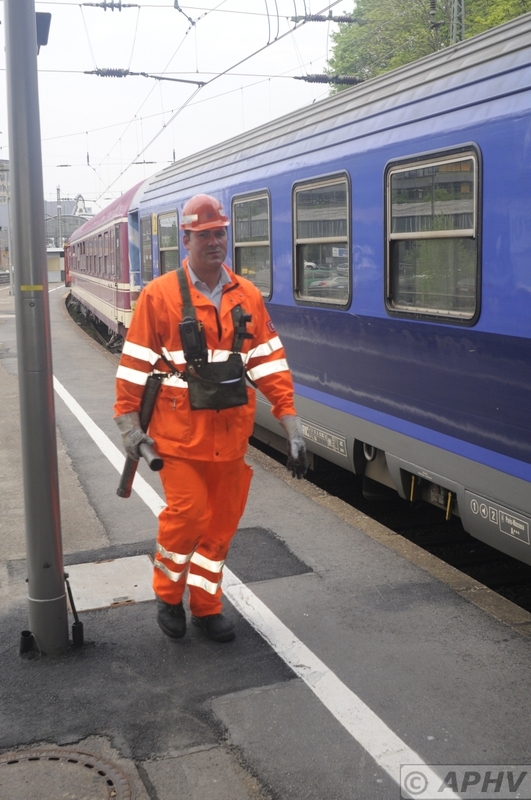 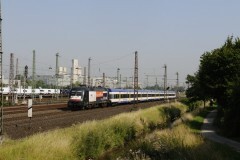 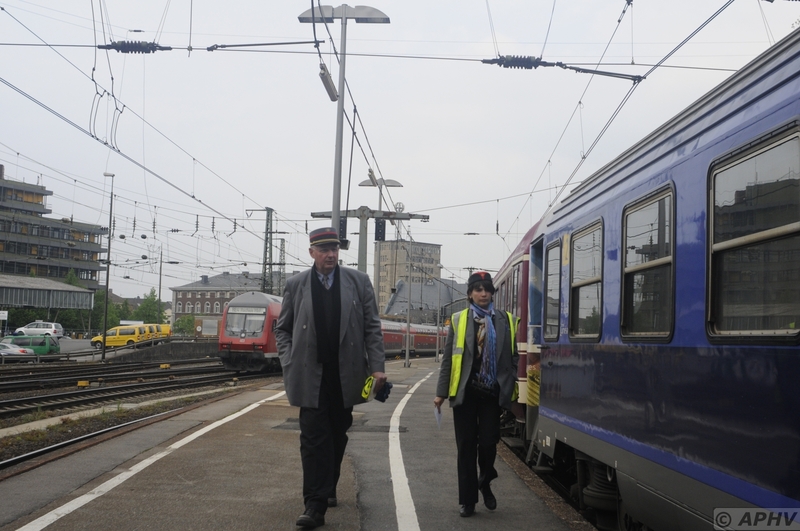 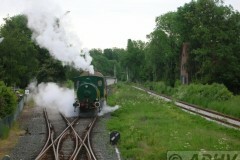 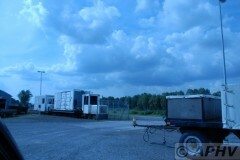 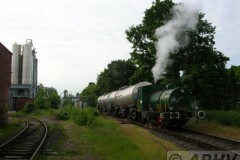 Today at 2011 the line seems to be closed due to lack of maintanance on the track. 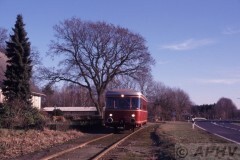 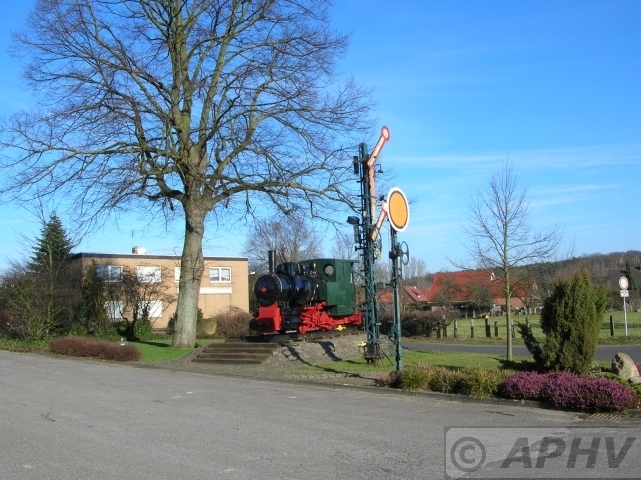 5 Februar 2005 Talbot T1 at Werlte Bhf. 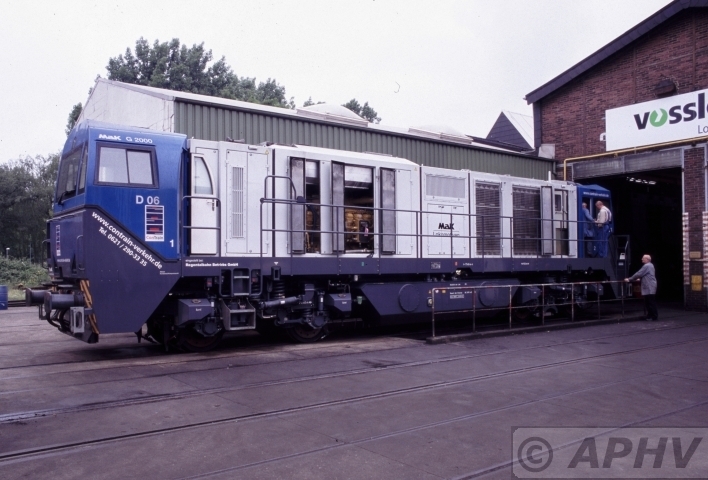 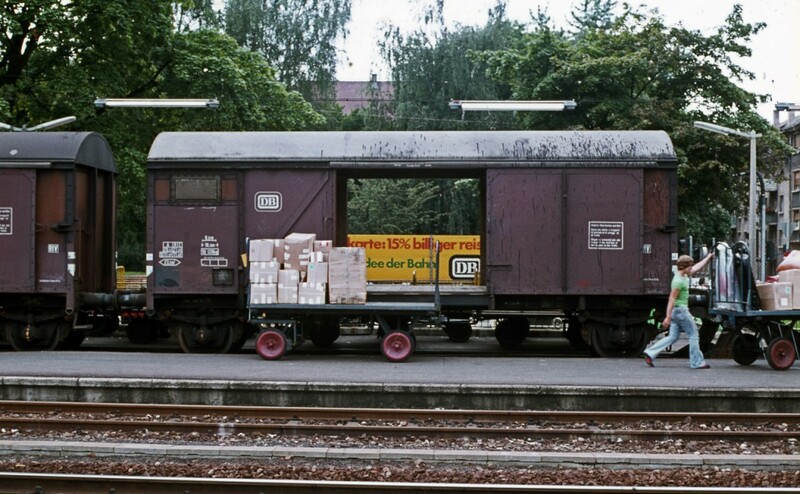 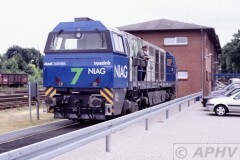 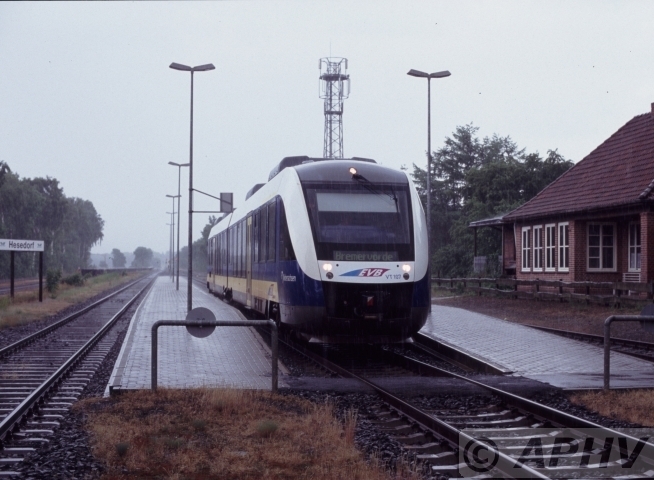 2 August 1997 DB219-152 just arrived in Basdorf. Kbs 20027. 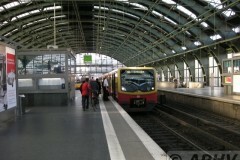 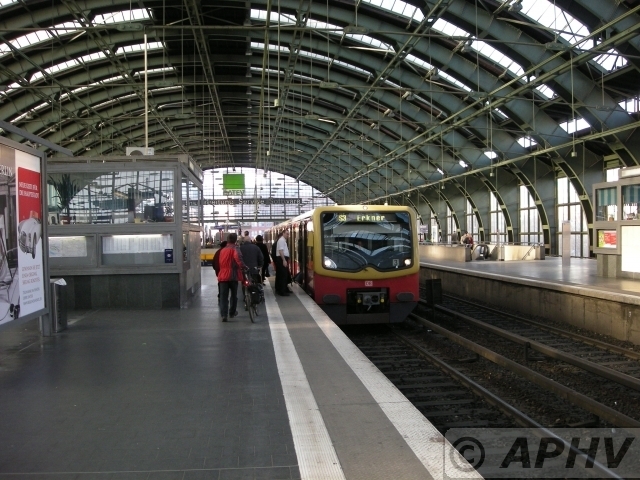 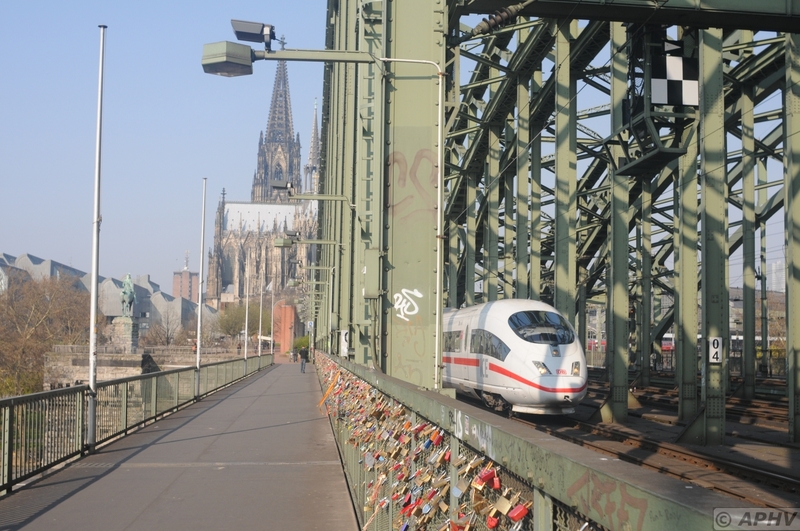 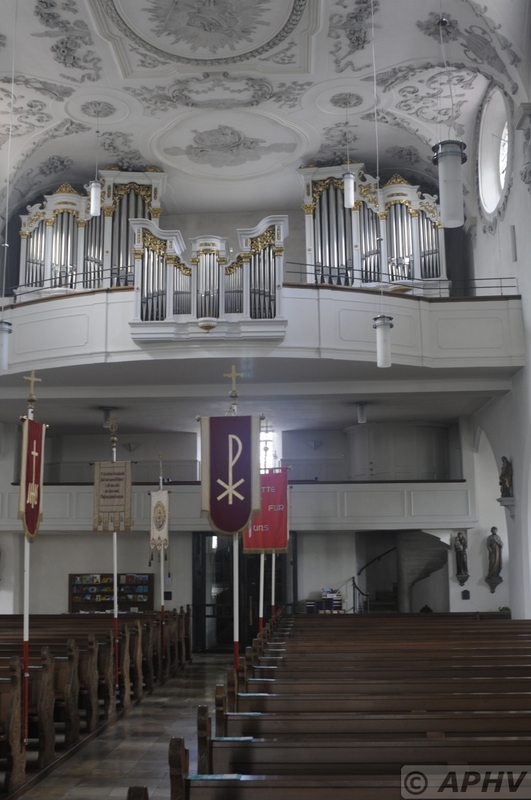 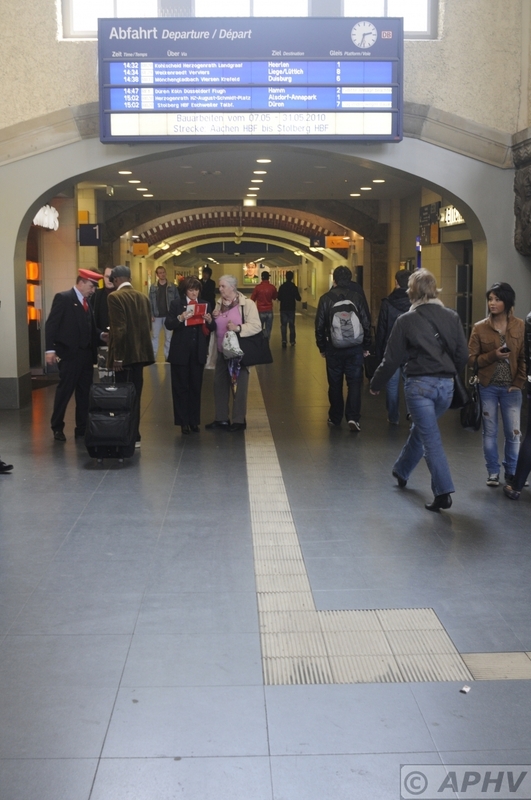 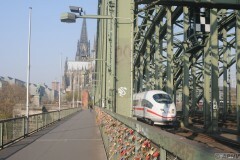 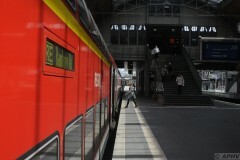 About one hour by S Bahn and train from the hart of reunited Berlin. 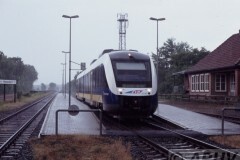 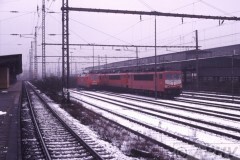 14 December 2002 at Dorsten with DB640-027 train number Rb72233 to Dortmund.